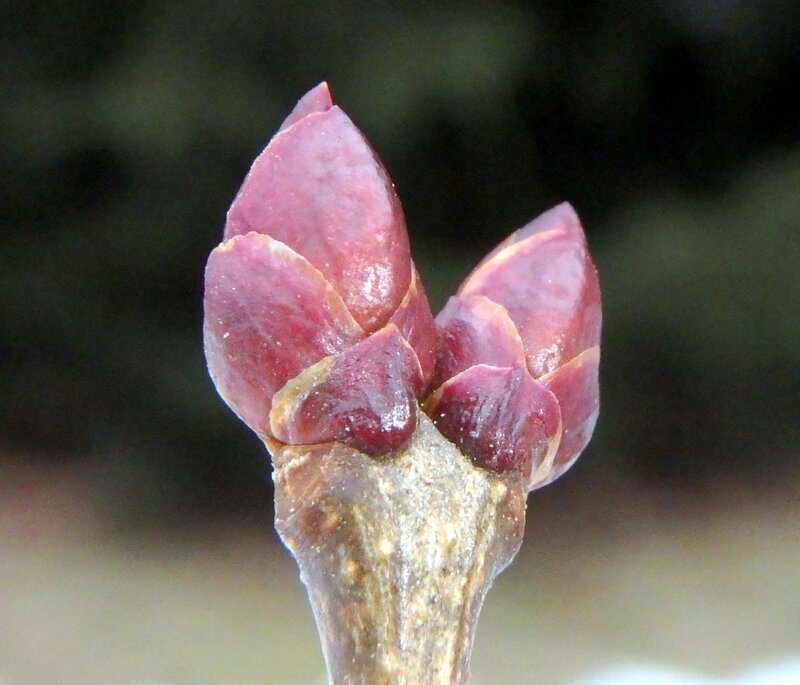 I’ve spent many winters watching the buds of trees and bushes, especially those right around my house like the lilac (Syringa vulgaris) in the above photo. I check it regularly starting in February for signs of swelling. 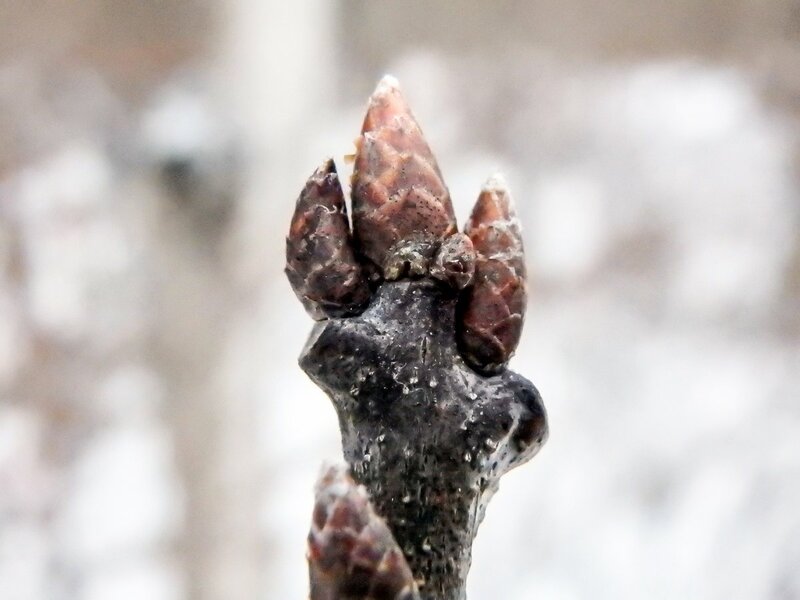 In winter buds are my connection to spring and I love watching the bud scales finally open to reveal tiny leaves or flowers. 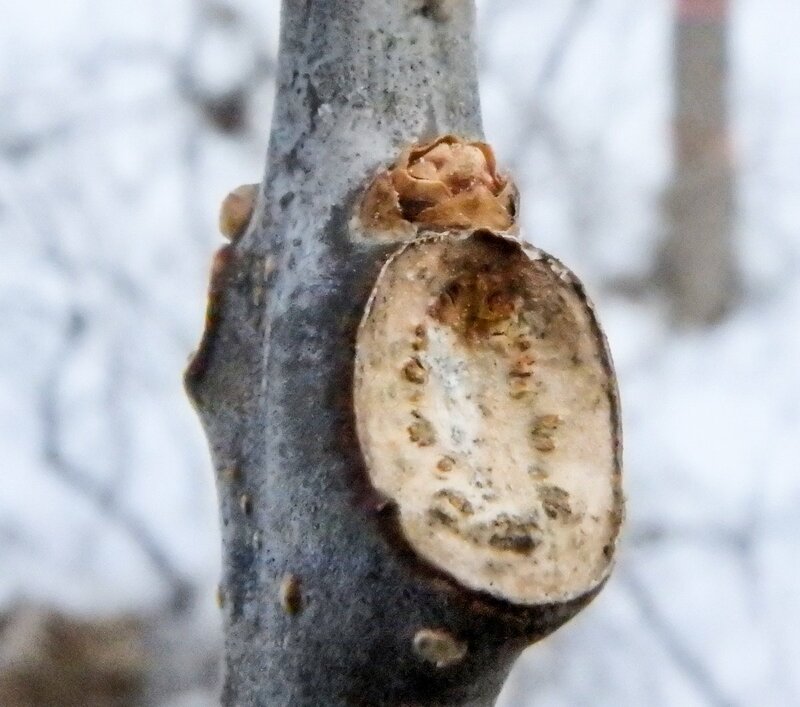 Bud scales are modified leaves that cover and protect the bud through winter. Some buds can have several, some have two, some have just one scale called a cap, and some buds are naked, with none at all. 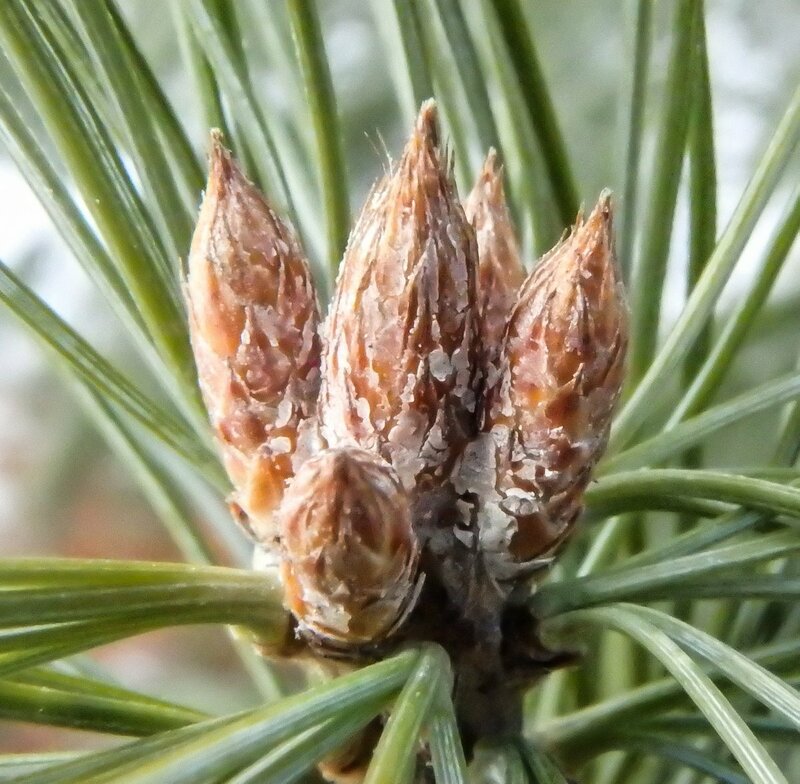 Buds that have several scales are called imbricate with scales that overlap like shingles. A gummy resin fills the spaces between the scales and makes the bud waterproof. 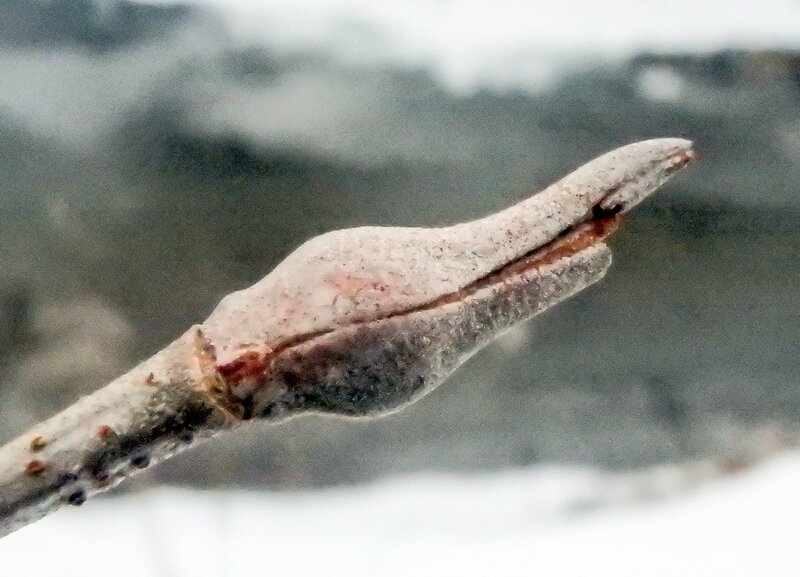 This is especially important in cold climates because water freezing inside the bud scales would destroy the bud. 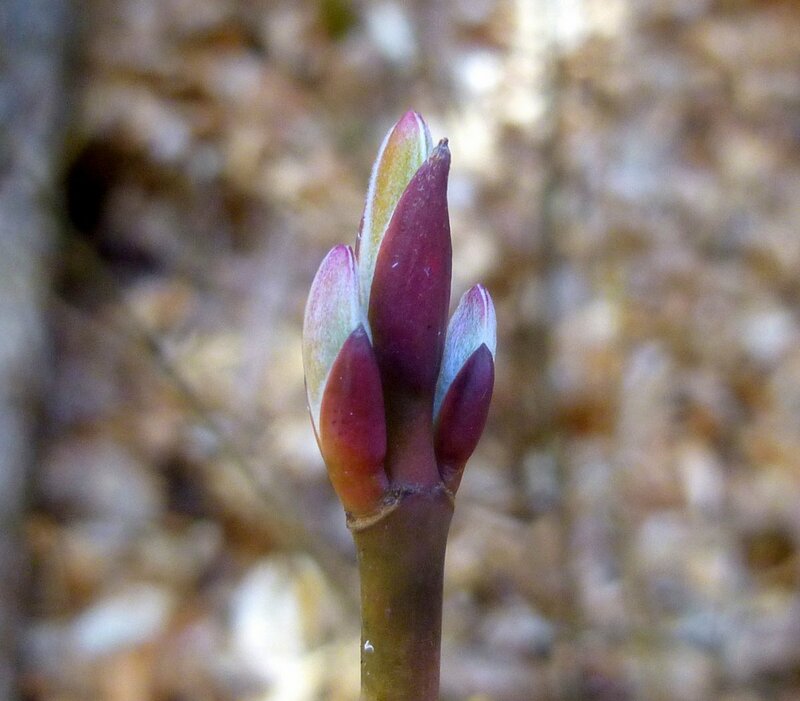 The lilac bud above is a good example of an imbricate bud. 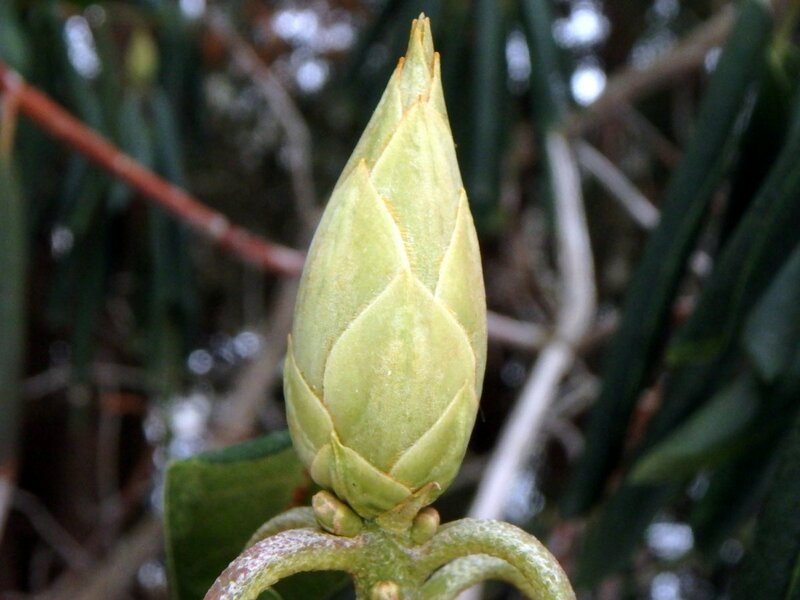 For those who can’t see or don’t want to look at small buds like lilacs fortunately there are big buds on plants like rhododendron. It also has imbricate buds. 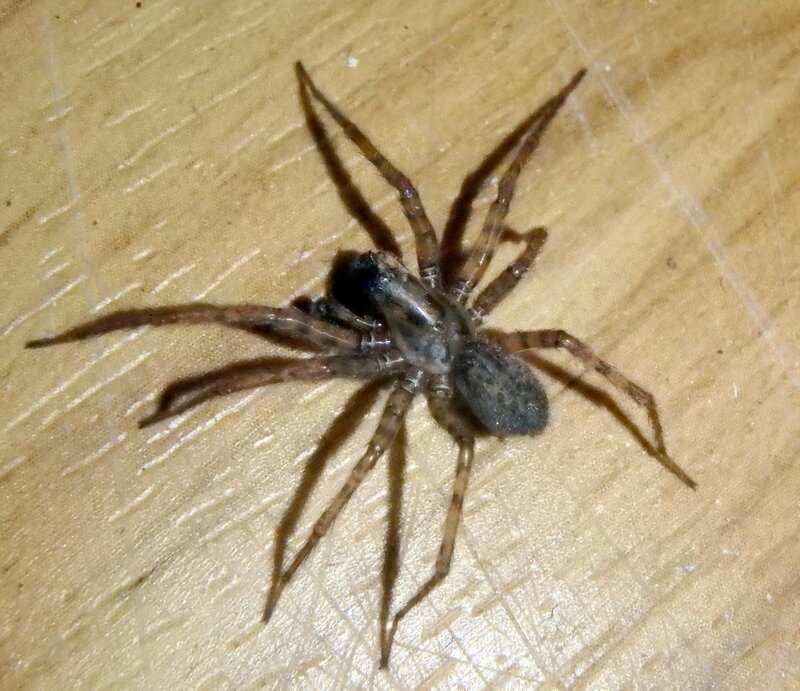 This one was half the length of my thumb. Buds with just two (sometimes three) scales are called valvate. The scales meet but do not overlap. 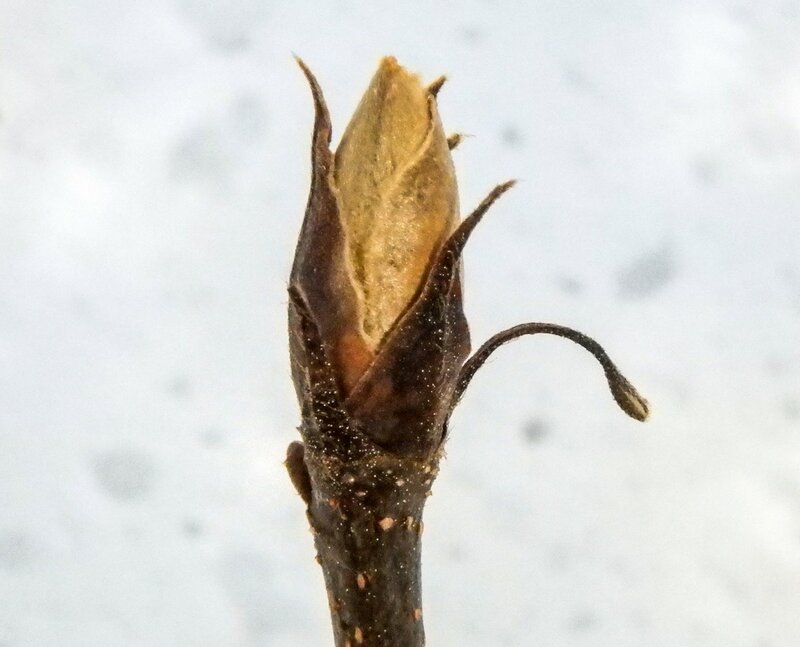 This Cornelian cherry bud is a great example of a valvate bud. 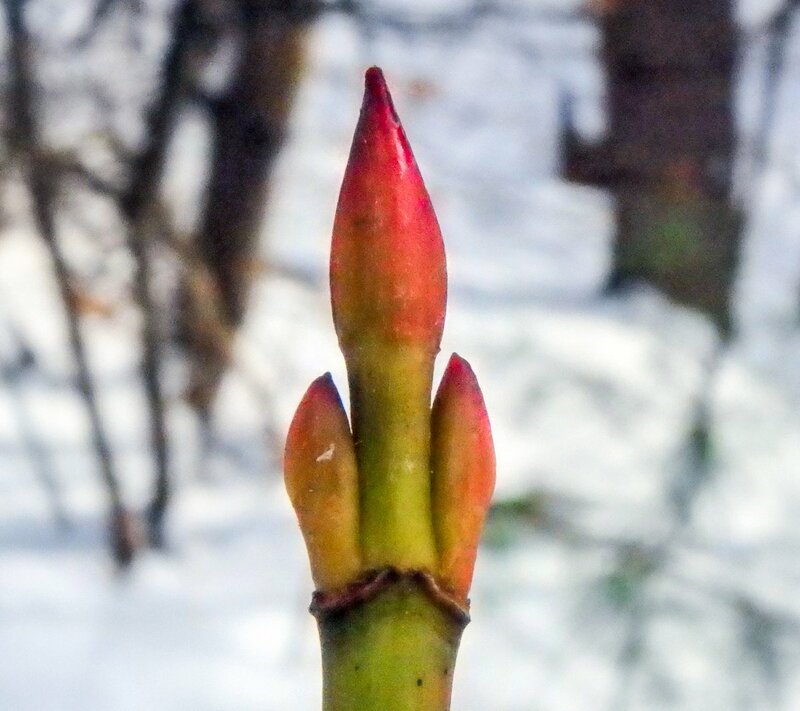 In the spring when the plant begins to take up water through its roots the buds swell and the scales part to let the bud grow. 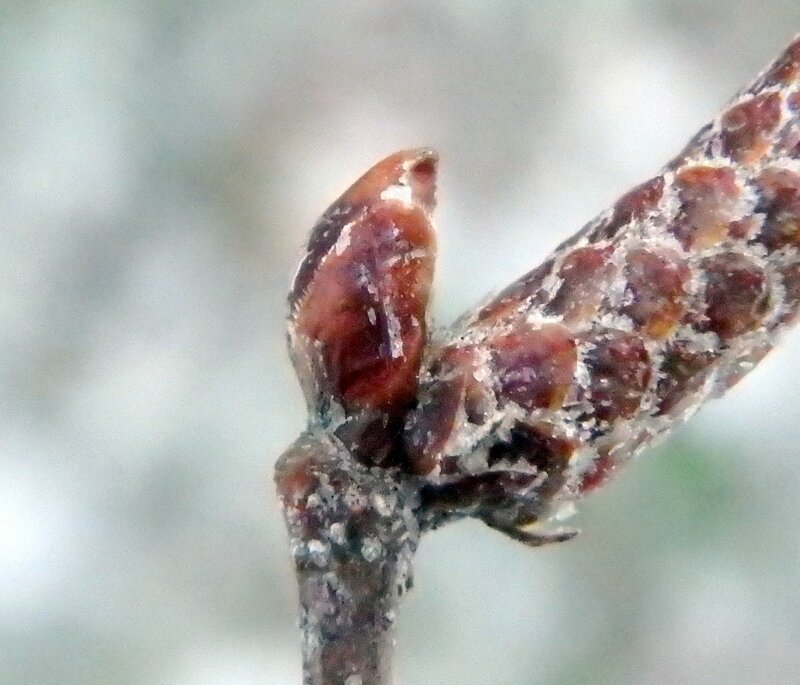 Some bud scales are hairy and some are covered with sticky resin that further protects the bud. I was surprised to see the bud scales on this example opening already. 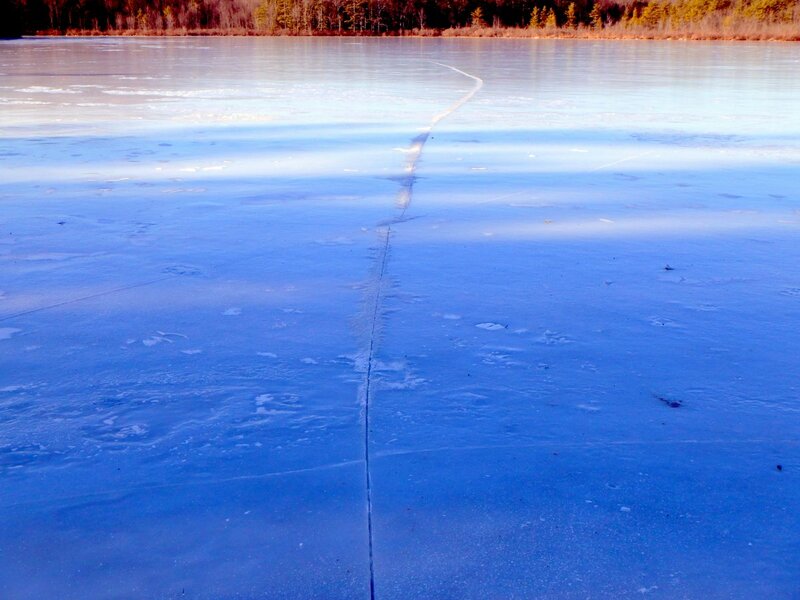 We can still get below zero cold. 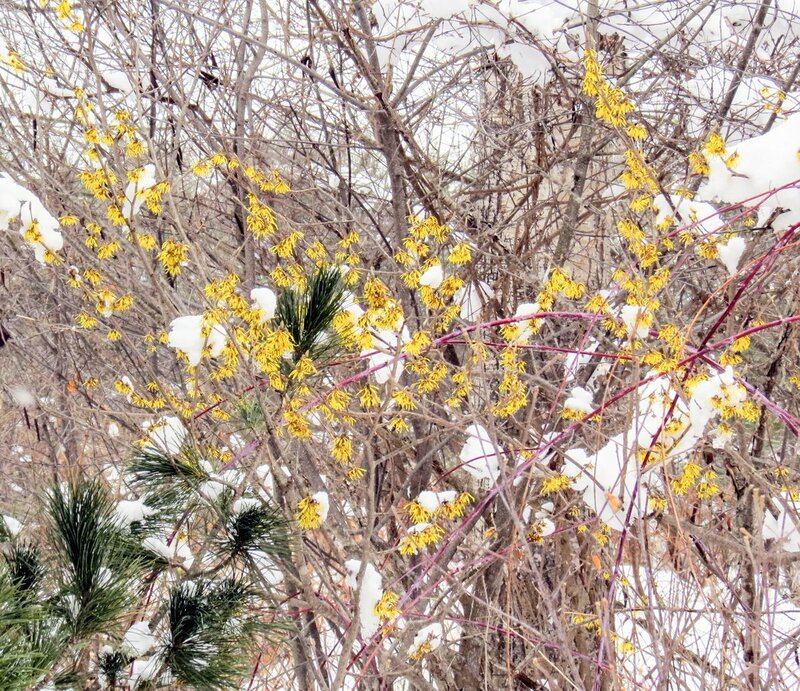 Cornelian cherry (Cornus mas) is an ornamental flowering shrub related to dogwoods. 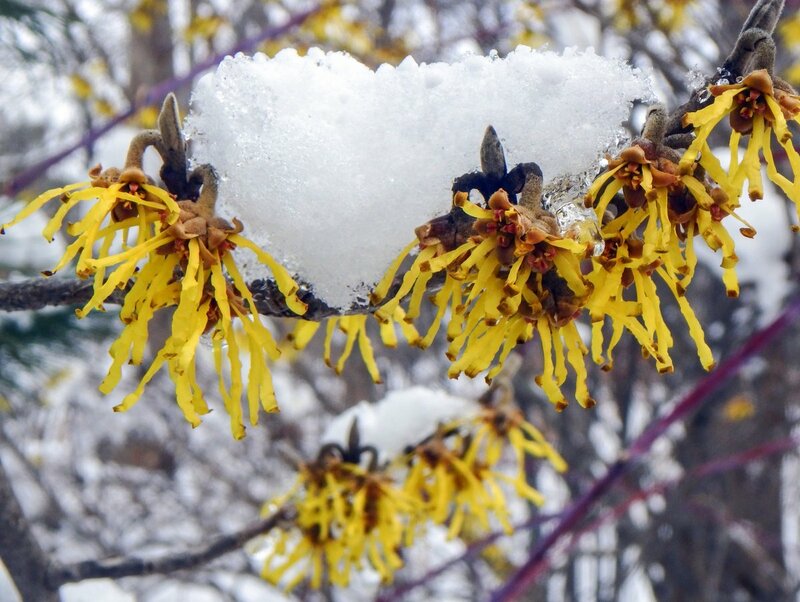 It blooms in early spring (in March) with clusters of blossoms that have small, bright yellow bracts. 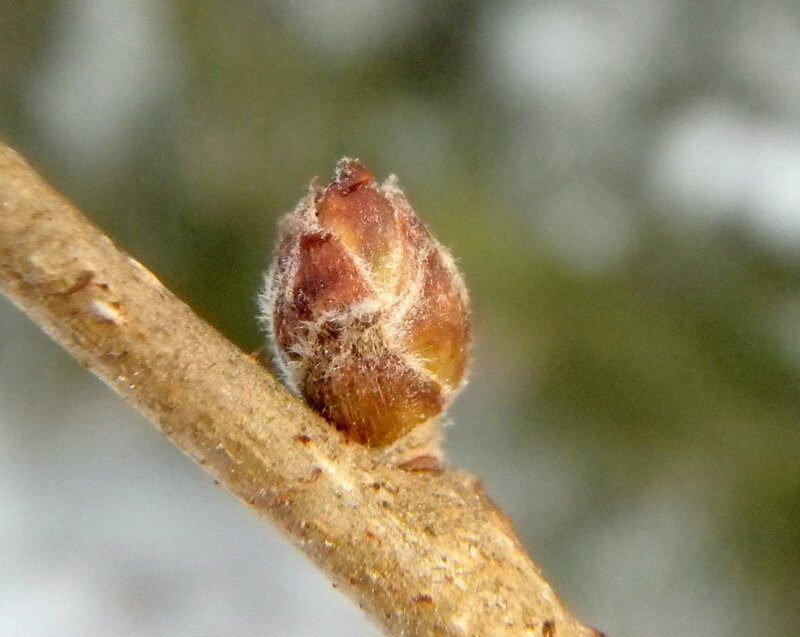 Native nannyberry buds (Viburnum lentago) are also examples of valvate buds. 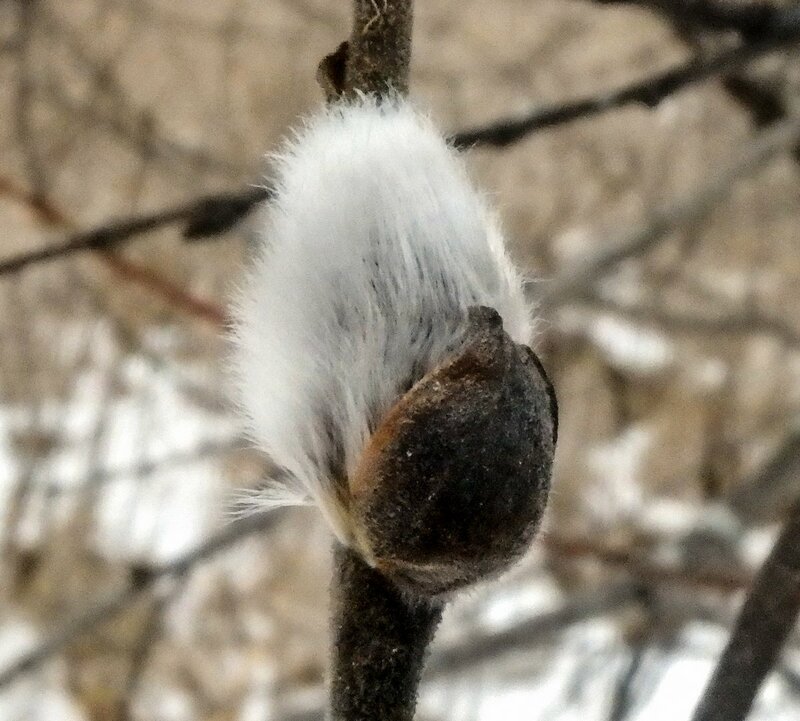 These buds always remind me of great blue herons or cranes. The bottom bud scale was broken on this one. Nannyberry is another of our native viburnums but unlike many of them this shrub produces edible fruit. 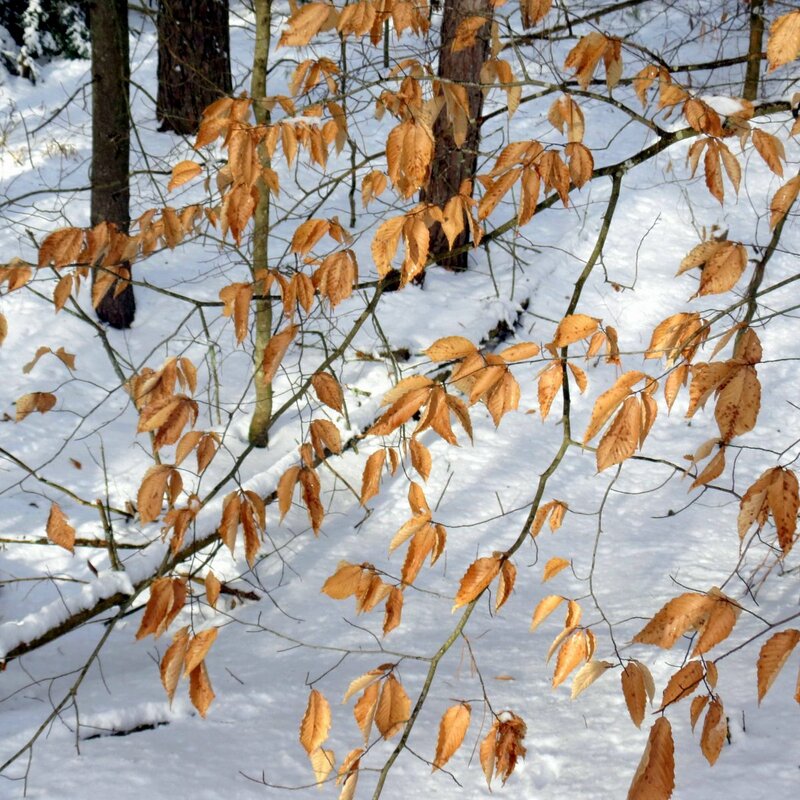 Native Americans ate them fresh or dried and used the bark and leaves medicinally. 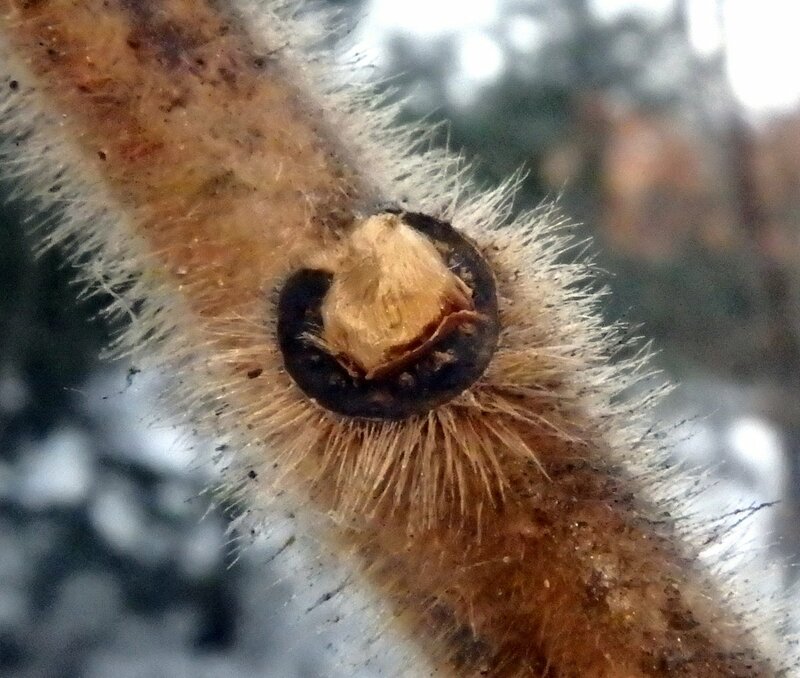 Staghorn sumacs (Rhus typhina) have no bud scales so their naked buds are hairy and the hairs protect the bud. Another name for staghorn sumac is velvet tree, and that’s exactly what its branches feel like. 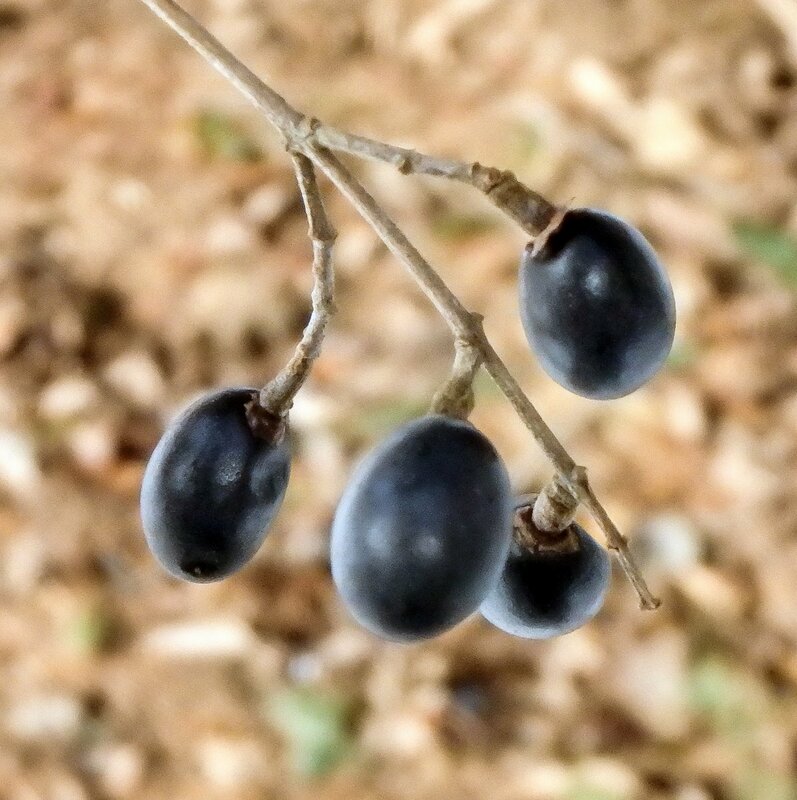 Native Americans made a drink from this tree’s berries that tasted just like lemonade, and grinding the berries produces a purple colored, lemon flavored spice. 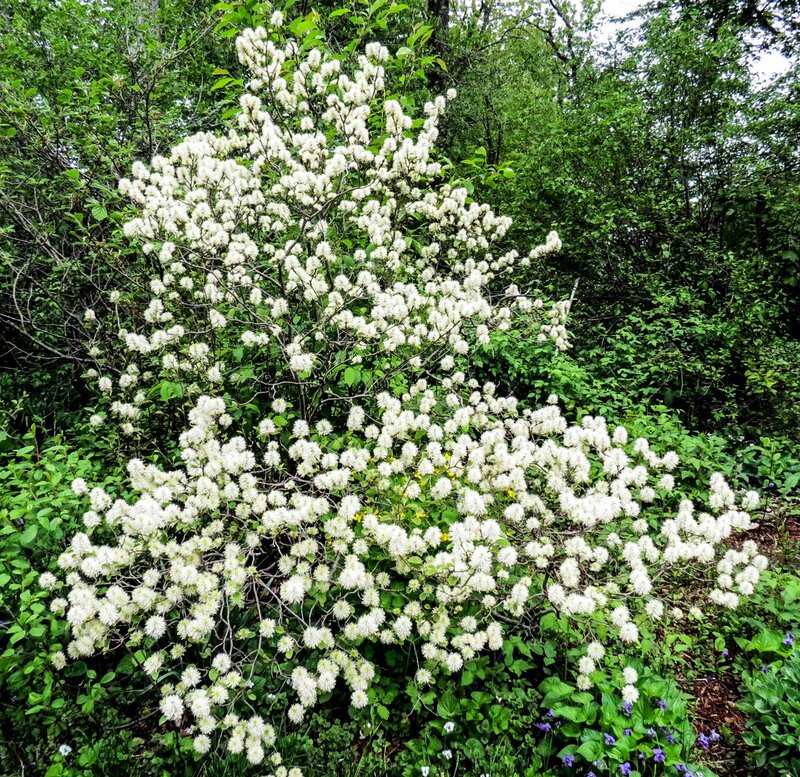 Hobblebush (Viburnum lantanoides) is another native shrub with naked buds. 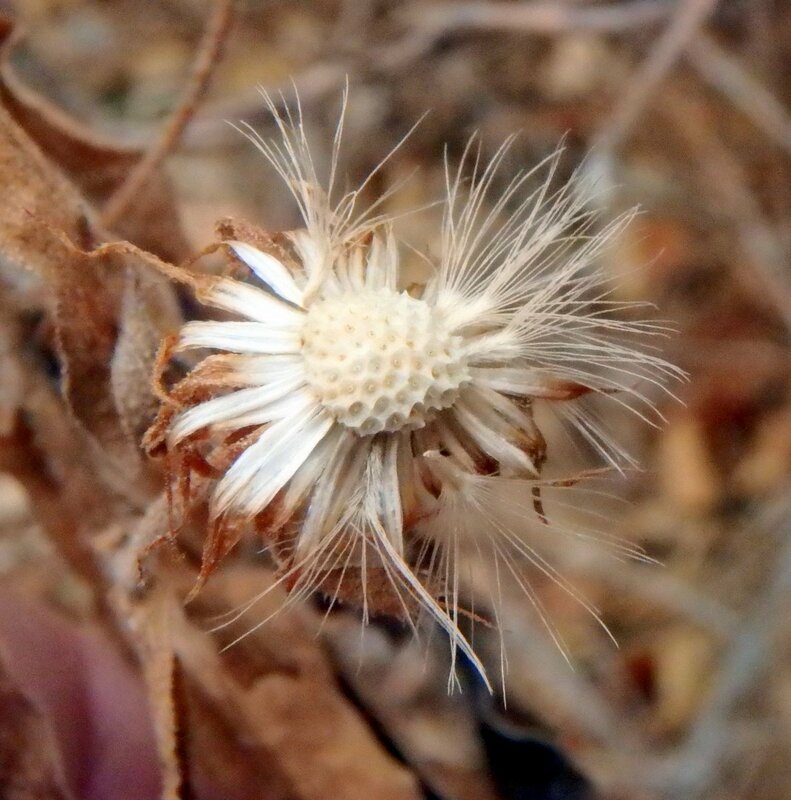 This photo shows that the flower bud in the center and the two leaf buds on either side are clothed more in wool than hair, but there are no scales for protection. Still, they come through the coldest winters and still bloom beautifully each spring. 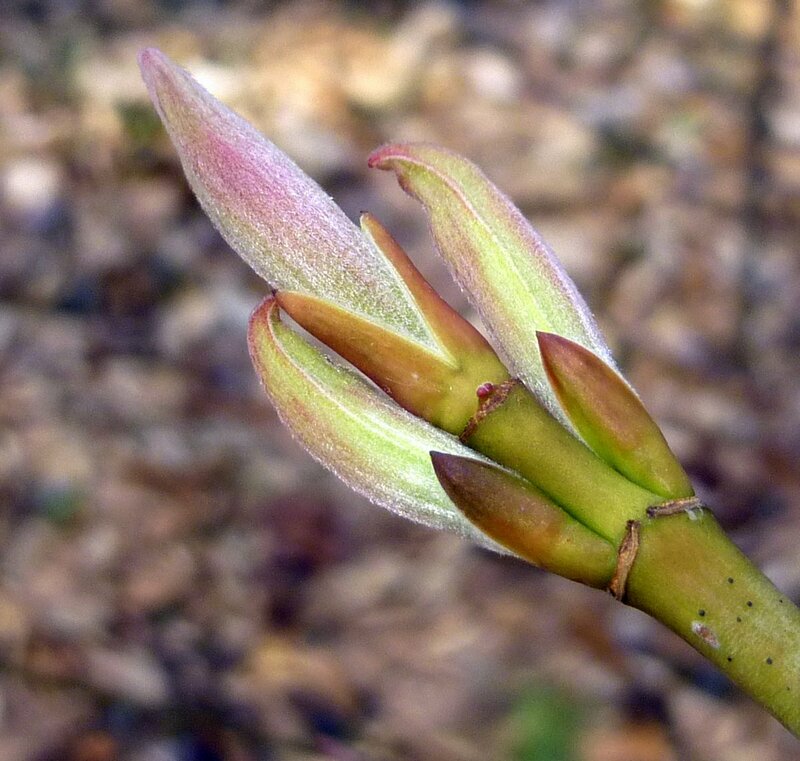 Magnolia flower buds in botanical terms are “densely pubescent, single-scaled, terminal flower buds,” which means that instead of using scales or hairs they use both. 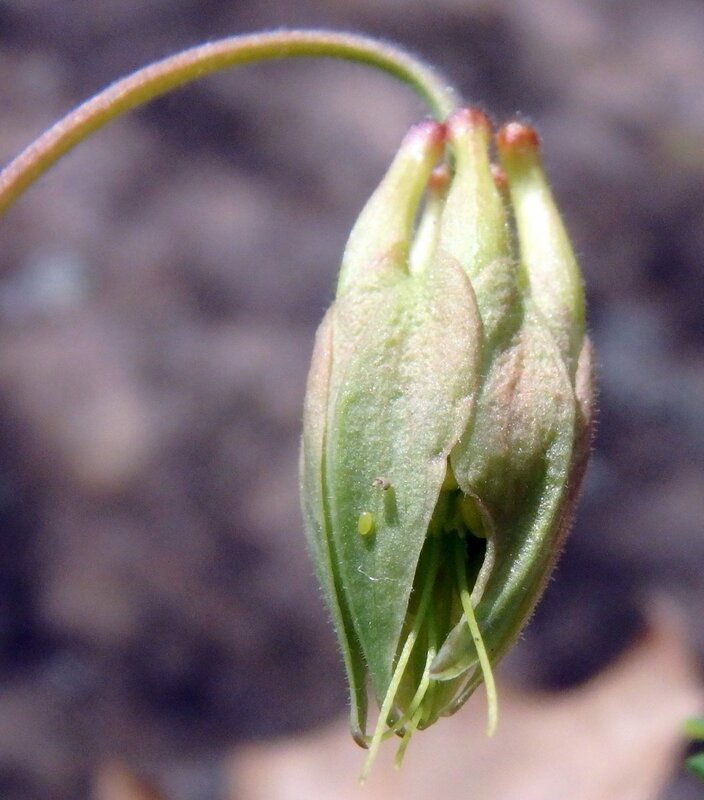 The hairy single scale is called a cap and it will fall off only when the bud inside has swollen to the point of blossoming. Meanwhile, the bud stays wrapped protectively in a fur coat. 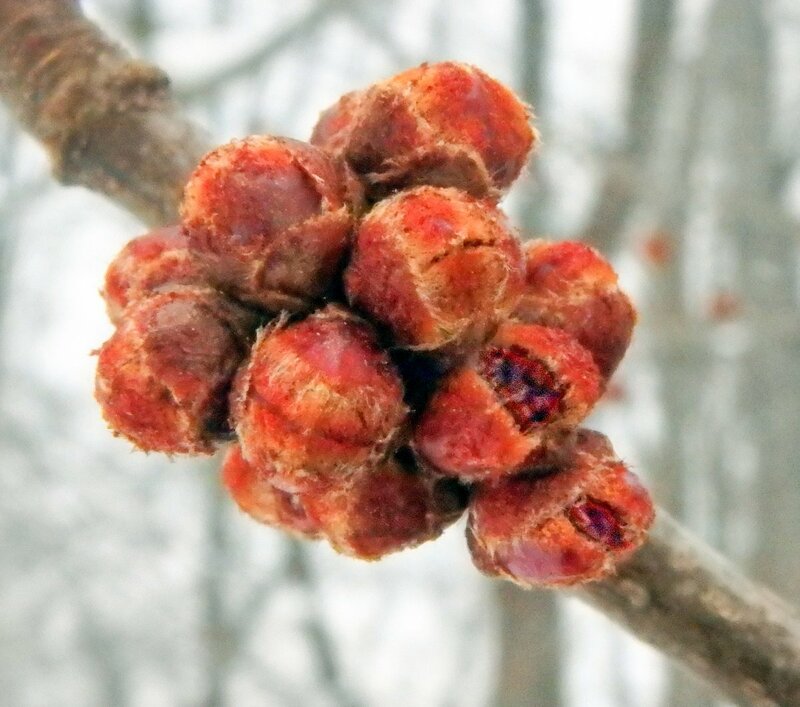 Red oak (Quercus rubra) buds usually appear in a cluster and are conical and reddish brown. I like the chevron like pattern that the bud scales make. 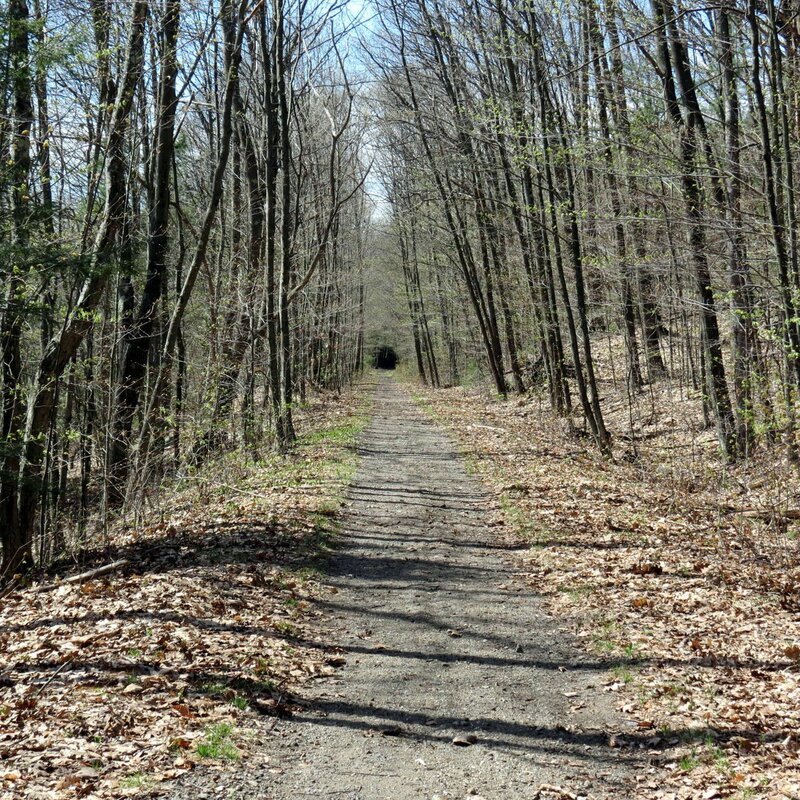 Red oak is one of our most common trees in New England but in the past many thousands were lost to gypsy moth infestations. 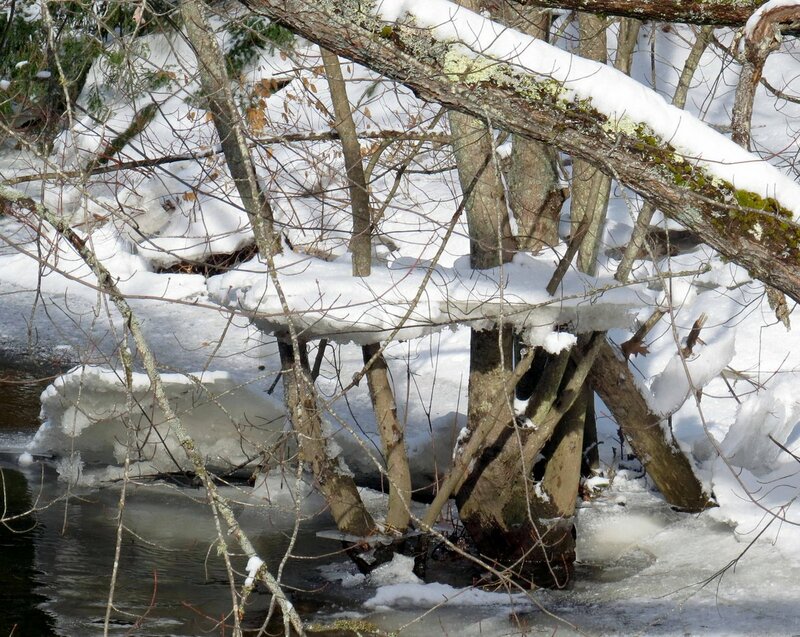 It is an important source of lumber, flooring and fire wood. 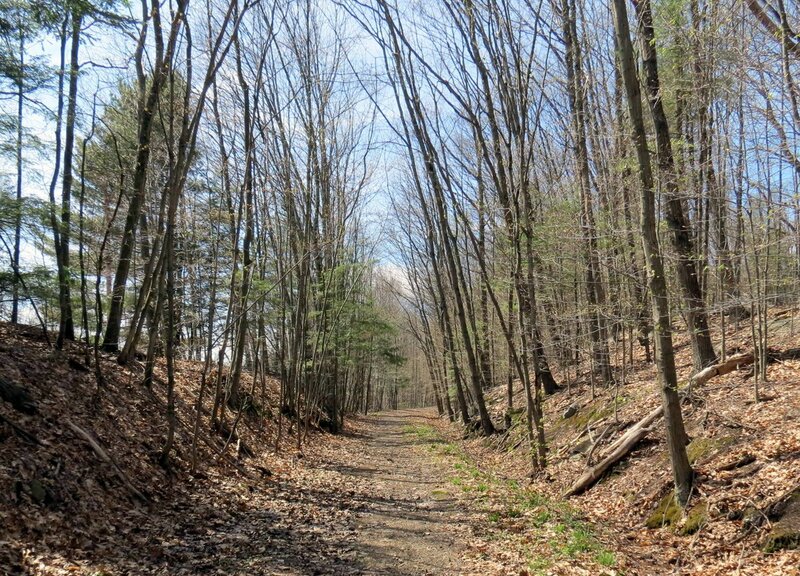 The USDA says that red oaks can live to be 500 years old. 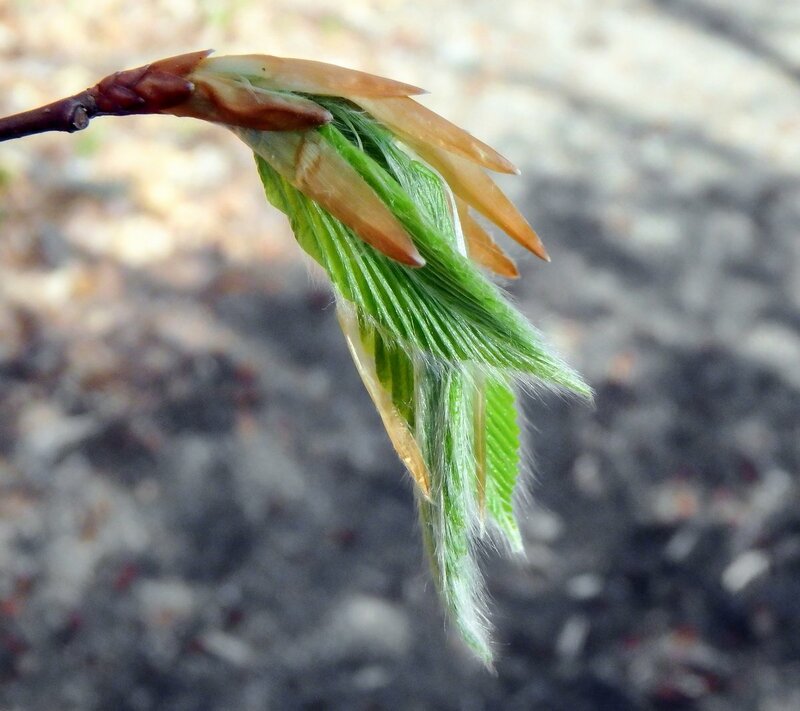 Terminal buds appear on the end or terminus of a branch and nothing illustrates that better than the sugar maple (Acer saccharum.) 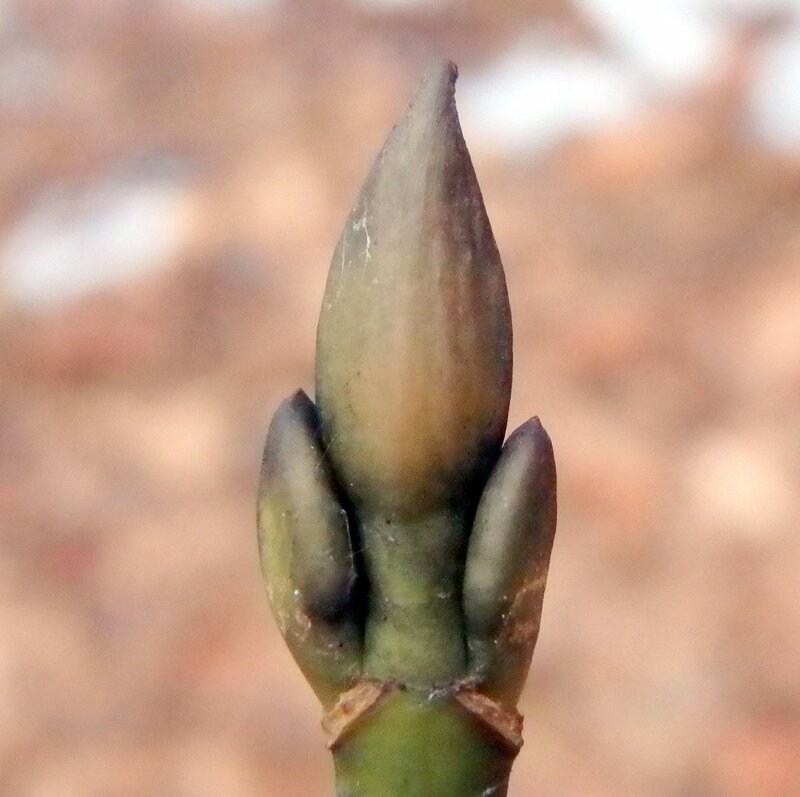 The large, pointed, very scaly bud is flanked by smaller lateral buds on either side. 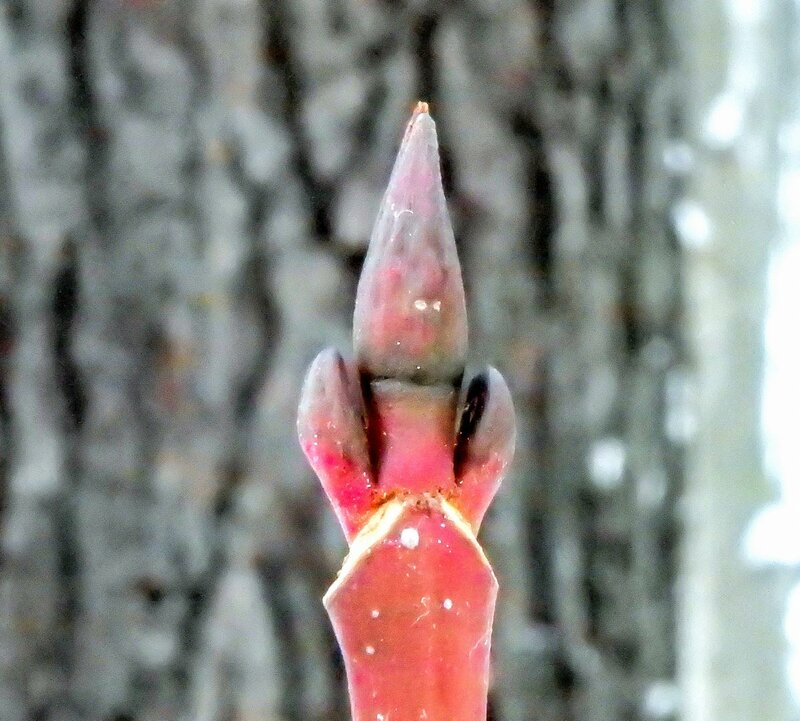 The lateral buds are usually smaller than the terminal bud. 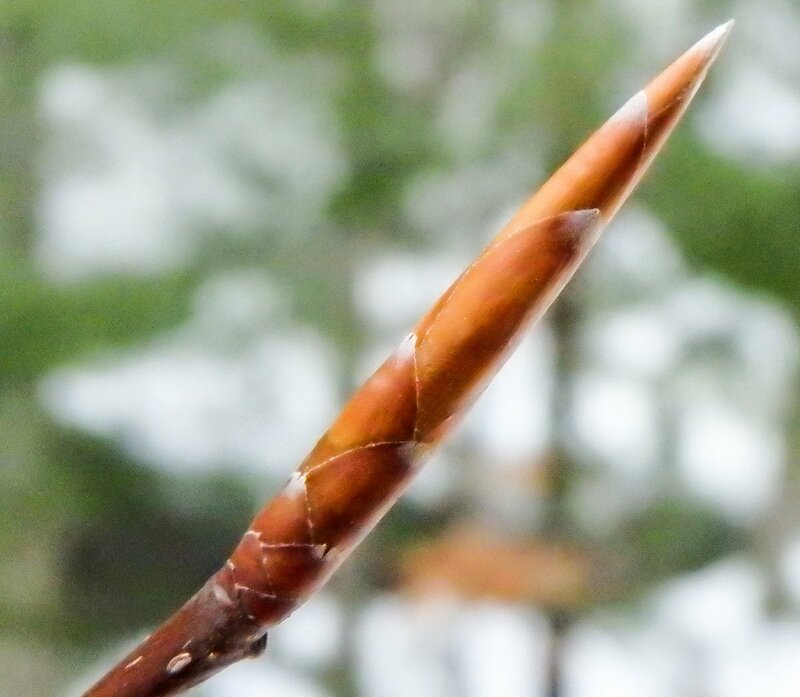 Sugar maple twigs and buds are brown rather than red like silver or red maples. 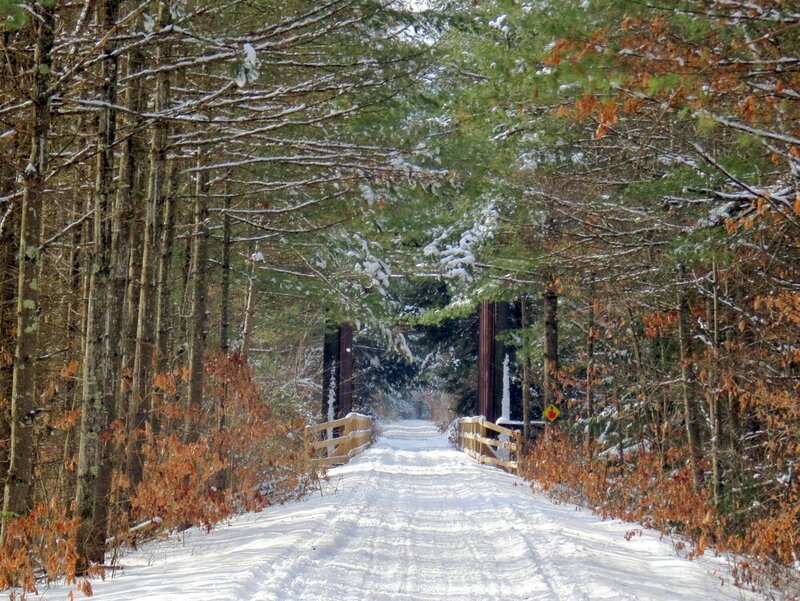 In 2016 New Hampshire produced 169,000 gallons of maple syrup but the season only lasted through the month of March due to the warm weather. The average cost per gallon in 2015 was $59.40. I’m guessing it went up in 2016. 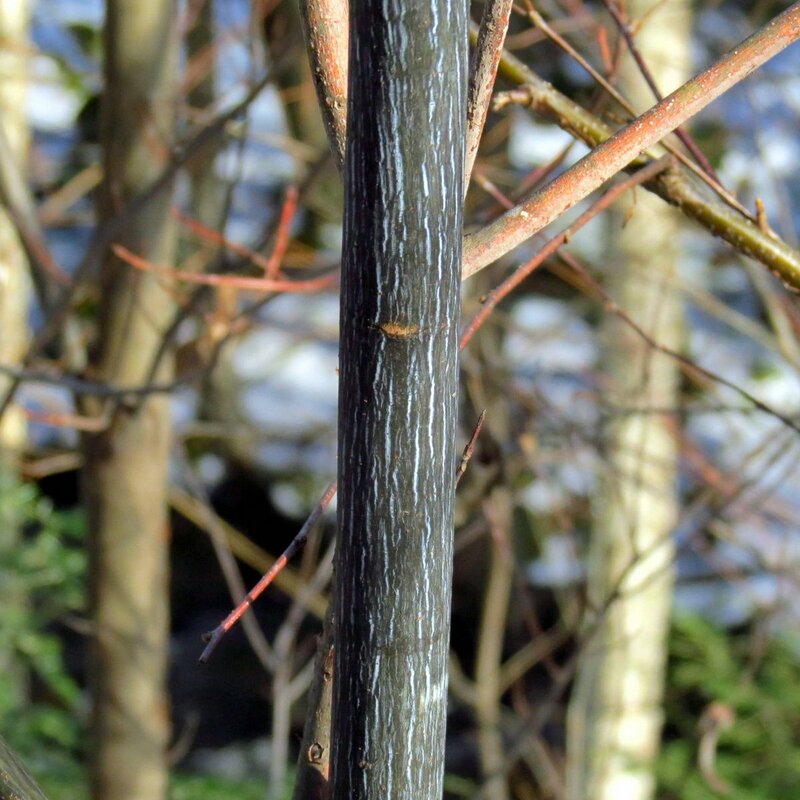 Striped maples (Acer pensylvanicum) have colorful twigs and buds and are among the easiest trees to identify no matter what time of year because of the green and white vertical stripes on their bark. 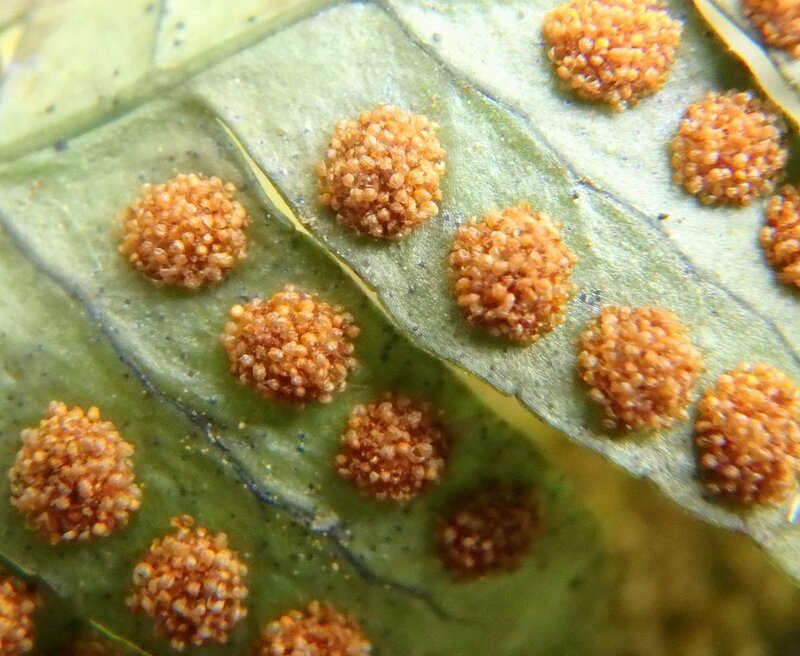 Their terminal buds have two scales and are valvate like the nannyberry buds. 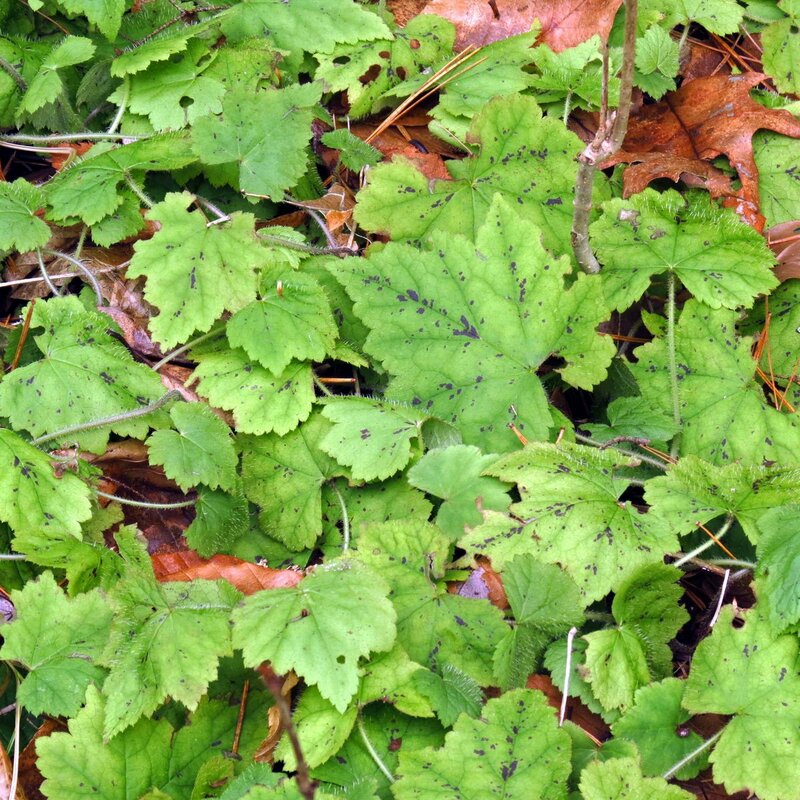 Striped maple is very fussy about where it grows and will not stand pollution, heat, or drought. 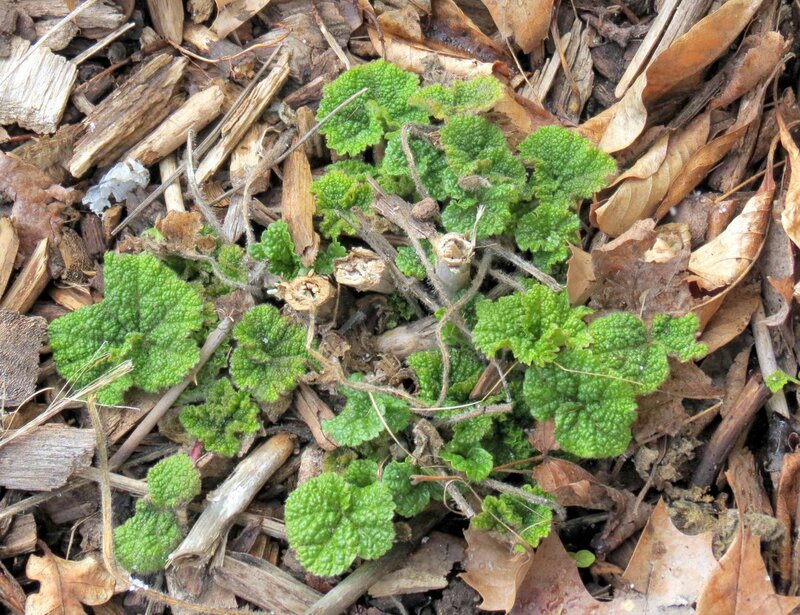 It likes cool, shady places with sandy soil that stays moist. They bloom in June and have very pretty green bell shaped blossoms. 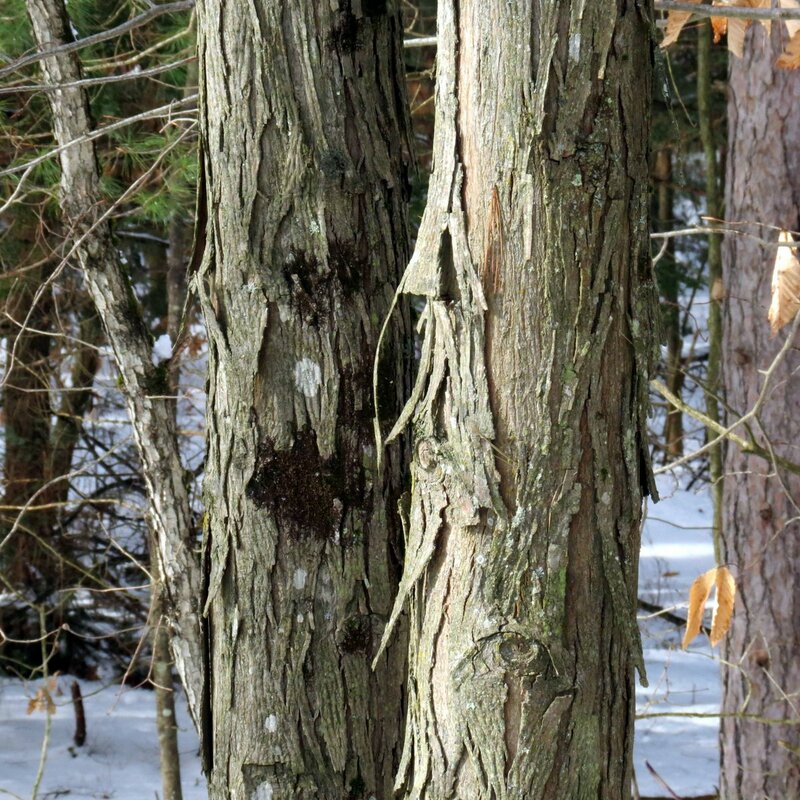 Striped maple bark makes the trees very easy to identify when they’re young, but as trees age the bark becomes uniformly gray. 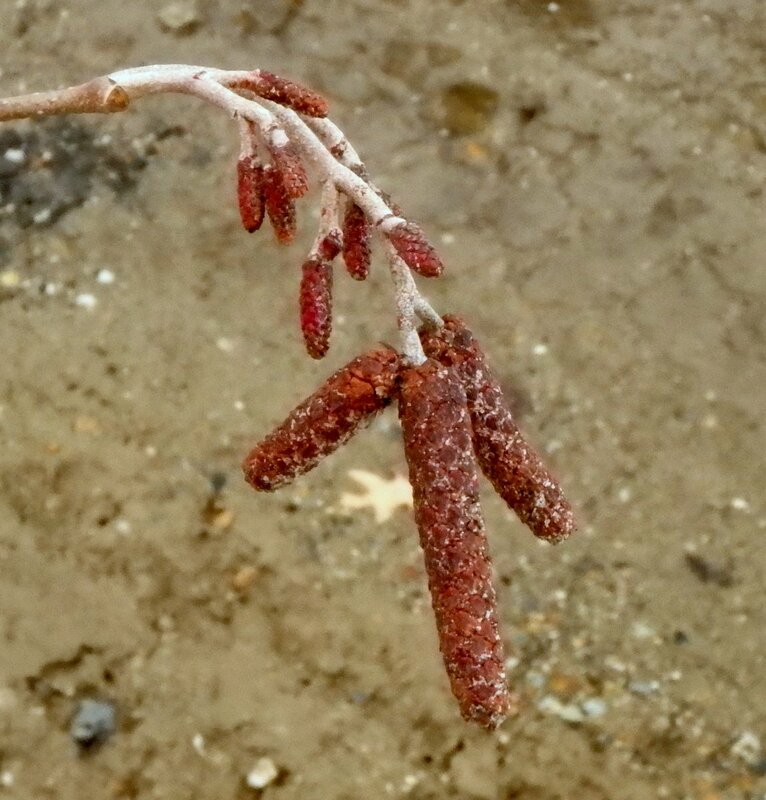 It was about 15 degrees and snowing when this photo was taken and you can see the frozen gummy resin that glues some bud scales together on this gray birch (Betula populifolia) bud and male catkin on the right. 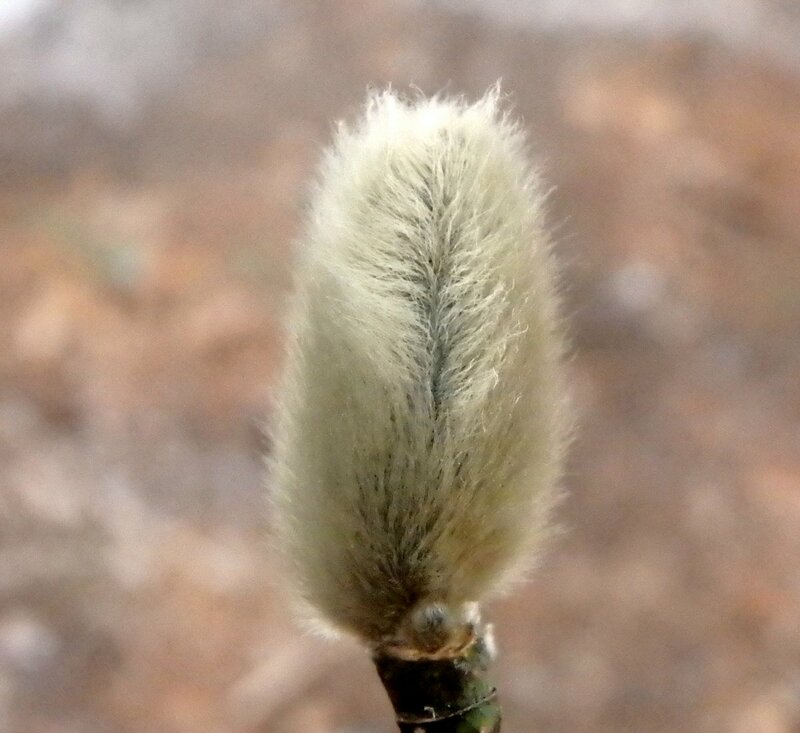 Ruffed grouse will eat the buds and catkins and. 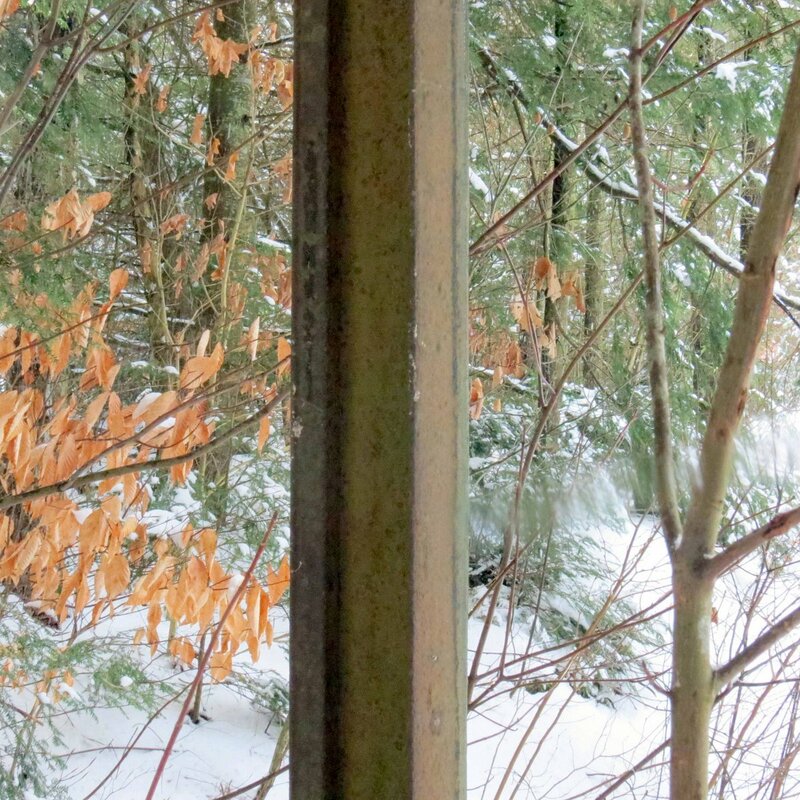 pine siskins and black-capped chickadees eat the seeds. Yellow-bellied sapsuckers feed on the sap and I’ve seen beavers take an entire clump of gray birch overnight, so they must be really tasty. 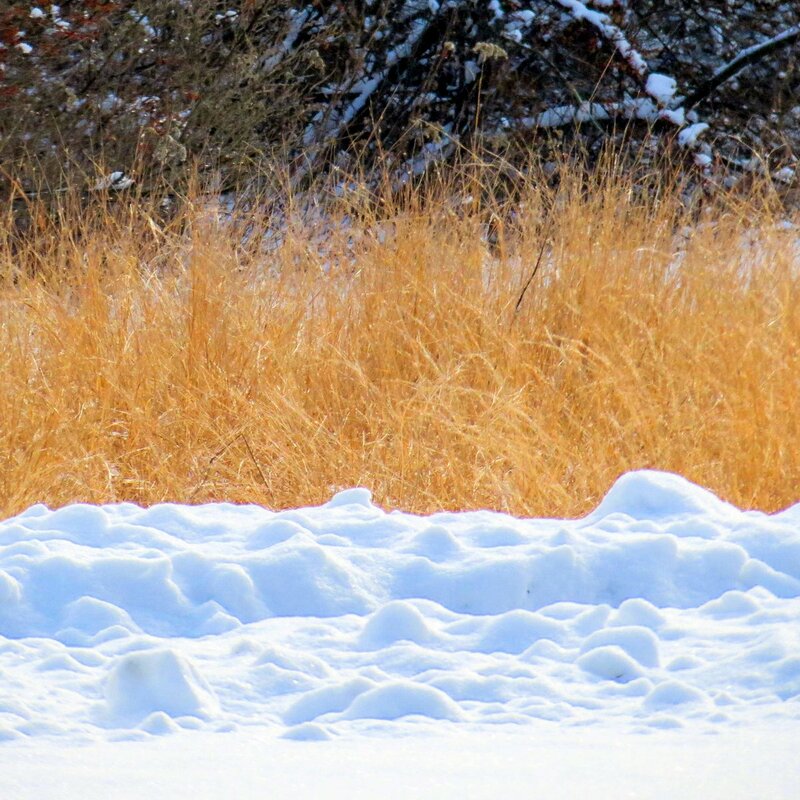 Deer also browse on the twigs in winter. 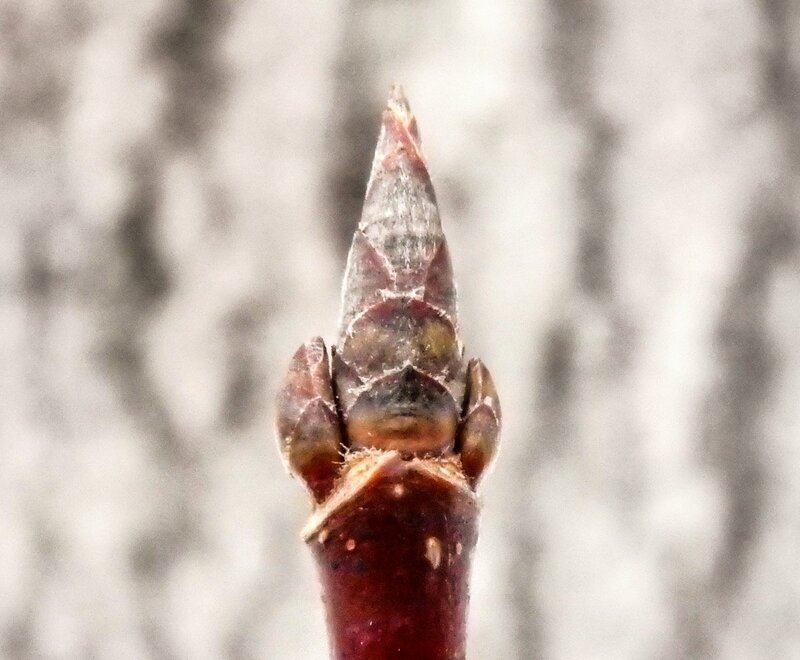 Black birch buds (Betula lenta) don’t have as many bud scales as gray birch buds and the bark doesn’t look at all like other birches, so it can be hard to identify. 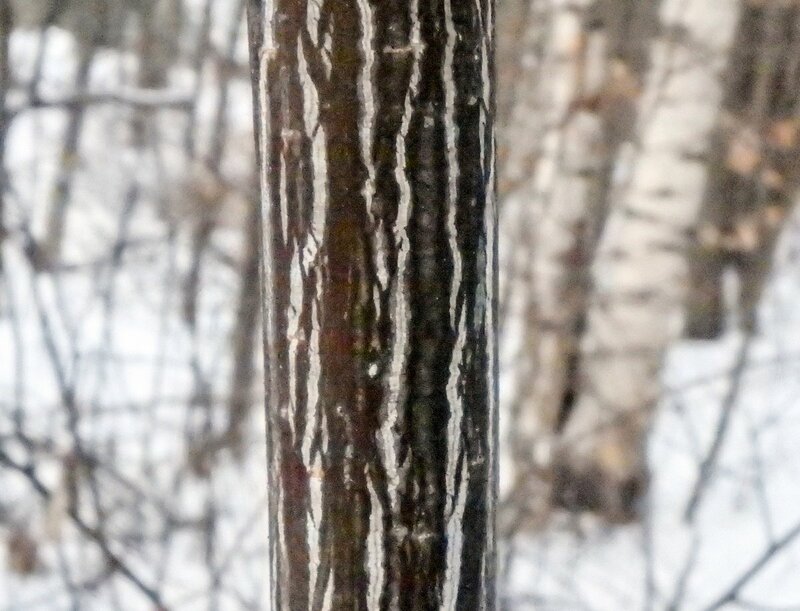 Another name for the tree is cherry birch and that’s because its bark looks like cherry bark. 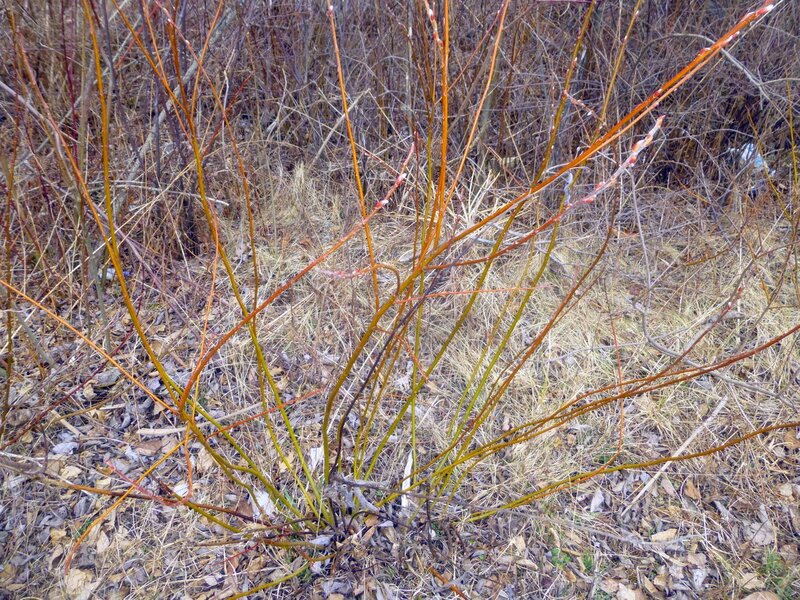 It is also called sweet birch because it smells like wintergreen, and I always identify it by chewing a twig. 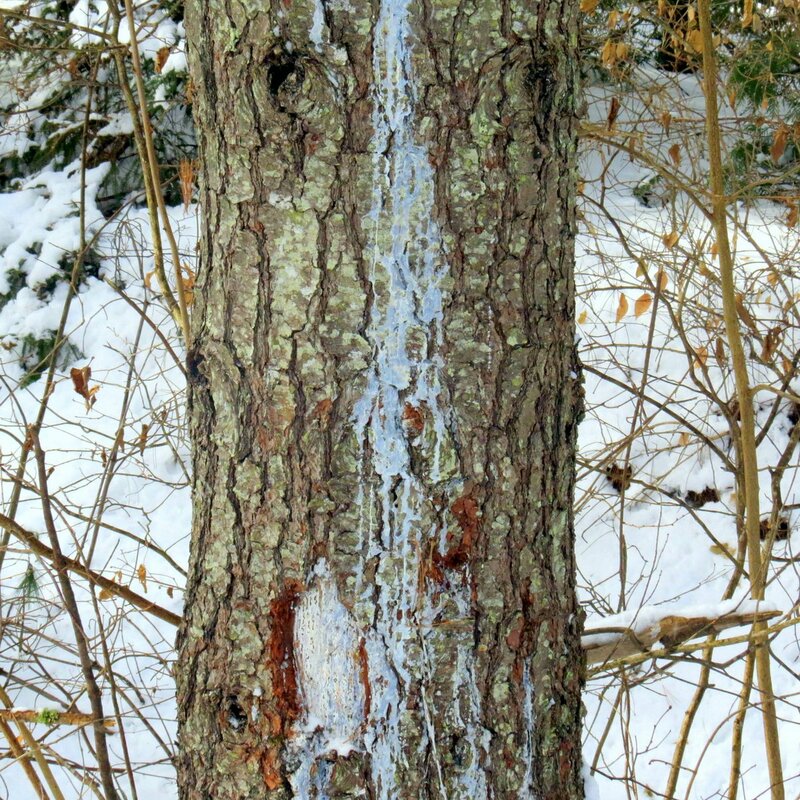 If it tastes like wintergreen then I know it’s a black birch. 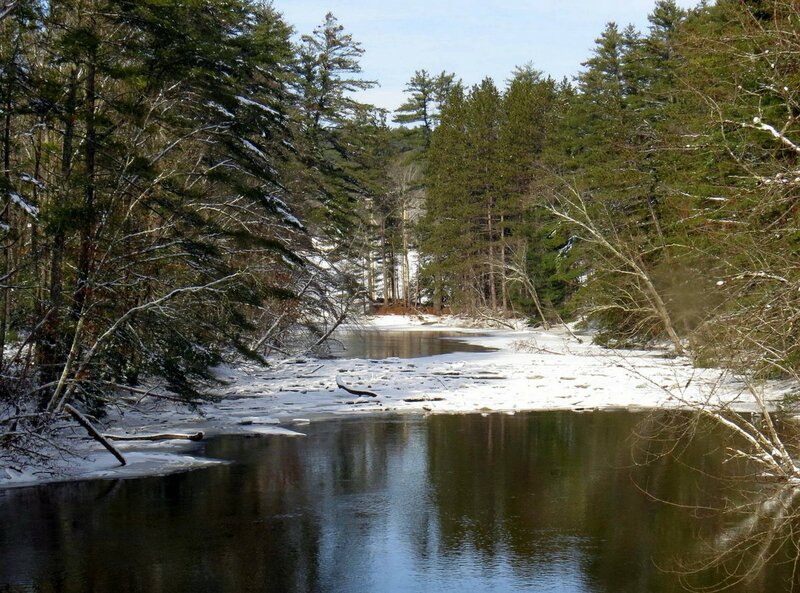 Trees were once harvested, shredded and distilled to make oil of wintergreen. 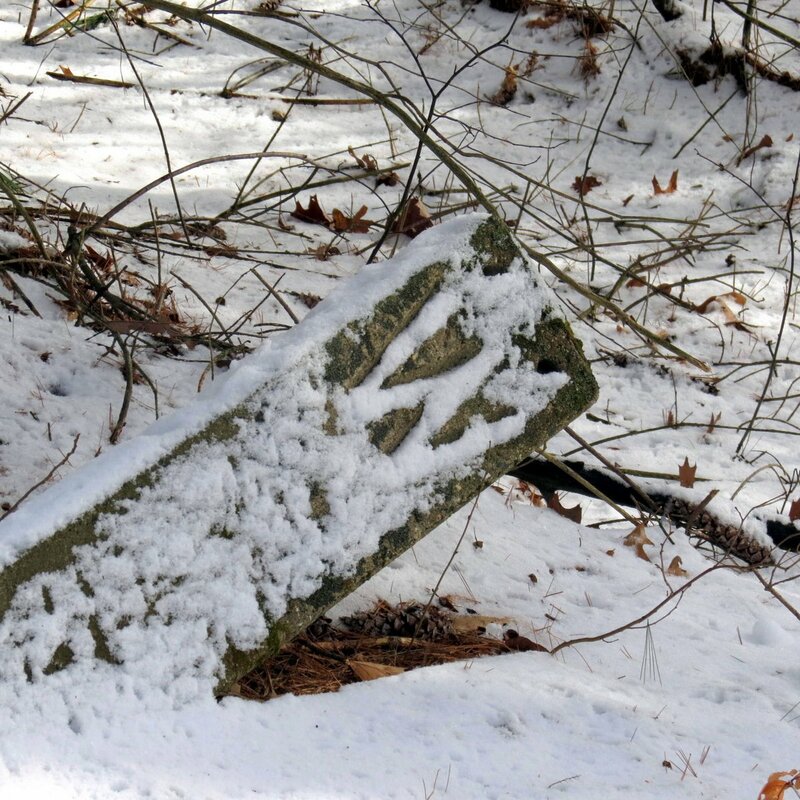 So many were taken that they became hard to find, but they seem to be making a good comeback. Everything about the northern catalpa (Catalpa speciosa) tree is big. 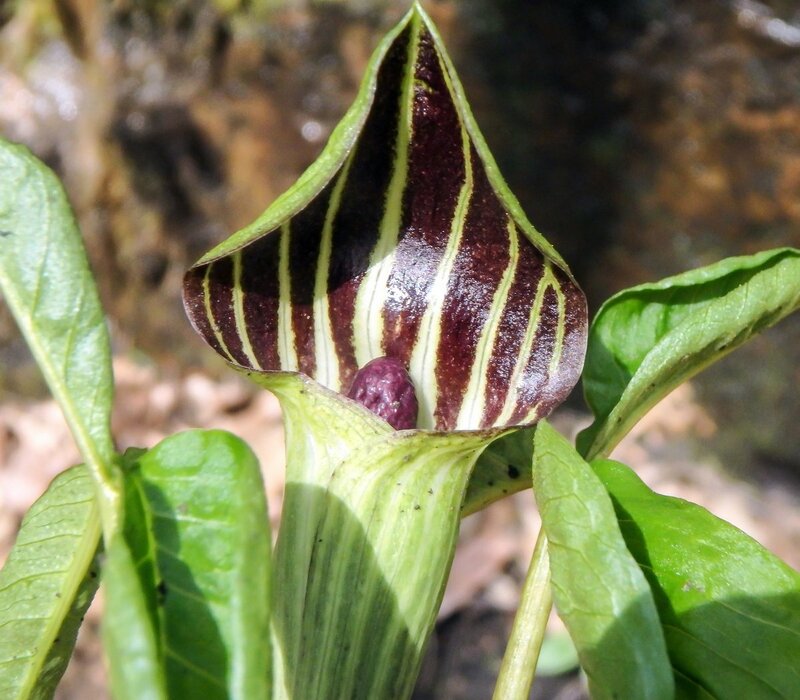 It grows to 70-100 feet and has huge heart shaped leaves. Great trusses of large white orchid like flowers blossom appear on them in late spring, and even the seedpods look like giant string beans. But then there are its buds, which are tiny. 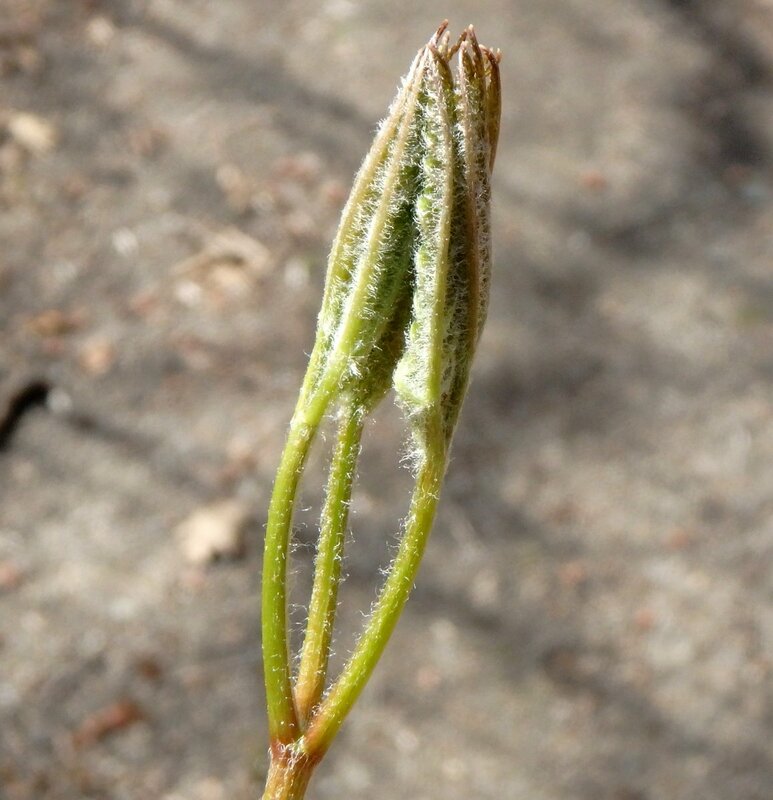 In this photo the brown leaf bud appears just above the suction cup like leaf scar, which is where last year’s leaf was. 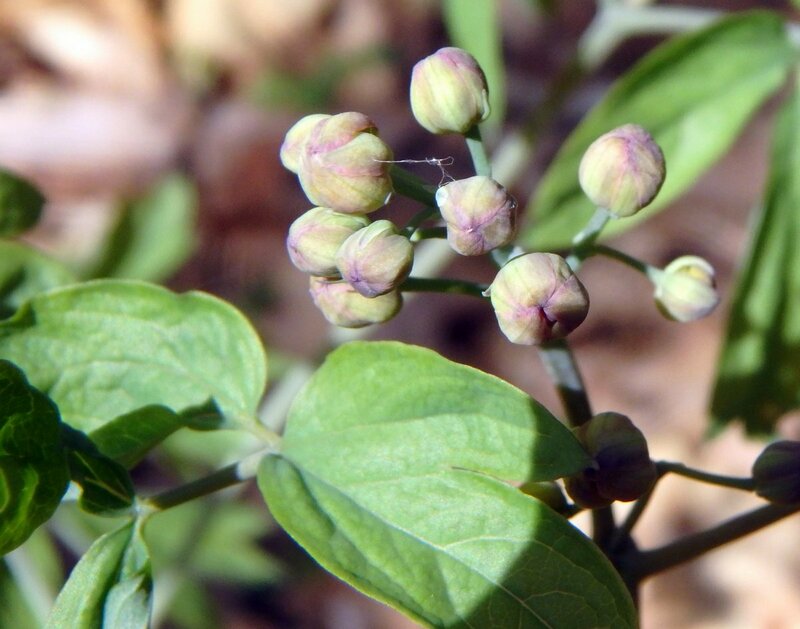 Each tiny bud has about six small pointed scales. 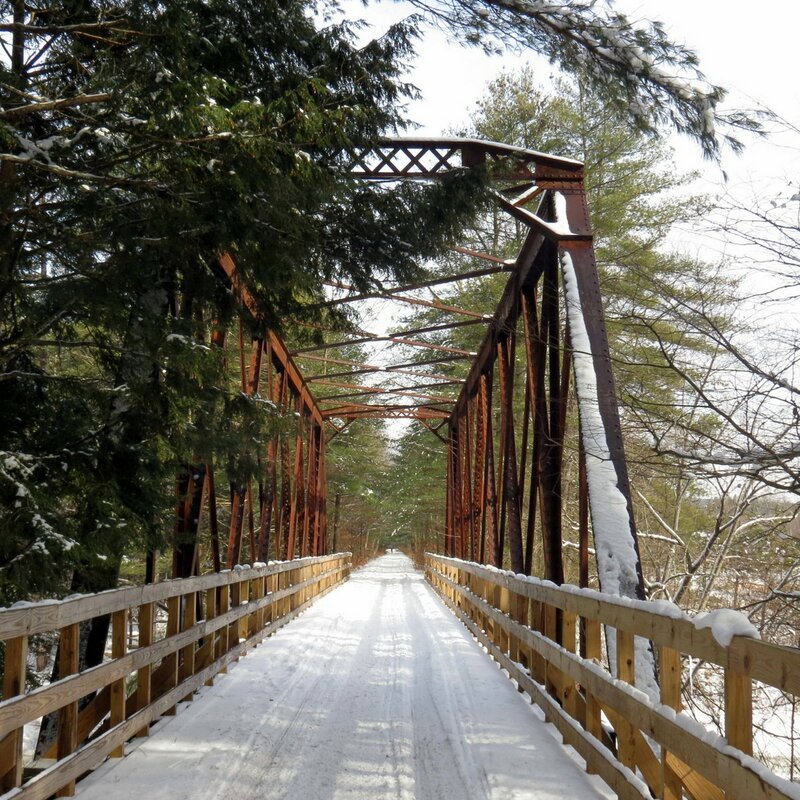 Catalpa wood is very rot resistant and railroads once grew large plantations of them to use as rail ties. 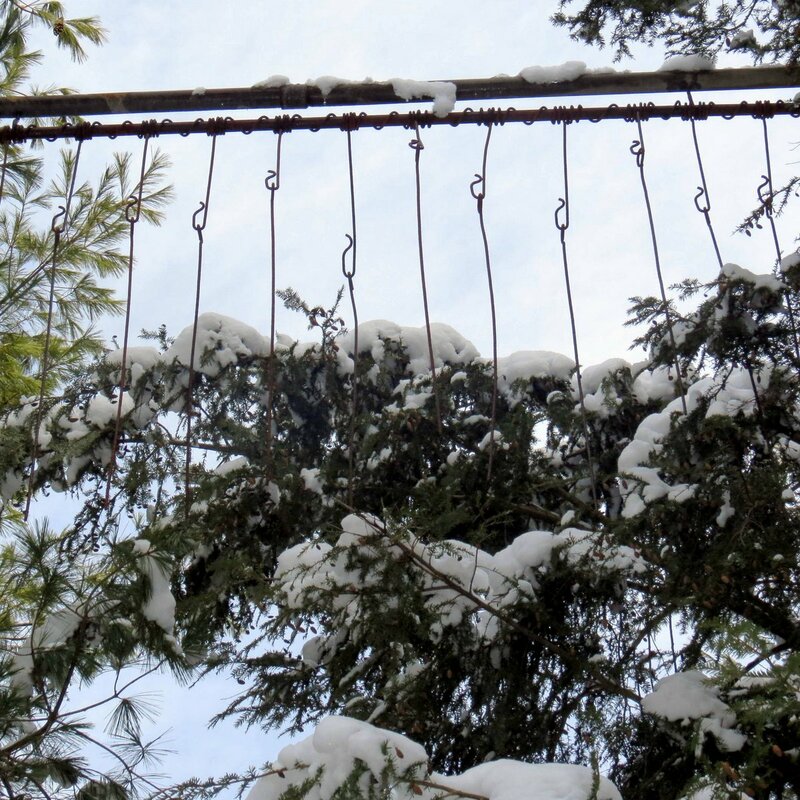 It has also been used for telephone poles. The word catalpa comes from the Native American Cherokee tribe. Catalpa trees have the biggest leaves of any tree I know of. 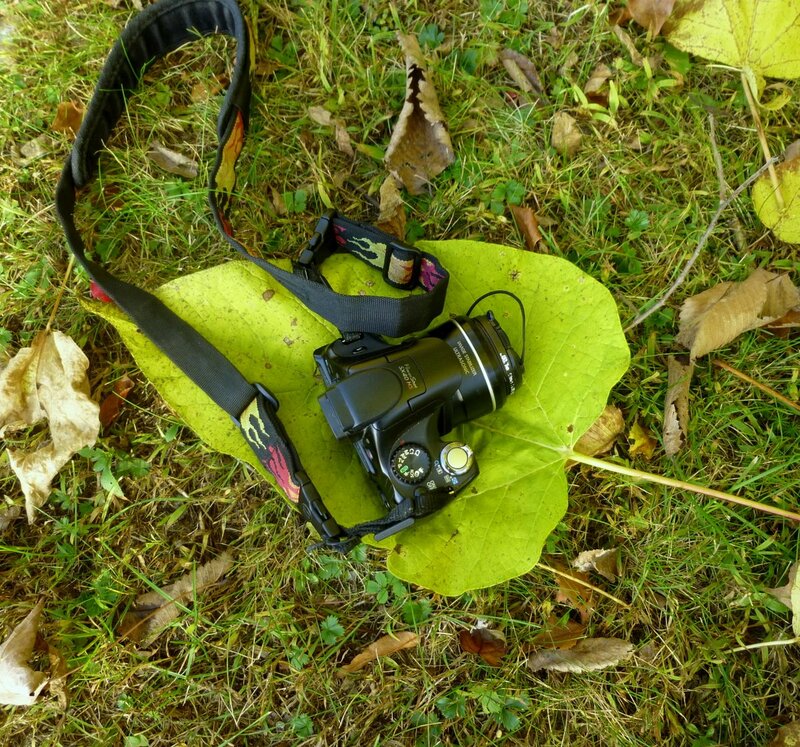 This shot of my camera sitting on one is from a couple of years ago. It’s amazing that such a big thing can grow from such a tiny bud. 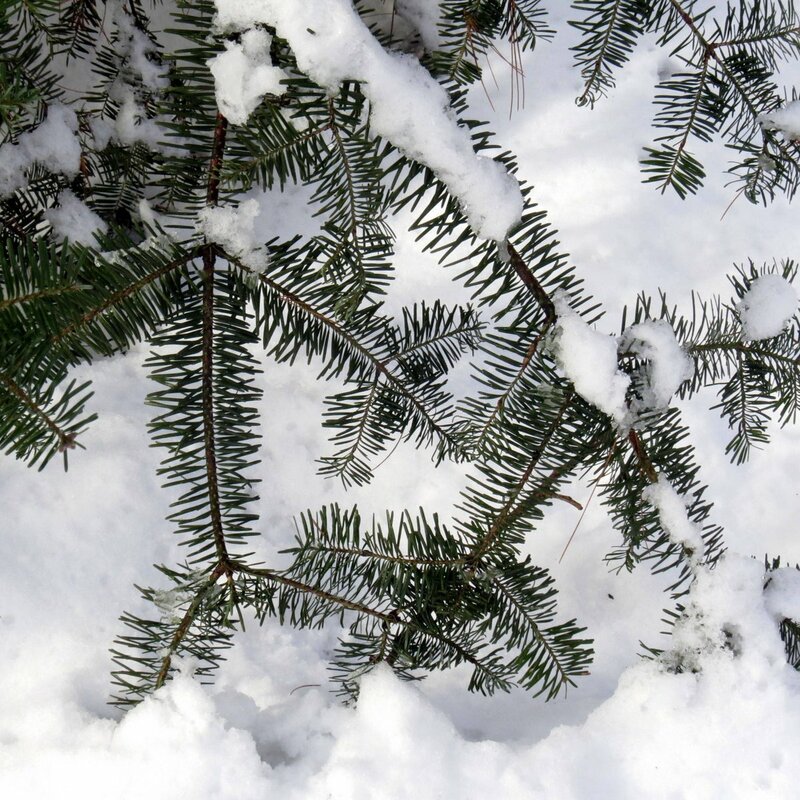 Clusters of small, sticky buds appear at the ends of white pine branches (Pinus strobus.) 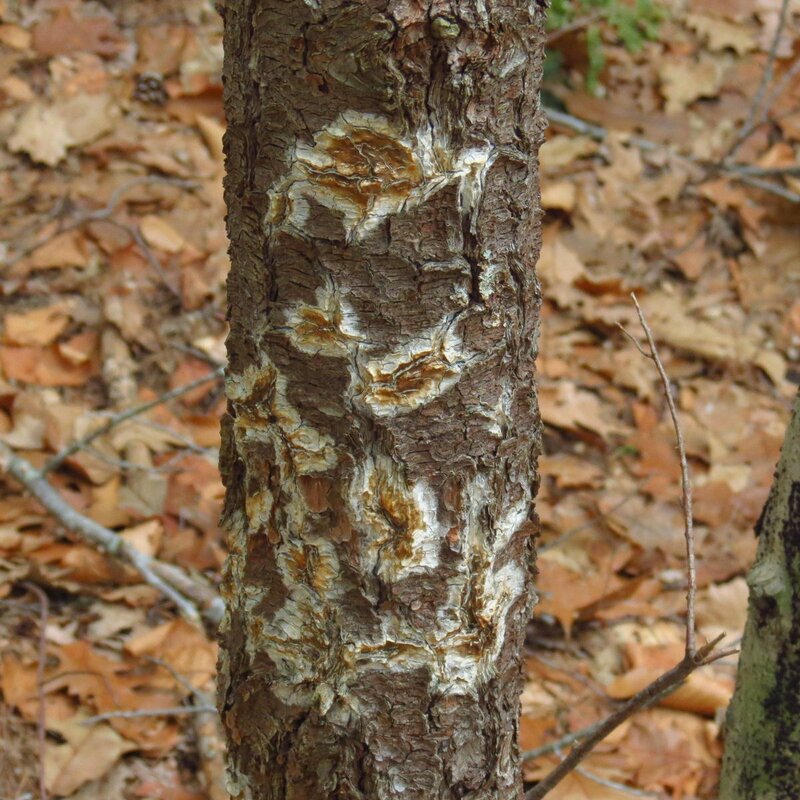 They are sticky because they’re coated with pine sap, which we call pine pitch. 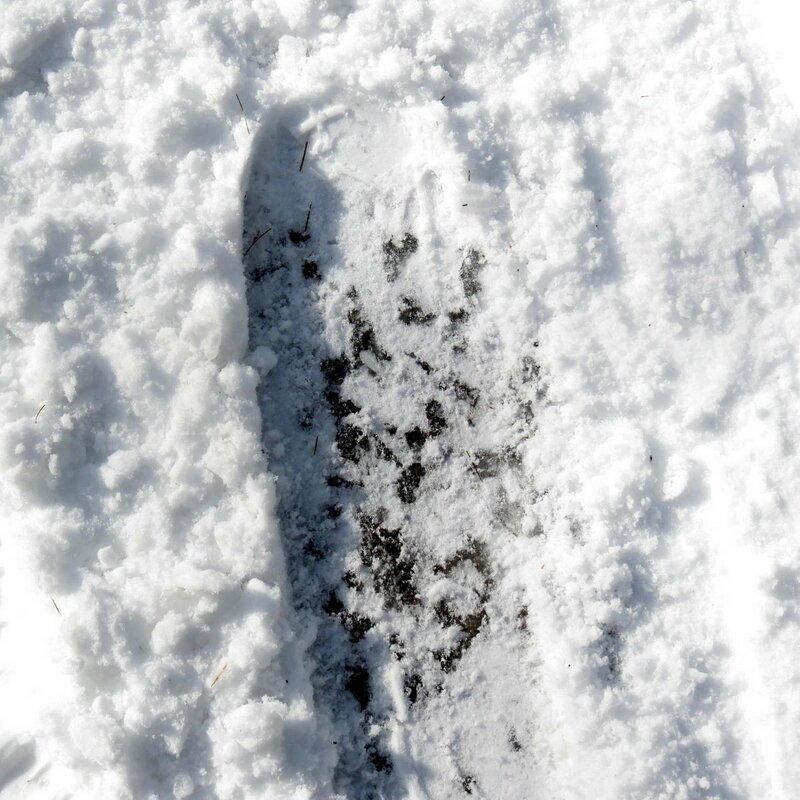 They aren’t sticky when it’s cold though; the white platy material is frozen pine pitch. 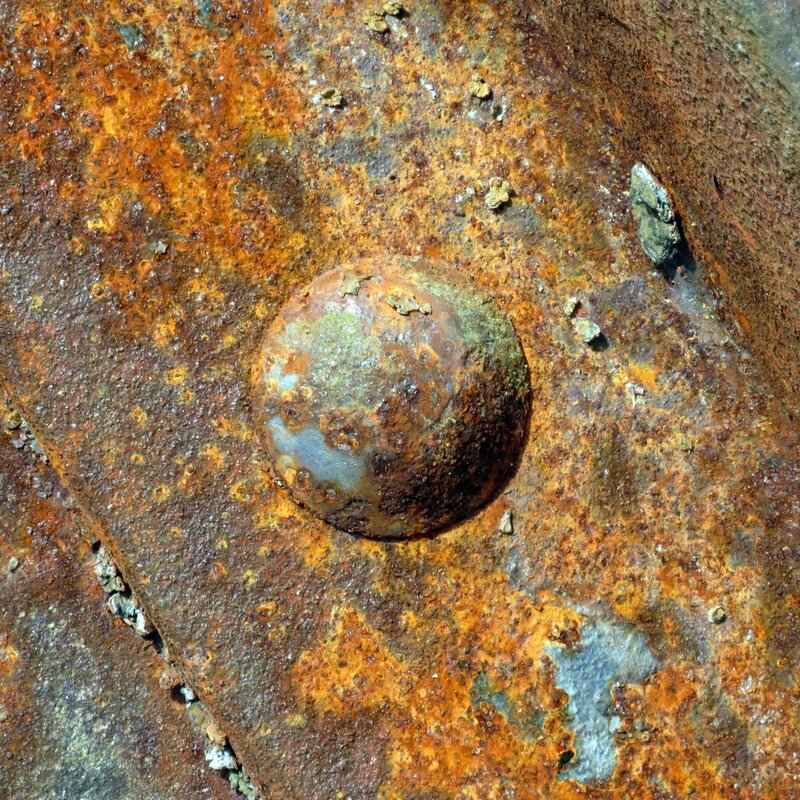 Once the weather warms it will go back to being a thick, amber, sticky fluid that doesn’t easily wash off. I have to apologize for the quality of some of these photos. With it dark before and after work these days photography can only happen on weekends and if it’s dark and cloudy on those days then I have to assume that nature is giving me a lesson in great patience and I just have to do what I can with the camera. 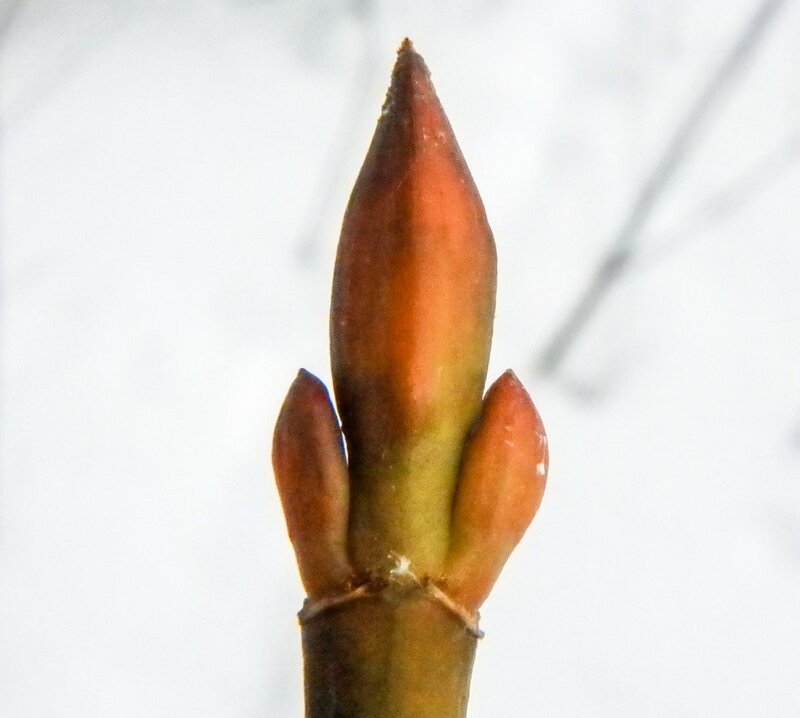 Despite the poor photos I hope this post has shown how interesting and beautiful buds can be, and I hope you’ll have a look at the buds in your own yard or neighborhood. You might be very surprised by what you find. 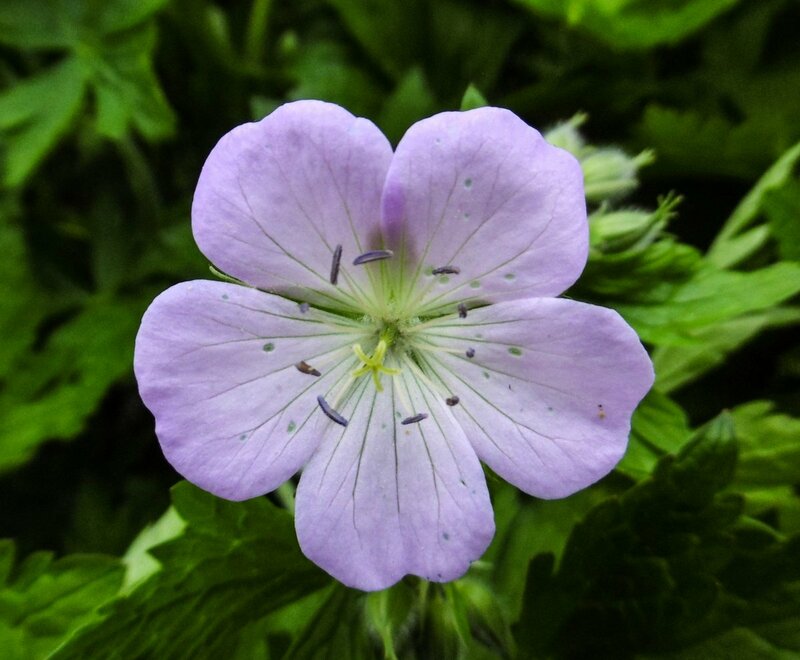 Wild geraniums (Geranium maculatum) have just started blooming. Other common names include alum root, old maid’s nightcap and shameface. 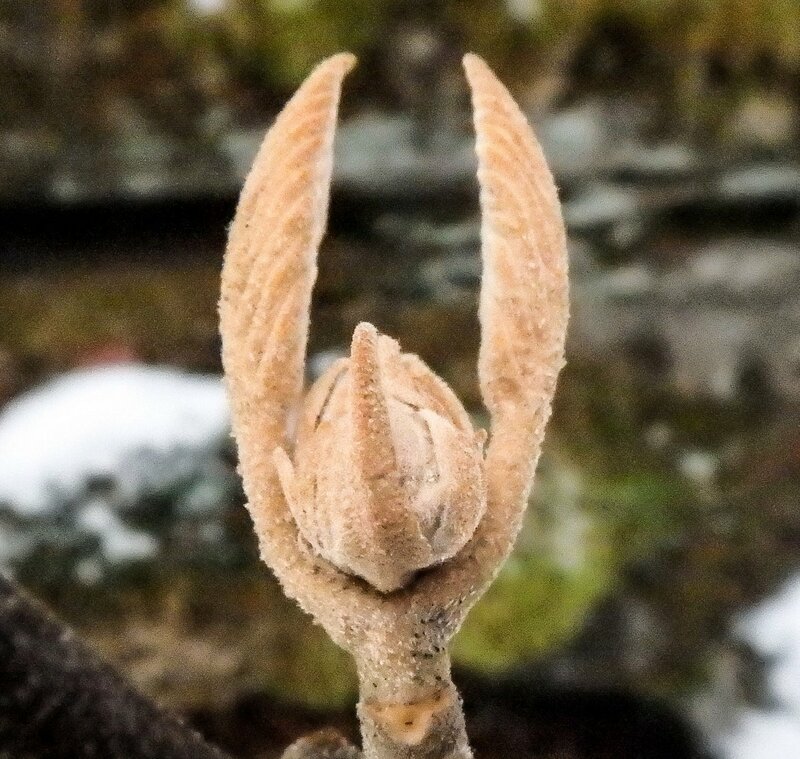 In Europe it is called cranesbill because the seed pod resembles a crane’s bill. 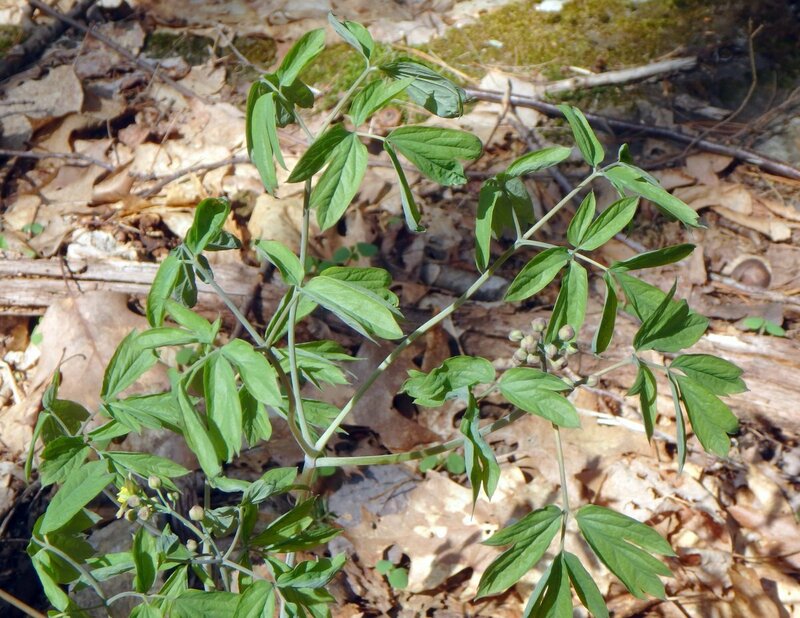 The Native American Mesquakie tribe brewed a root tea for toothache from wild geranium, but I’m not sure if it’s toxic. Much Native knowledge was lost and we can’t always use plants as they did. Somehow they knew how to remove, weaken or withstand the toxicity of many plants that we now find too toxic for our use. 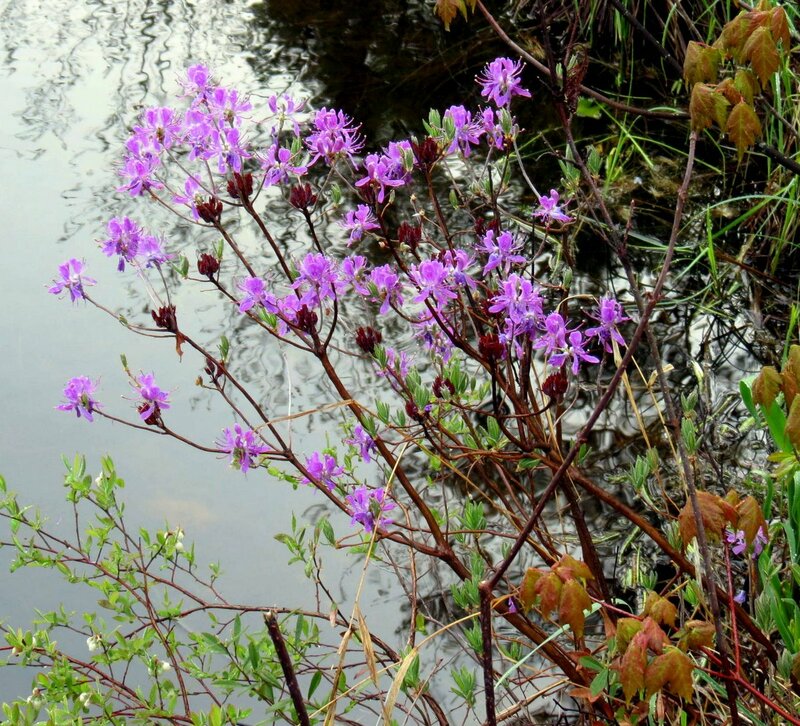 Henry David Thoreau once wrote “The splendid Rhodora now sets the swamps on fire with its masses of rich color,” and that’s what this little two foot tall shrub does each spring. 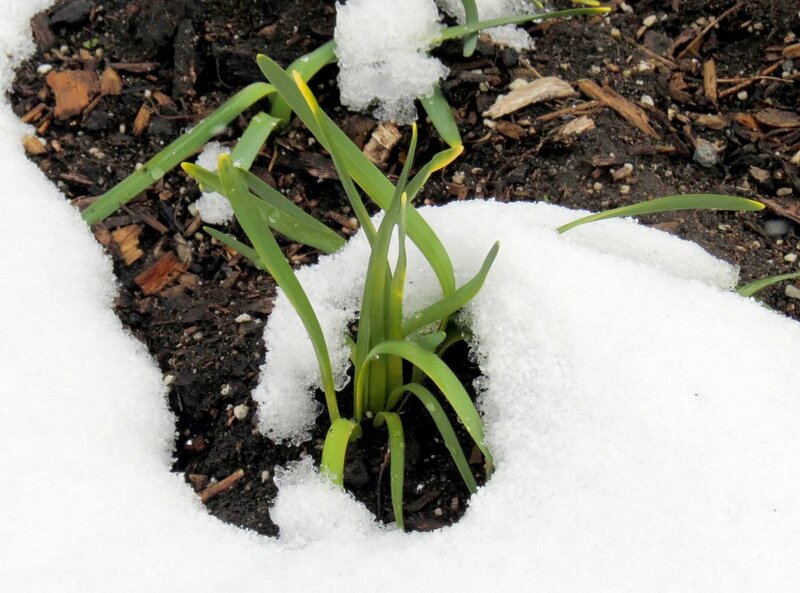 The flowers appear just when the irises start to bloom and I often have to search for them because it isn’t common. 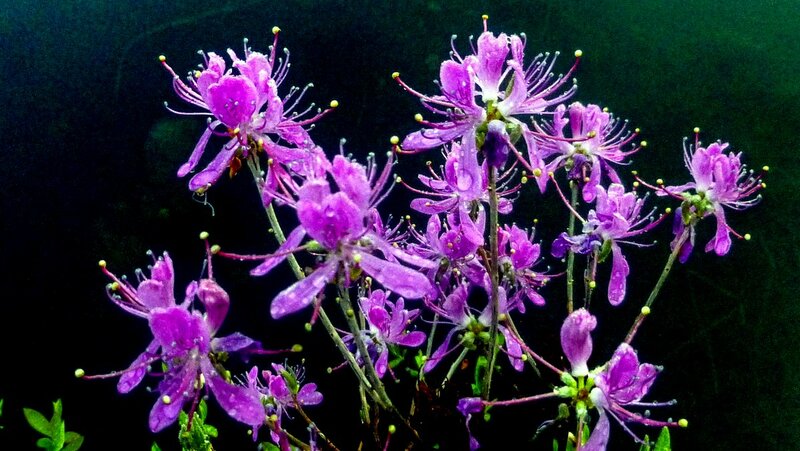 Rhodora (Rhododendron canadense,) is a small, native rhododendron (actually an azalea) that loves swampy places. 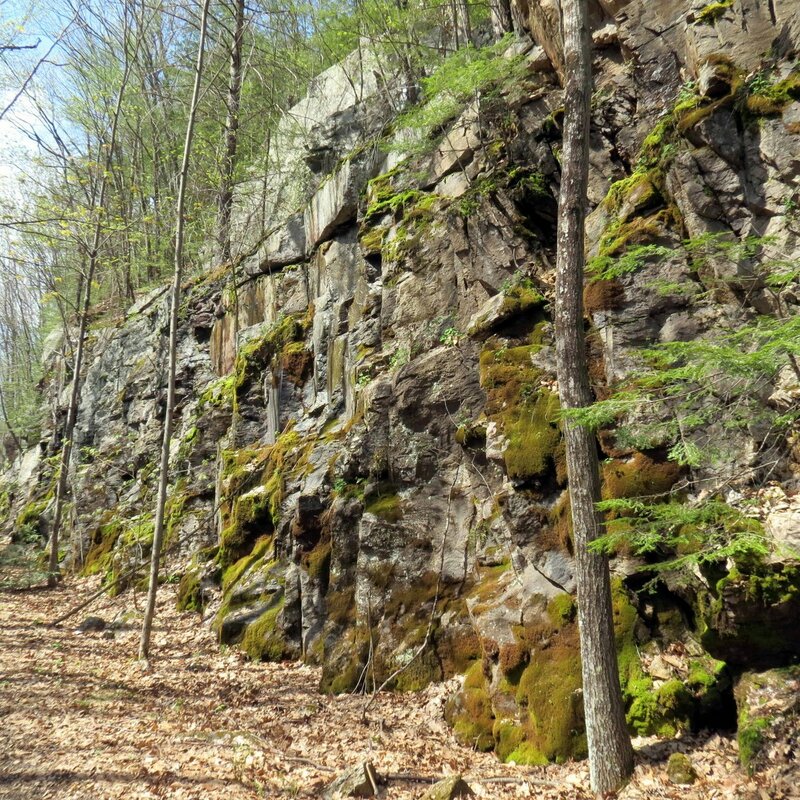 It is native to the northeastern U.S. and Canada and both its western and southern limits are reached in Pennsylvania. 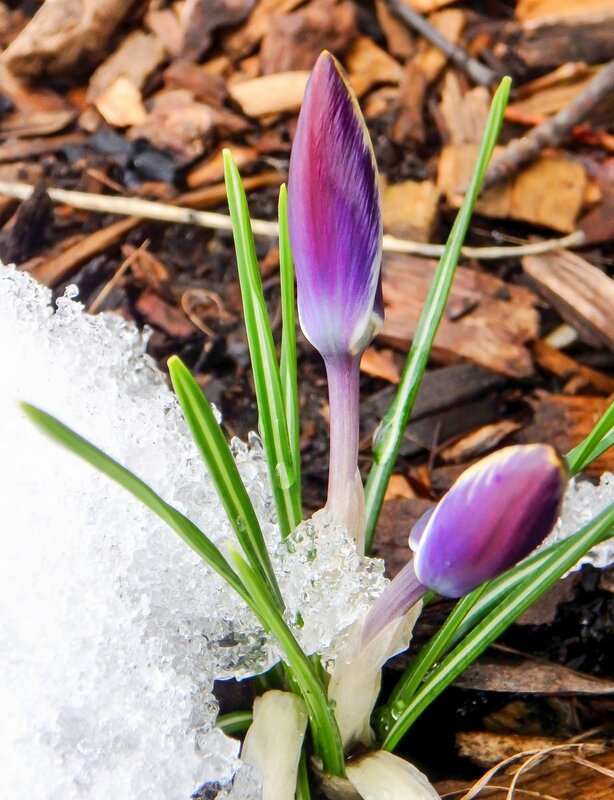 The flowers appear before the leaves, but only for a short time in spring. 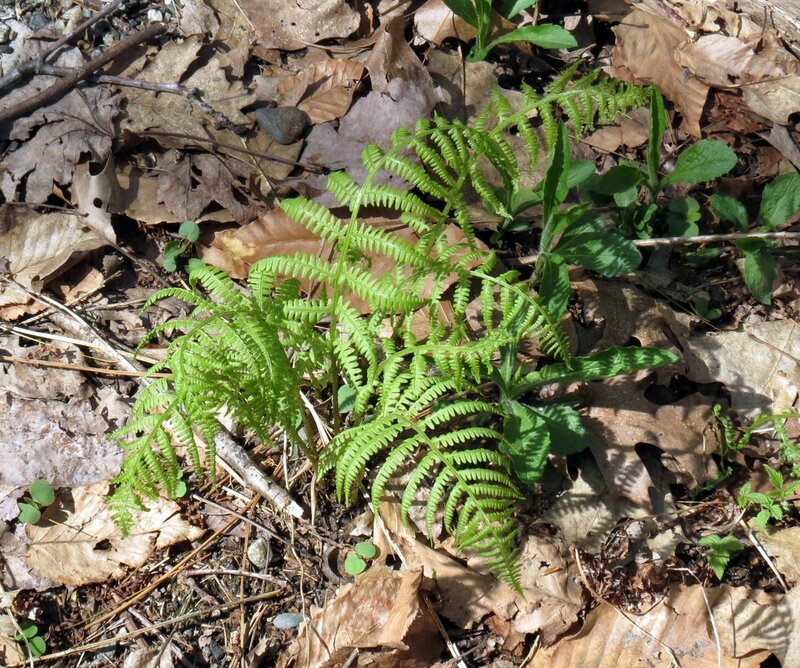 By mid-June they will have all vanished. Because of their habit of growing in or very close to the water I couldn’t get close enough to this rhodora to get a shot of a single flower, but if you’ve ever seen an azalea blossom then you know what they look like. It’s the color of this one that sets it apart from other azaleas, in my opinion. 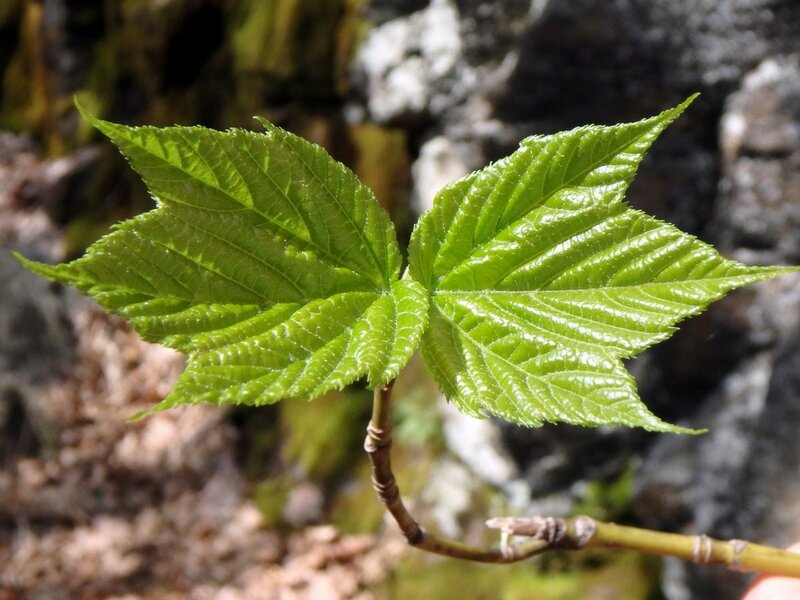 This plant was brought from Canada to Paris in March 1756 and was introduced to England in 1791. 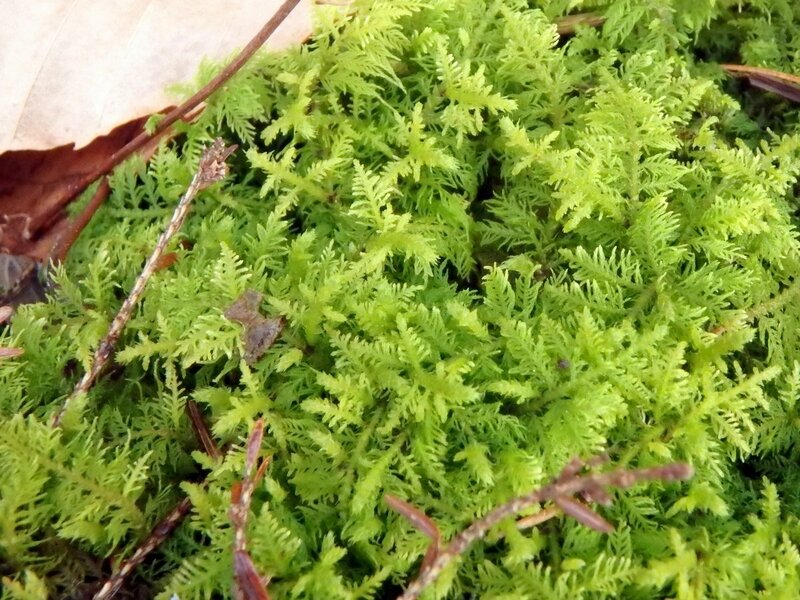 It is said to have been a big hit, but it must have been difficult to grow in English gardens since it likes to grow in standing water and needs very cold winters. 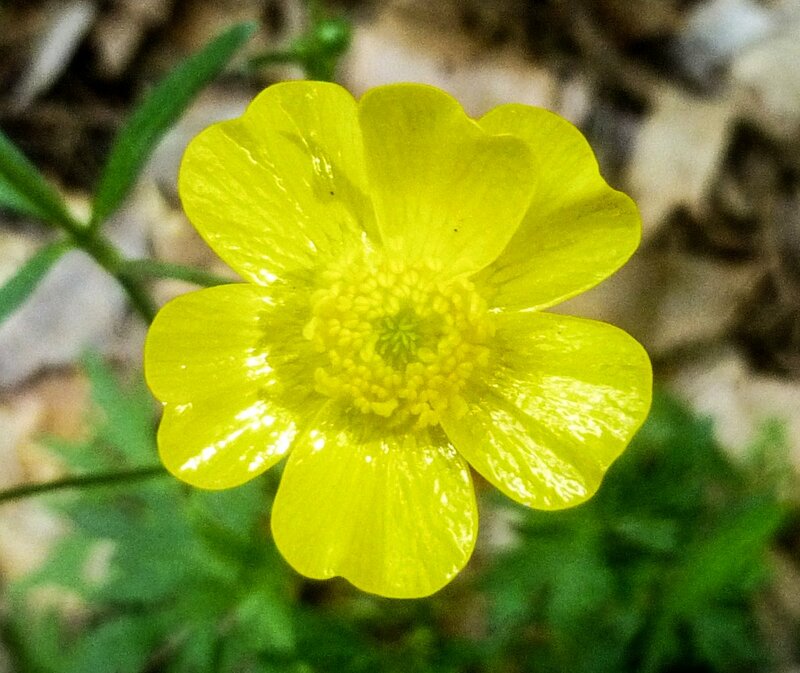 The waxy shine on buttercup (Ranunculus) petals is caused by a layer of mirror-flat cells that have an air gap just below them, and just below the air gap is a smooth layer of brilliant white starch. All of these layers act together to reflect yellow light while blue-green light is absorbed. 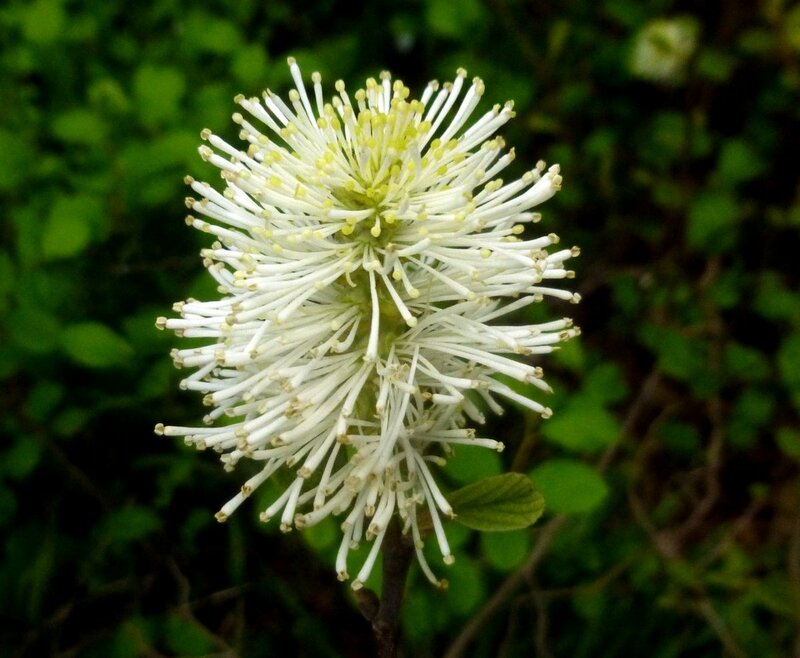 Witch alder (Fothergilla major) is a native shrub related to witch hazel. 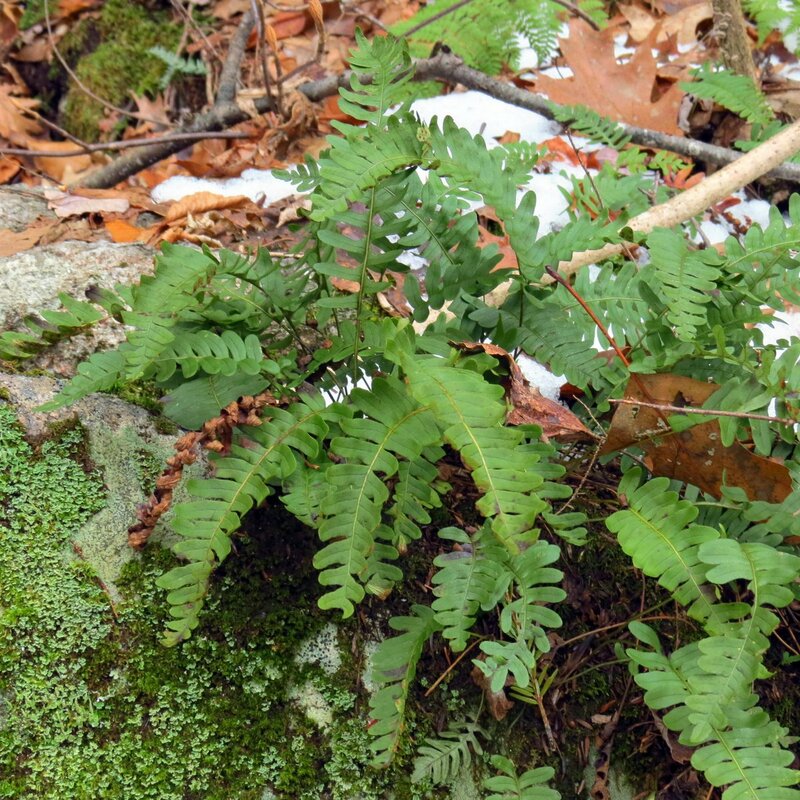 Though native to the southeast it does well here in the northeast, but it is usually seen in gardens rather than in the wild. The fragrant flower heads are bottlebrush shaped and made up of many flowers that have no petals. Their color comes from the stamens, which have tiny yellow anthers at the ends of long white filaments. Though it looks big in this photo this witch alder is barely 6 feet tall, and it’s the largest one I’ve seen. 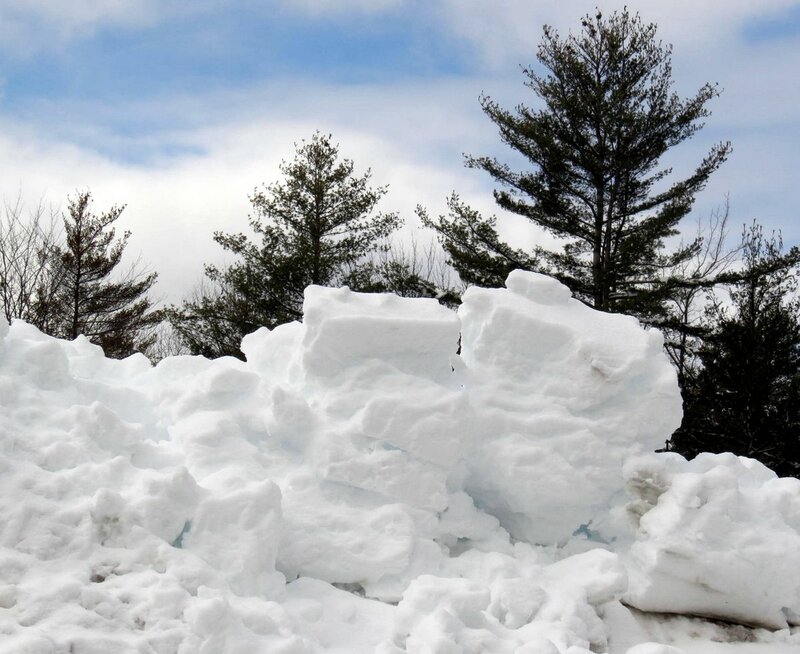 Most others I’ve seen are 2-3 feet tall. As you can see they flower profusely and are said to make an excellent hedge. 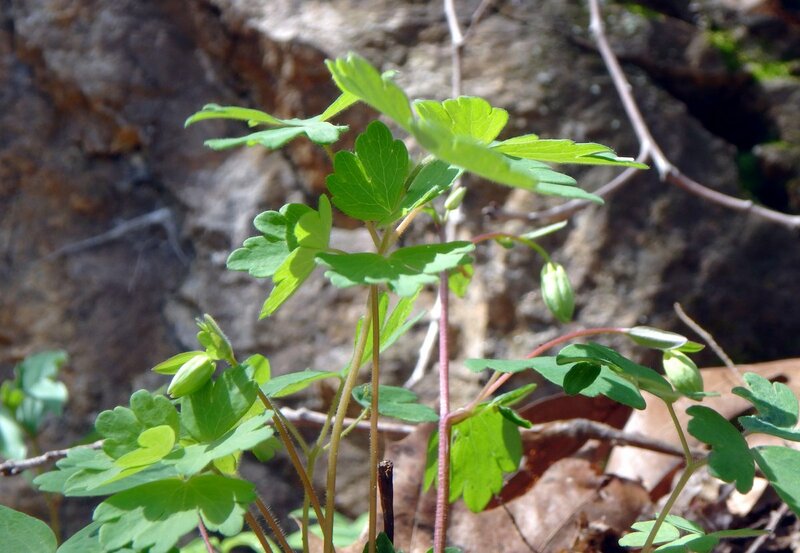 Sweet woodruff (Galium odoratum) has leaves that grow in a whorl, which you can see in this photo. 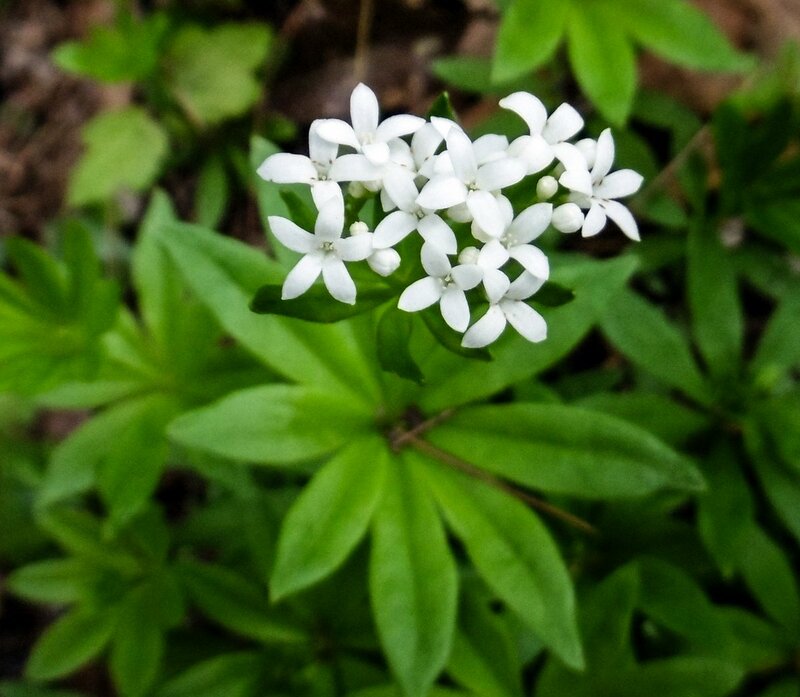 This is a low growing summer wildflower with 4 petaled white flowers that seems to prefer the shade at the edges of forests. 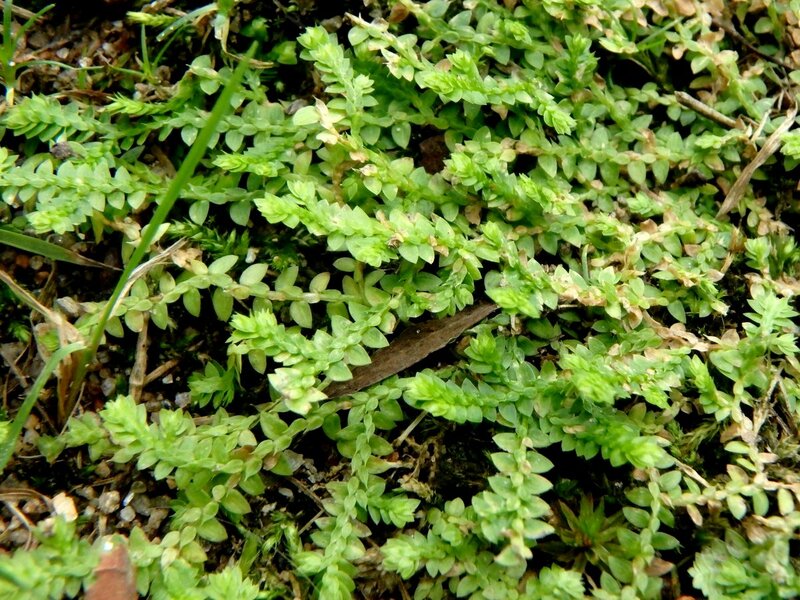 It makes an excellent old fashioned groundcover which, if given plenty of water, will spread quickly. The odoratum part of the scientific name comes from the pleasant, very strong fragrance of its dried leaves. 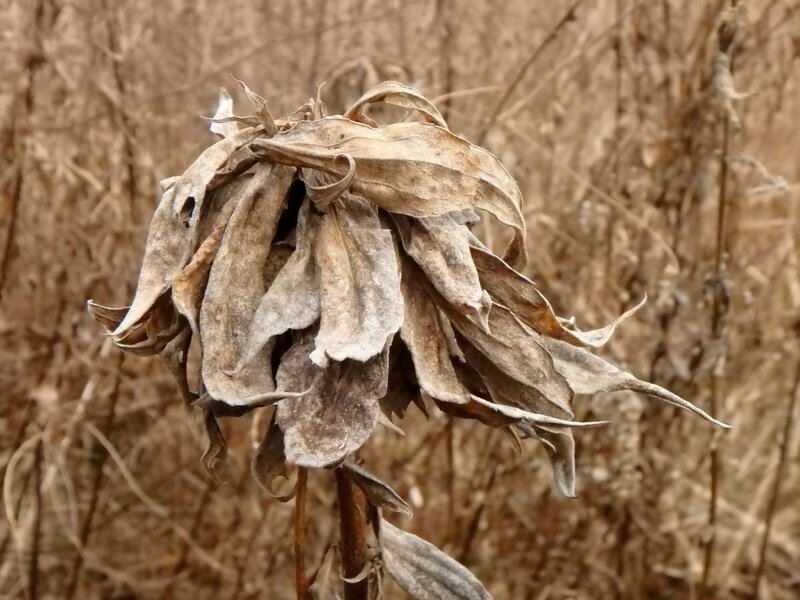 The dried leaves are often used in potpourris because the fragrance lasts for years. 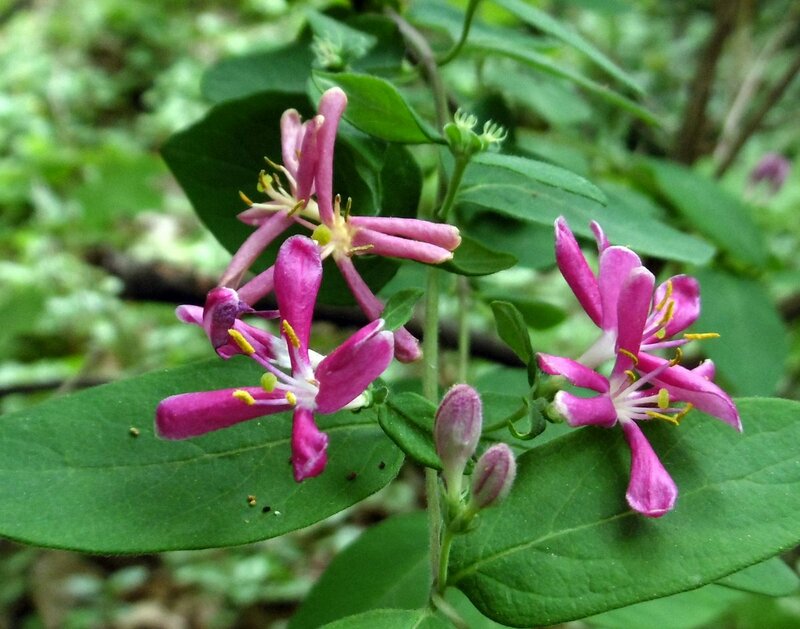 We have several invasive honeysuckle species here in New Hampshire and I’ve given up trying to identify them all. Most or all are banned from being sold but birds love their bright red berries and that makes the shrubs impossible to ever eradicate. This example had the pinkest flowers I think I’ve ever seen on a honeysuckle. 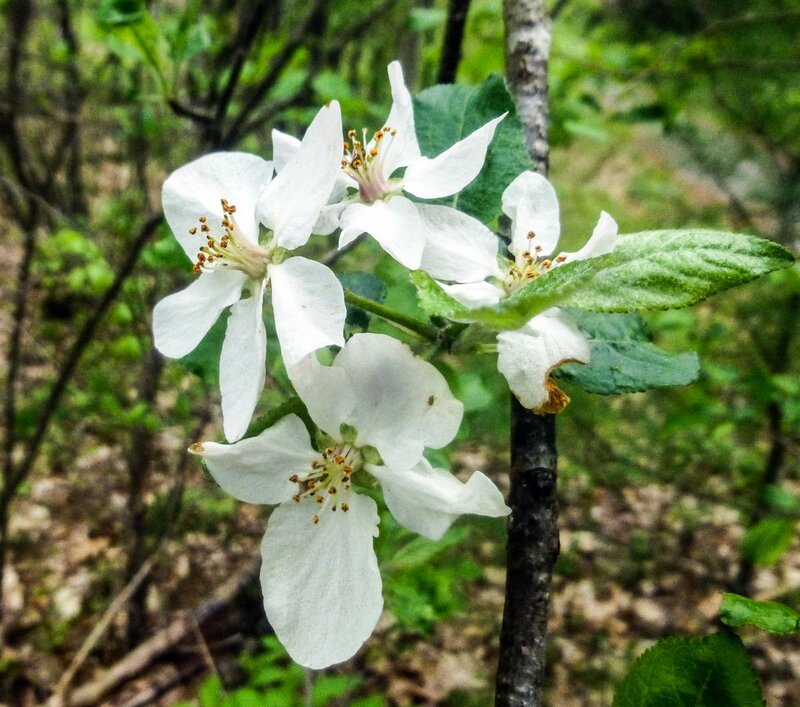 Apple trees grow throughout our forests and this is what makes people believe they’re seeing “wild” apples, when in fact every apple tree in this country (except crabapples) has been imported from somewhere else or was planted by seed; either by man, bird or animal. That’s why John Chapman (aka Johnny Appleseed) did what he did. I love apple trees for their fragrance and so did my grandmother. Each year at this time I used to give her all the apple blossoms I could pick and for a day or two her house would smell like an orchard. 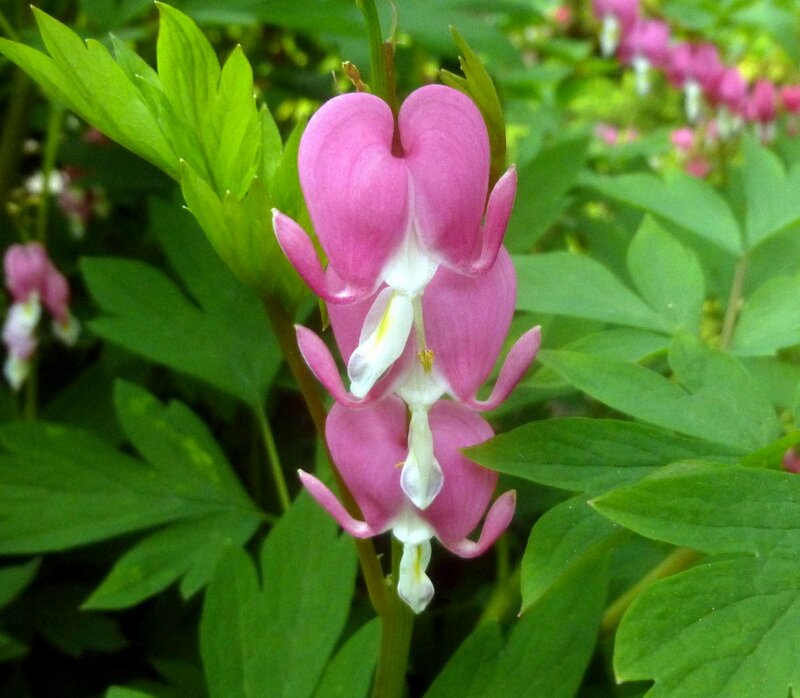 Bleeding hearts (Dicentra spectabilis) grow naturally in forests so they are plants that like cool, shady locations. They’ll go dormant quickly when it gets hot and since it’s already getting hot here I thought I should get a couple of photos of them. It’s one of the oldest perennials in cultivation and it is called old fashioned bleeding heart. I’ve always liked them and they were one of the first flowers I chose for my own garden. 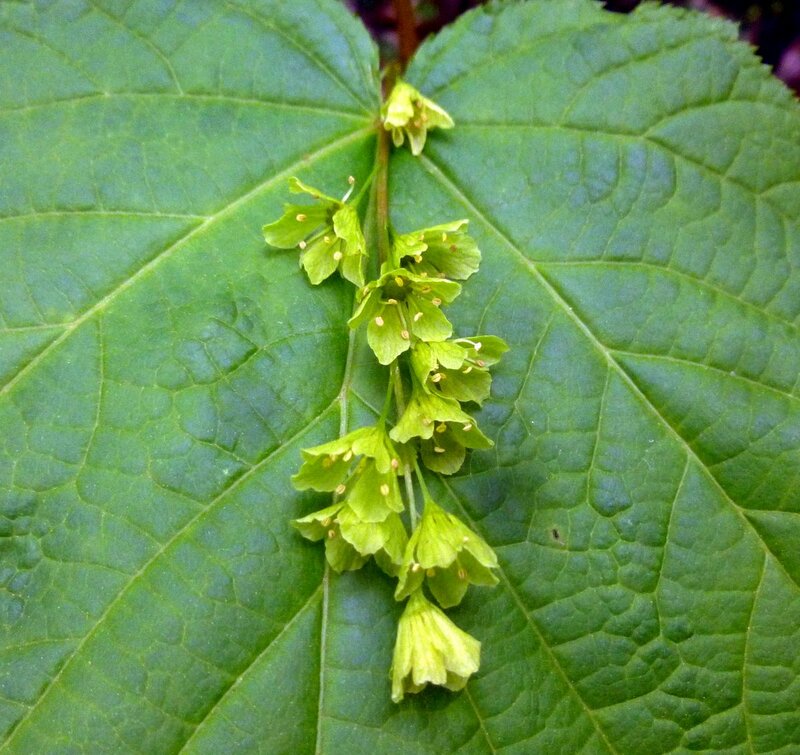 The flowers of striped maple (Acer pensylvanicum) look like bells dangling on a cord. They usually hang down under the leaves and can be very hard to get a good photo of, but every now and then a wind will come along and blow them up over a leaf, and that’s what happened here. 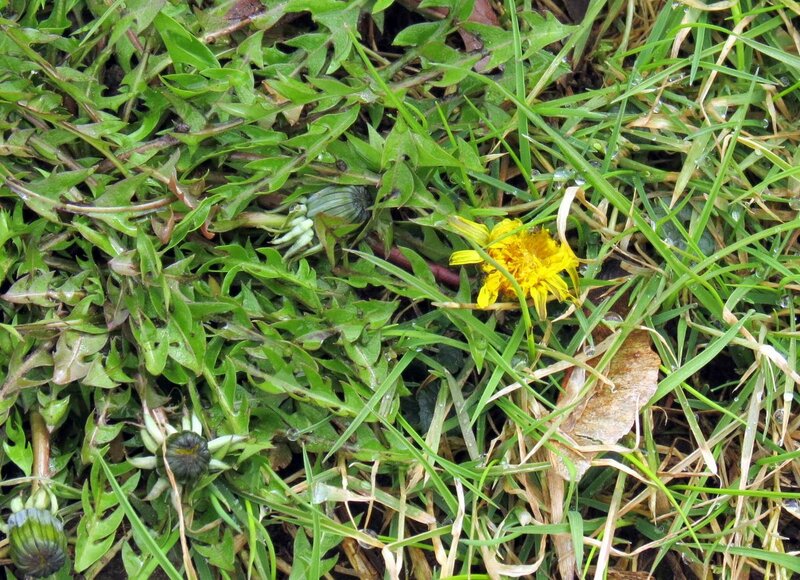 The yellowish green bell shaped flowers are quite small, only about 1/4 inch across. Trees can have male, female or both kinds of flowers. 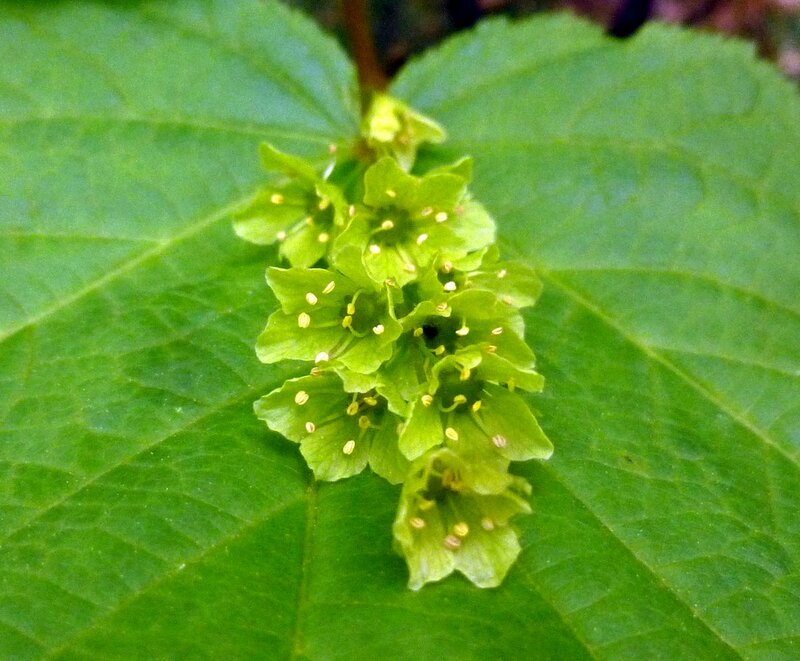 Another view of the unusual striped maple flowers. 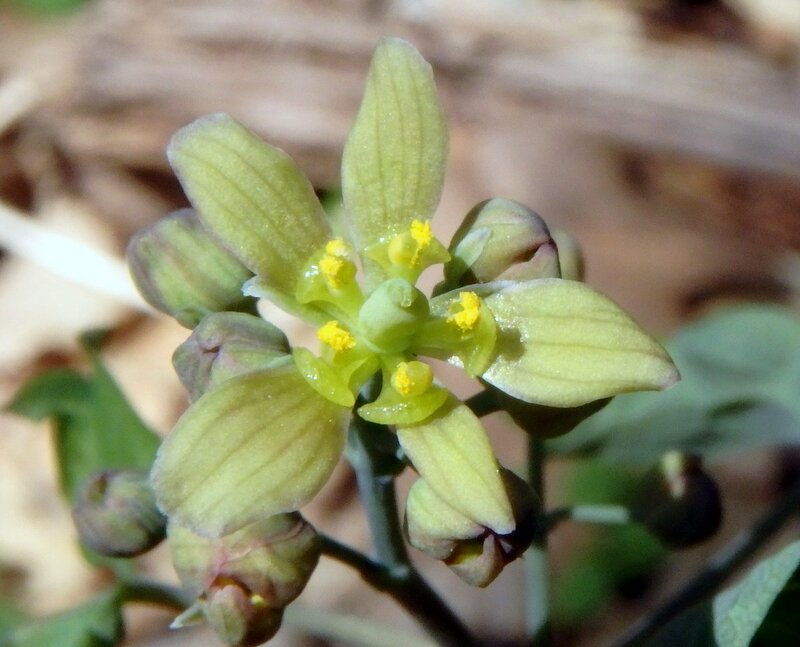 Each flower has 5 green sepals and 5 greenish-yellow petals with outward turning lobes that are a bit longer than the sepals. Their six to eight stamens show that those in the photo are male flowers. 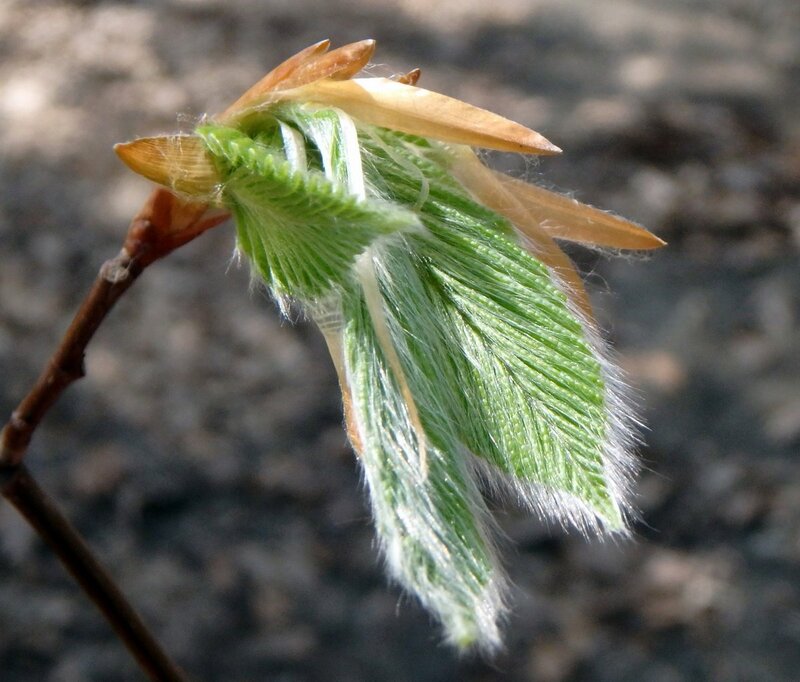 A striped maple needs to be at least ten years old to produce seeds. 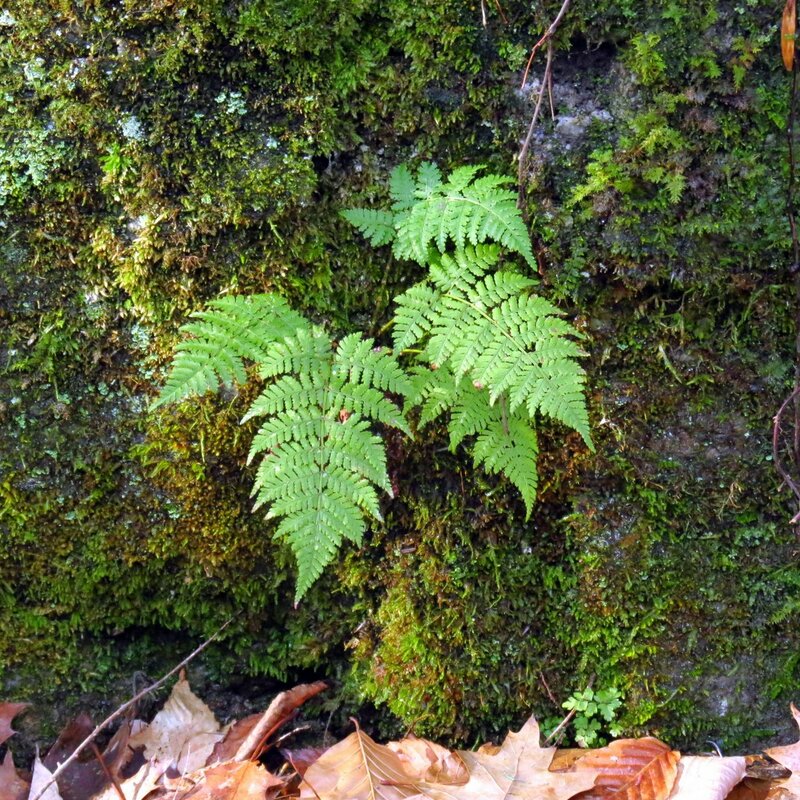 They like cool moist woods and their large, hand size leaves mean they can take quite a lot of shade, so they grow in the understory. 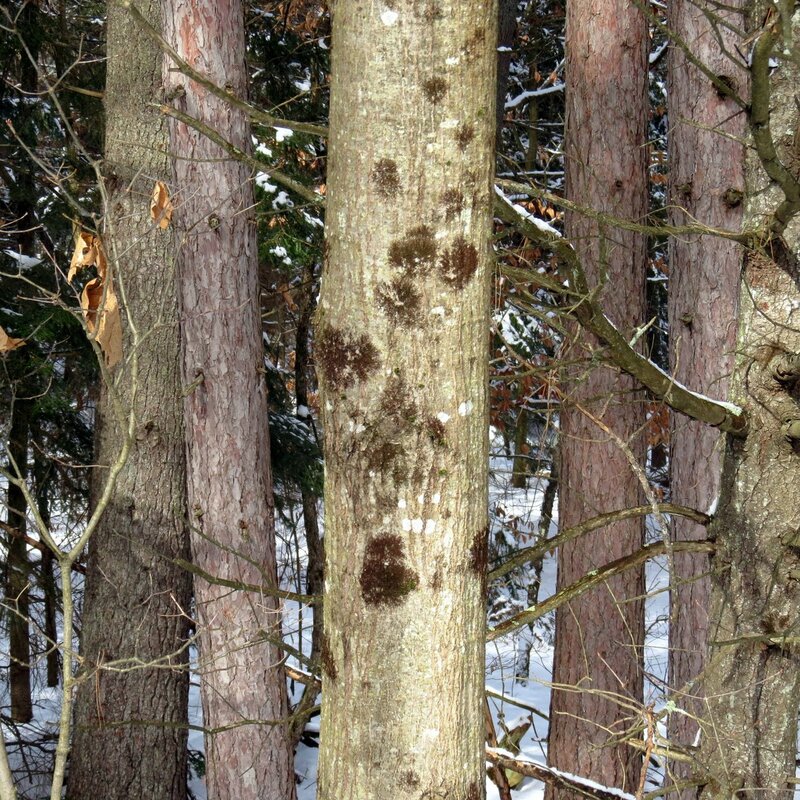 Native Americans are said to have used the wood of striped maple to make arrows and its bark for tea. 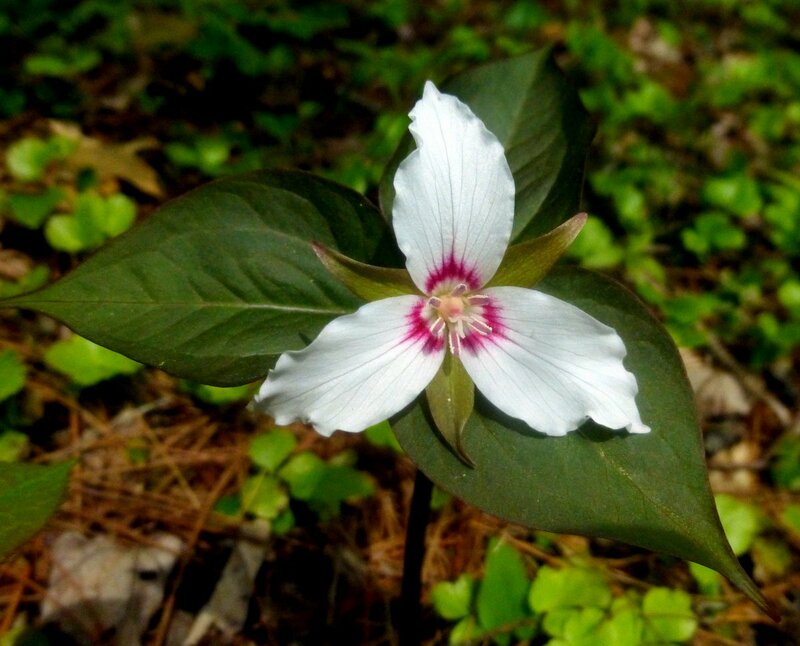 Painted trilliums (Trillium undulatum) are the third trillium I look for each spring. 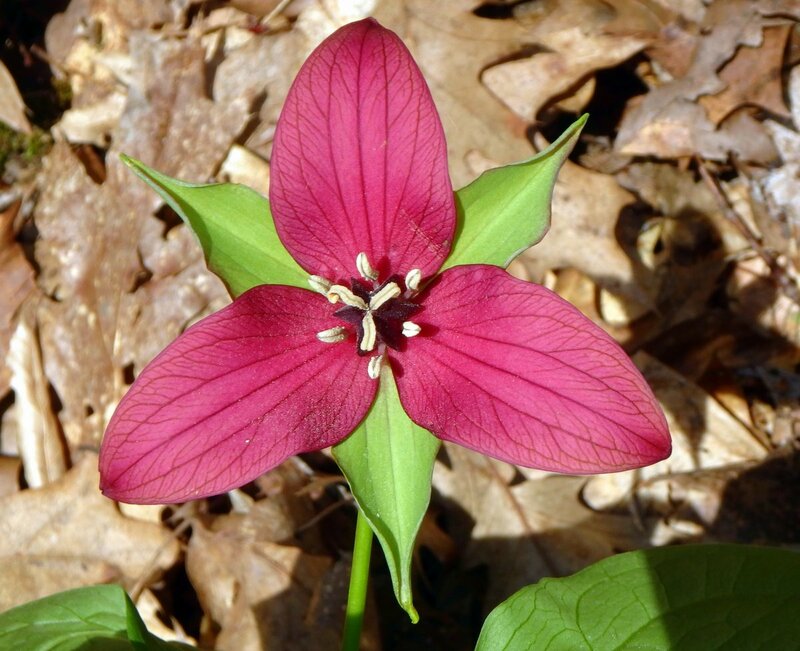 As the purple trilliums fade and nodding trilliums have moved from center stage along comes the painted trillium, which is the most beautiful among them, in my opinion. Each bright white petal has a reddish “V” at its base that looks painted on, and that’s where the common name comes from. 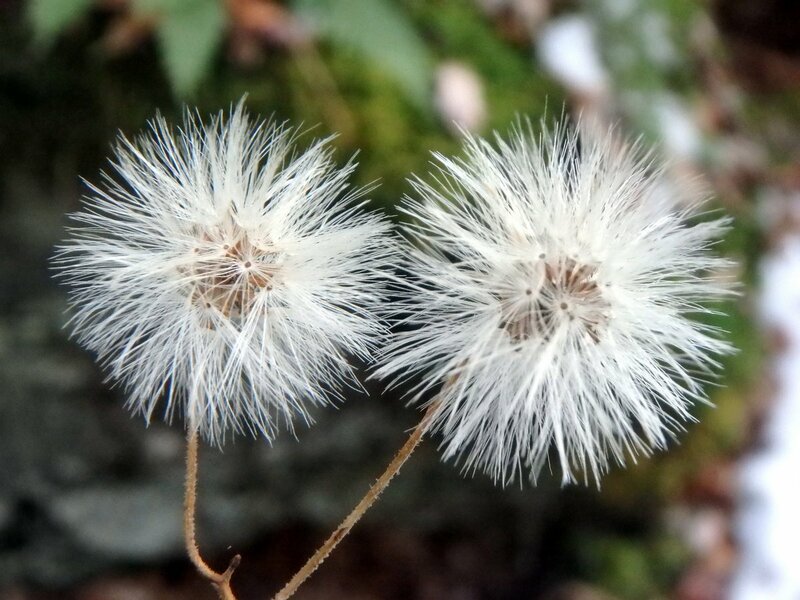 Unlike its two cousins its flowers don’t point down towards the ground but face straight out, 90 degrees to the stem. With 2 inch wide flowers it’s not a big and showy plant, but it is loved. 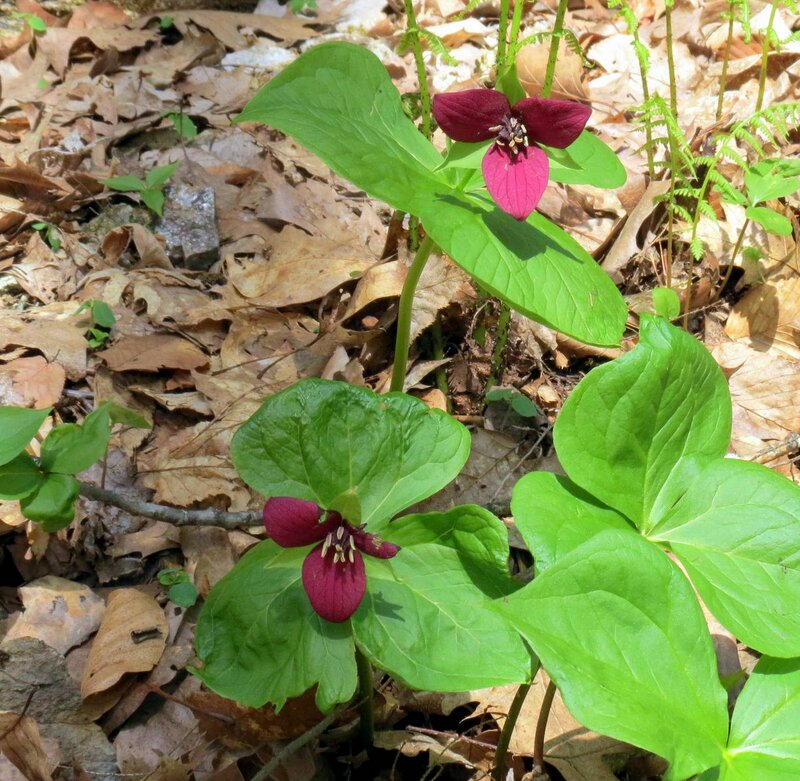 Painted trilliums grow in the cool moist forests north to Ontario and south to northern Georgia. 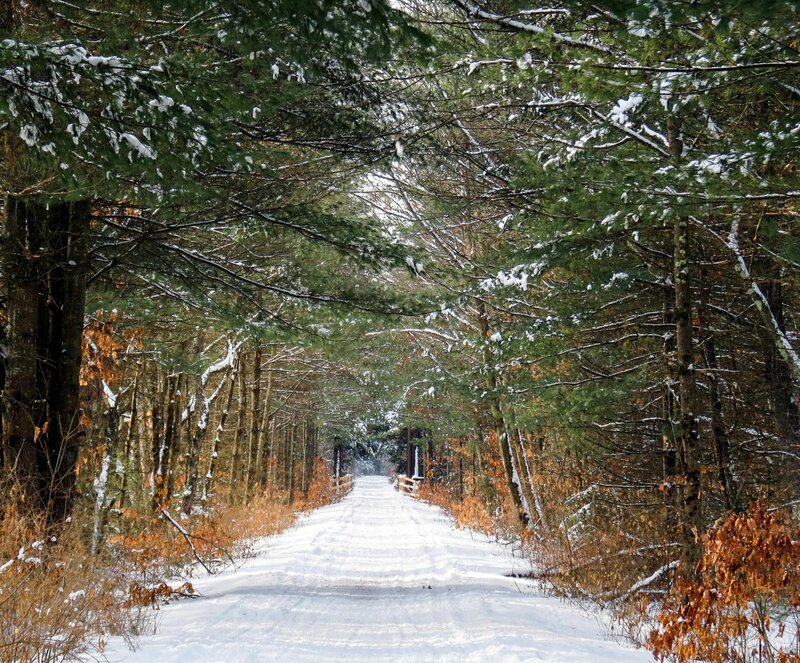 They also travel west to Michigan and east to Nova Scotia. 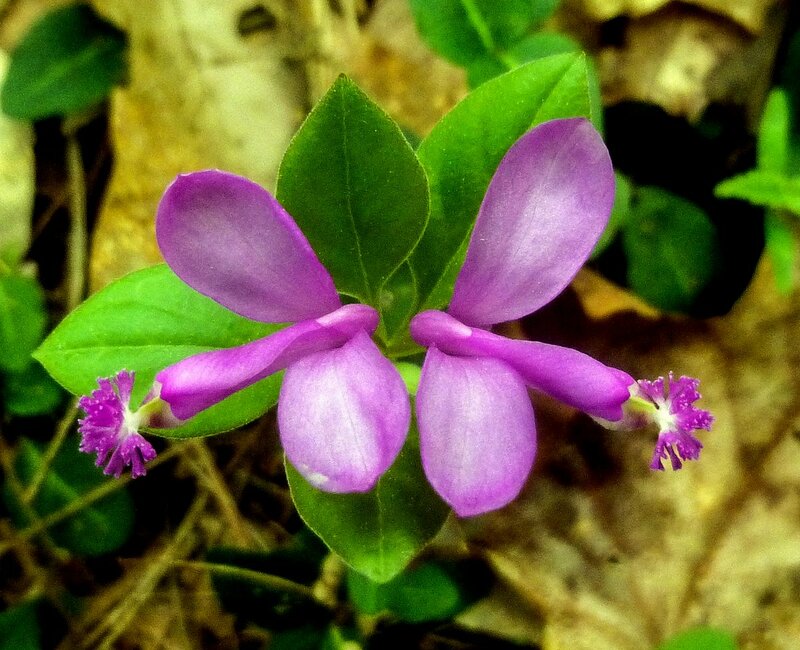 Fringed polygala (Polygala paucifolia) flowers often grow in pairs like those shown in the photo. Each blossom is made up of five sepals and two petals. 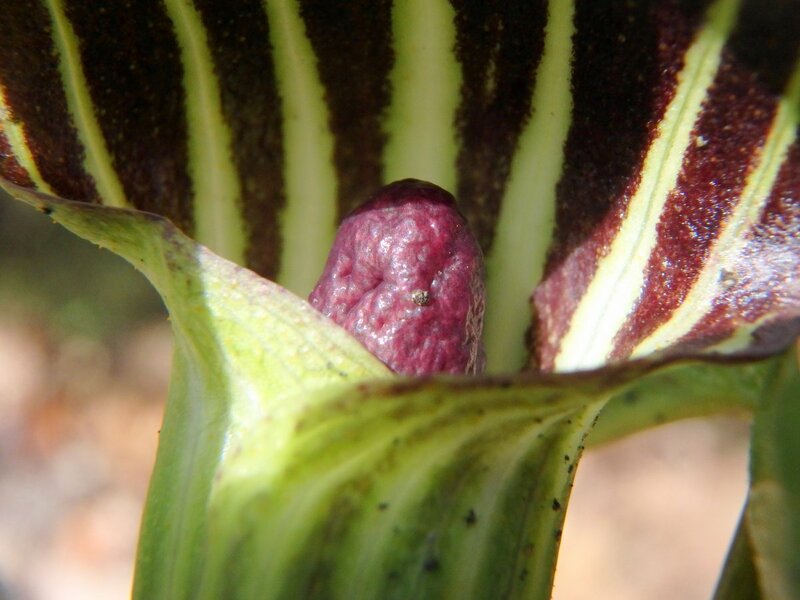 Two of the petals form a tube and two of the sepals form the “wings.” The little fringe like structure at the end of the tube is part of the third petal, which is mostly hidden. A lot has to happen for this little flower to become pollinated. When a heavy enough insect (like a bumblebee) lands on the fringed part, the third sepal drops down to create an opening so the insect can enter the tube, where it finds the flower’s reproductive parts and gets dusted with pollen. That pollination happens at all seems a bit miraculous but in case it doesn’t, this flower has insurance; there are unseen flowers underground that can self-pollinate without the help of insects. Some flowers invite you to sit and admire their beauty. Others would like you to understand them, and most can make you smile, even on cloudy days. 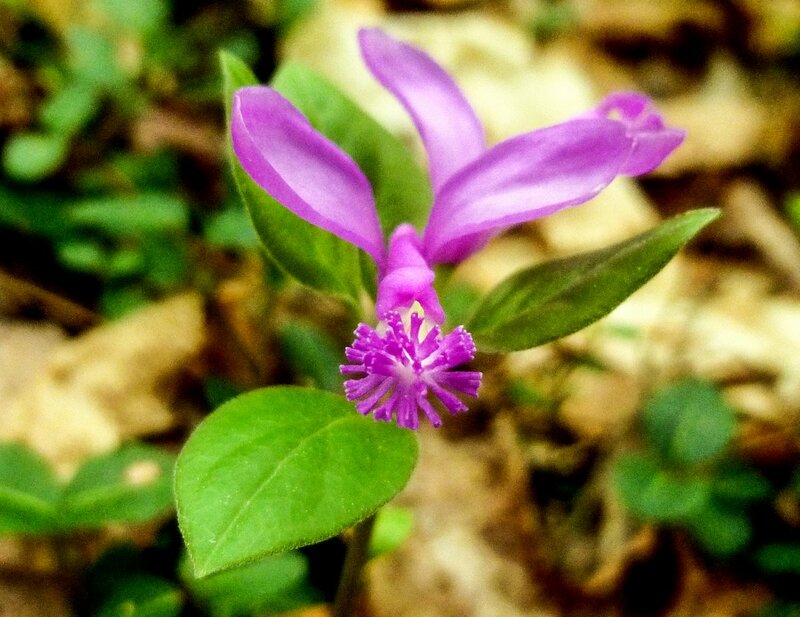 I find that all three are true of fringed polygala. 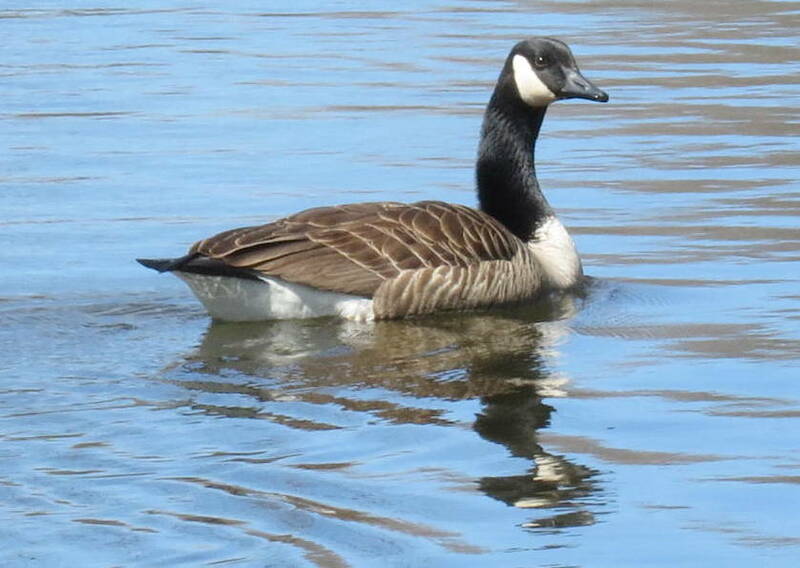 They are with us for a relatively short time so I’m always very happy to find them in spring. I just found another small colony on Thursday and getting to know them over the next few months will be a pleasure. Thanks for stopping in. I hope everyone has a safe and happy Memorial Day weekend. 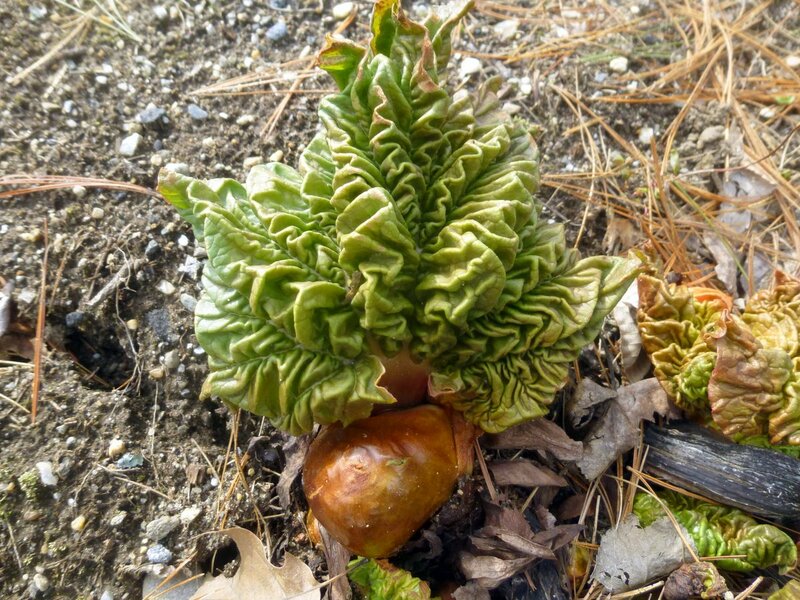 I saw a great example of bud break in this rhubarb plant. 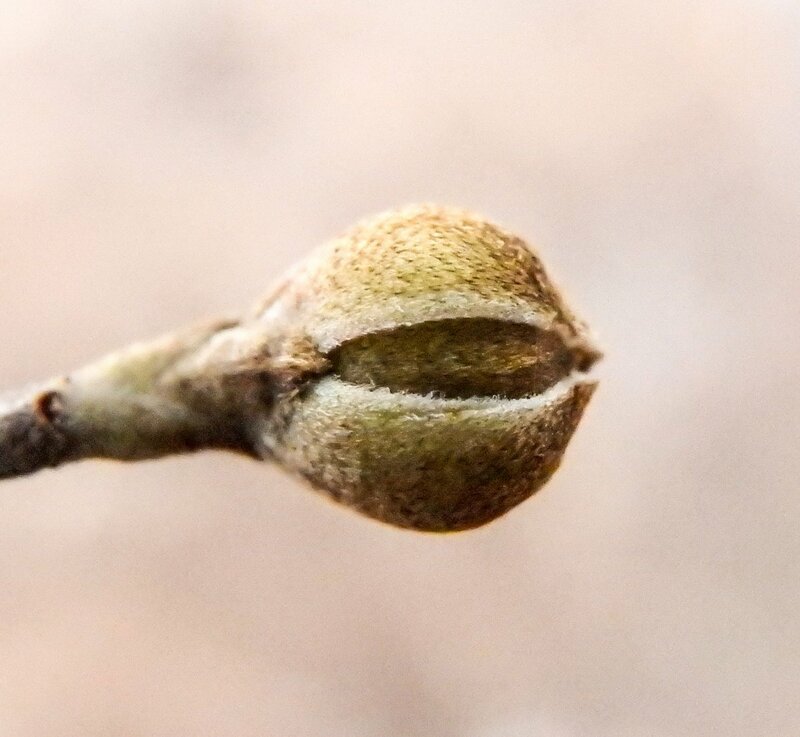 Bud break is defined as “when the green tip of a leaf can be seen emerging from the bud,” but there is often far more to it than that. I don’t know if I’ve ever seen a more crinkly leaf. 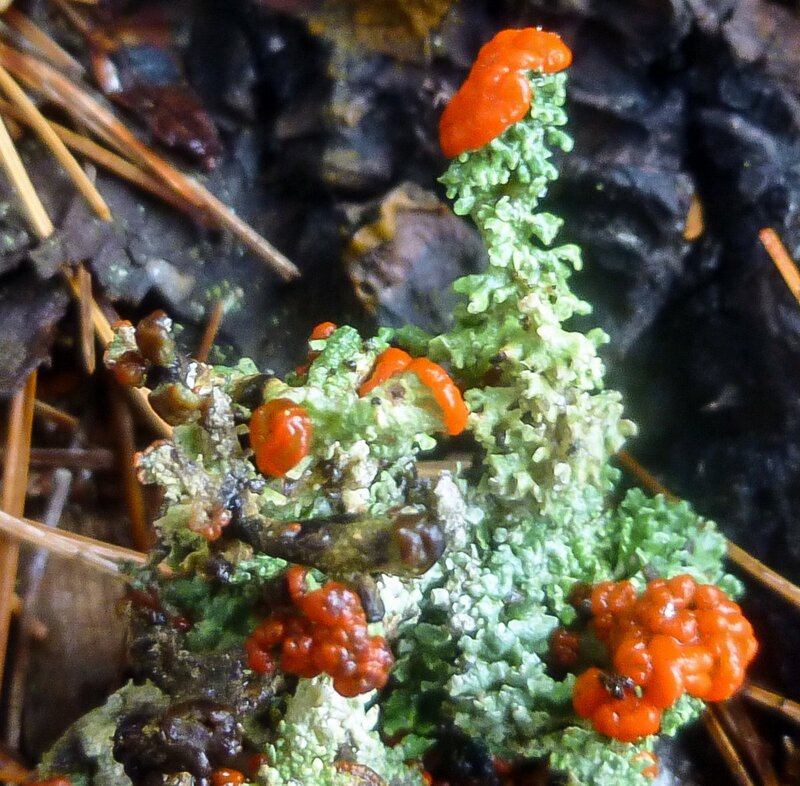 At first I thought these were British soldier lichens but something about them didn’t seem quite right. They seemed almost gritty, and that’s because they’re gritty British soldiers (Cladonia floerkeanna.) 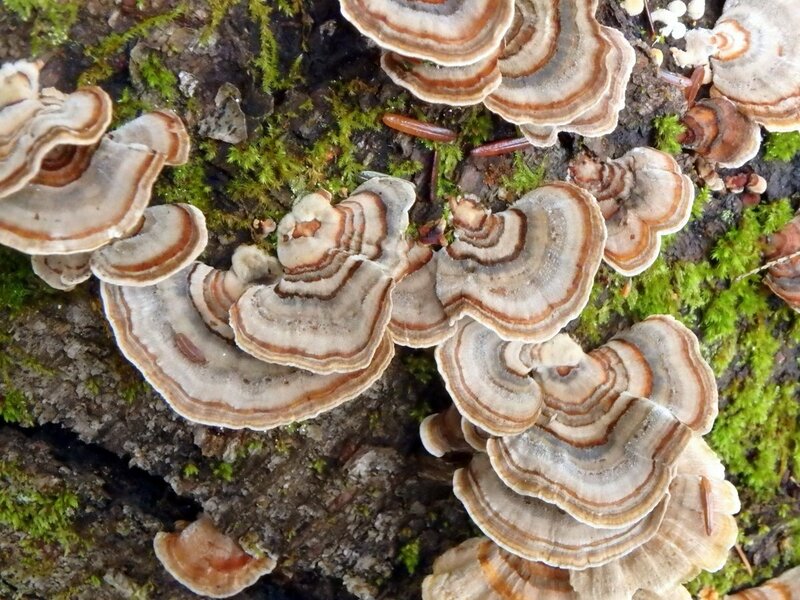 They like to grow on well-rotted wood or soil and I found this example on very old wood. 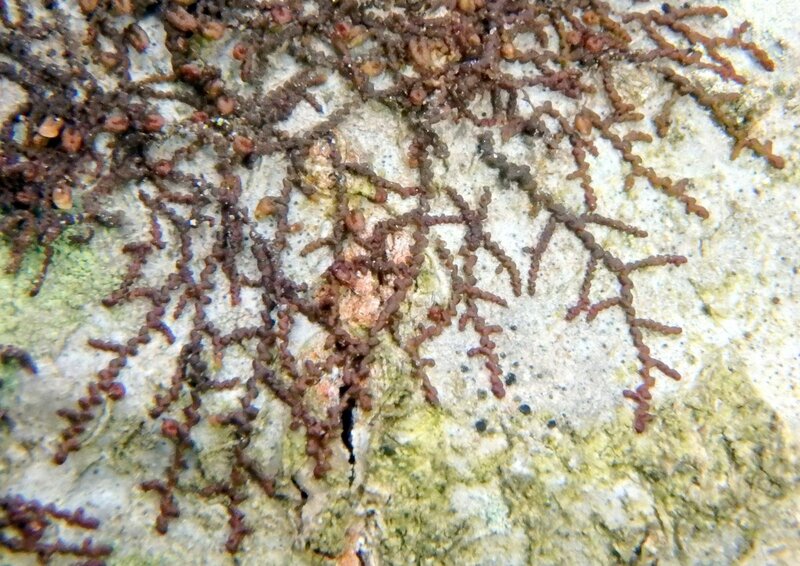 The stems are covered with granules and squamules, which are lobed, scale like growths on the body of a lichen. 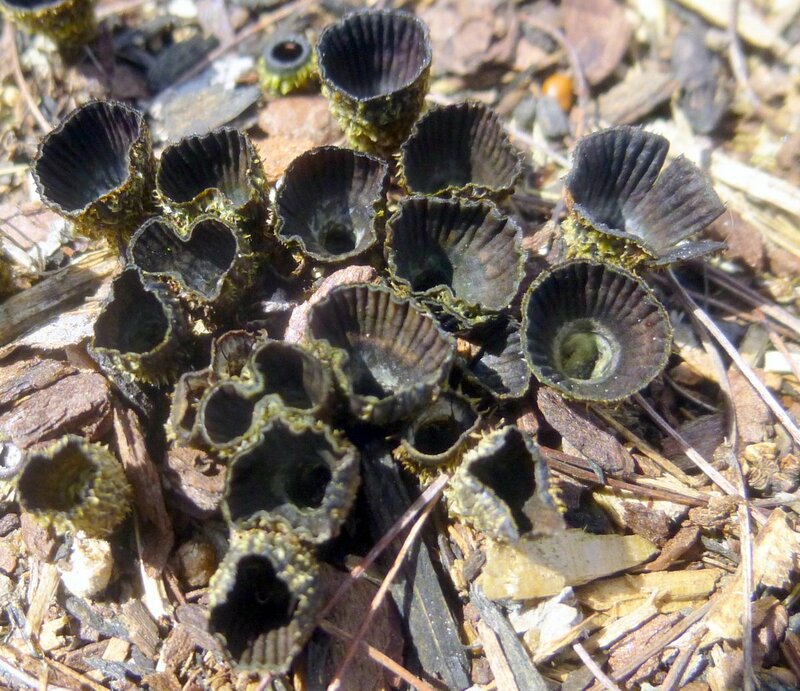 Fluted bird’s nest fungi (Cyathus striatus) grew in the mulch at a local park. 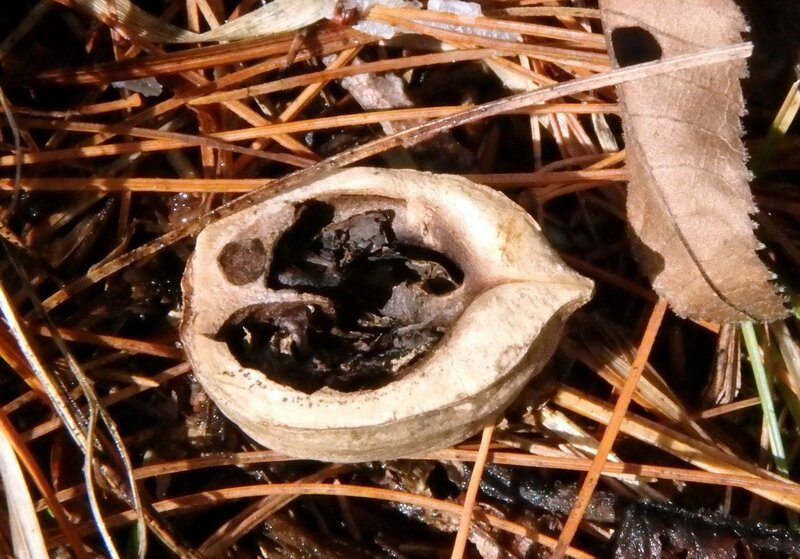 The tiny funnel shaped nests are the spore producing fruiting bodies of this fungus and are called peridia. Their shape makes them splash cups and when a raindrop falls into one it splashes out the eggs (peridioles), which contain the spores. Unfortunately the eggs had already been splashed out of these examples, but I’m hoping they might produce another crop. 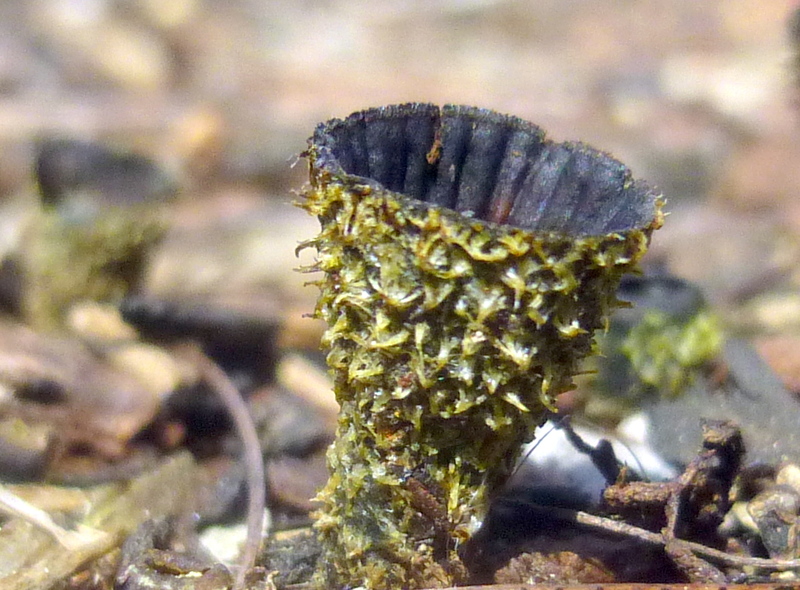 This view of the bird’s nest fungus shows the funnel shape and inside flutes. 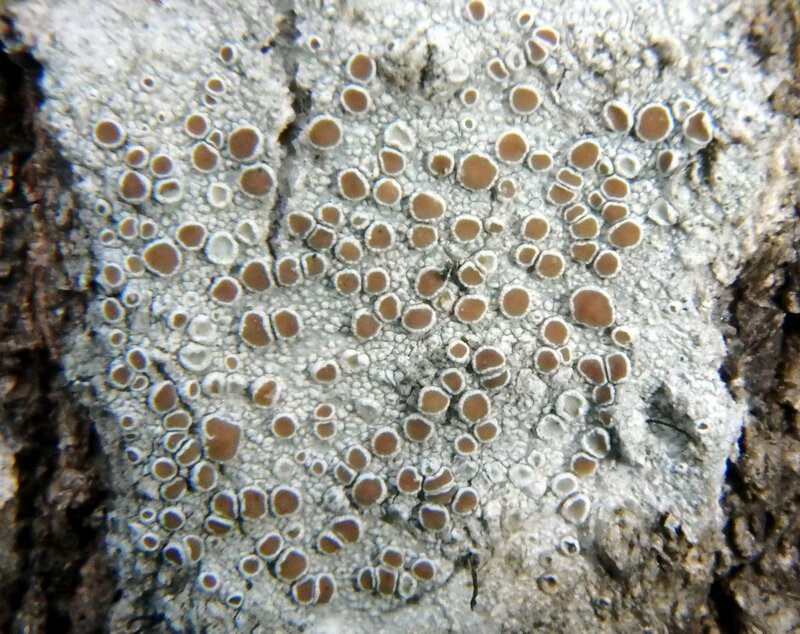 The flutes on the inside and brown hairs on the outside are identifying features. Each one is about .39 inches (1 cm) tall. 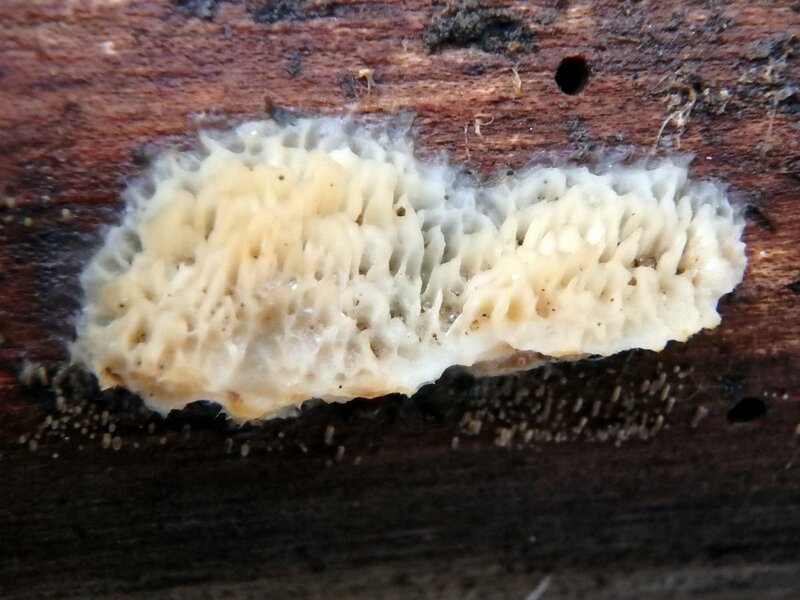 They are very hard to spot since they are so small and essentially the same color as the wood that they grow on, and this is only the second time that I’ve ever seen them. 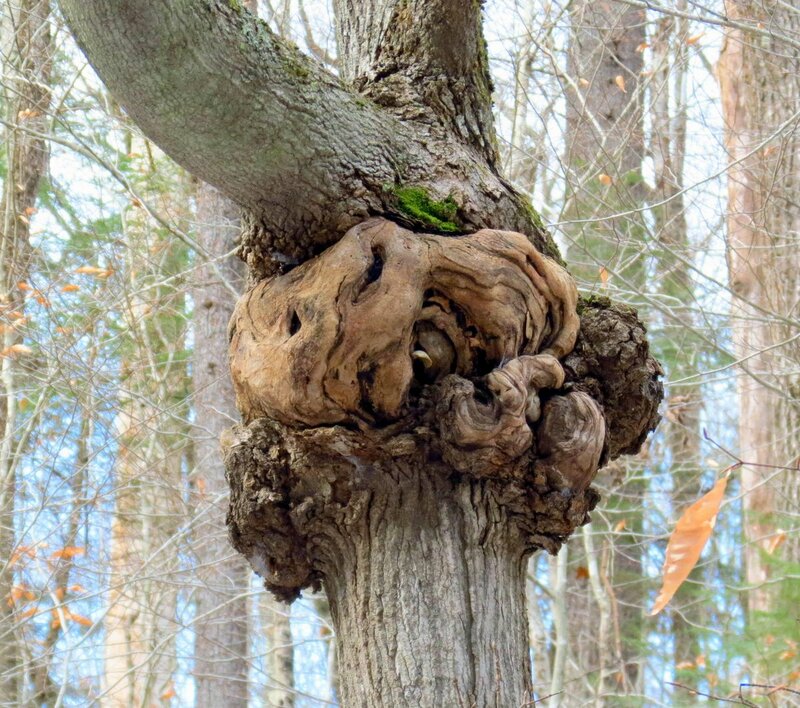 They felt quite tough and almost woody. Even though I was sitting in my truck taking photos through the windshield this great blue heron was determined to keep as many cattails between us as he could. 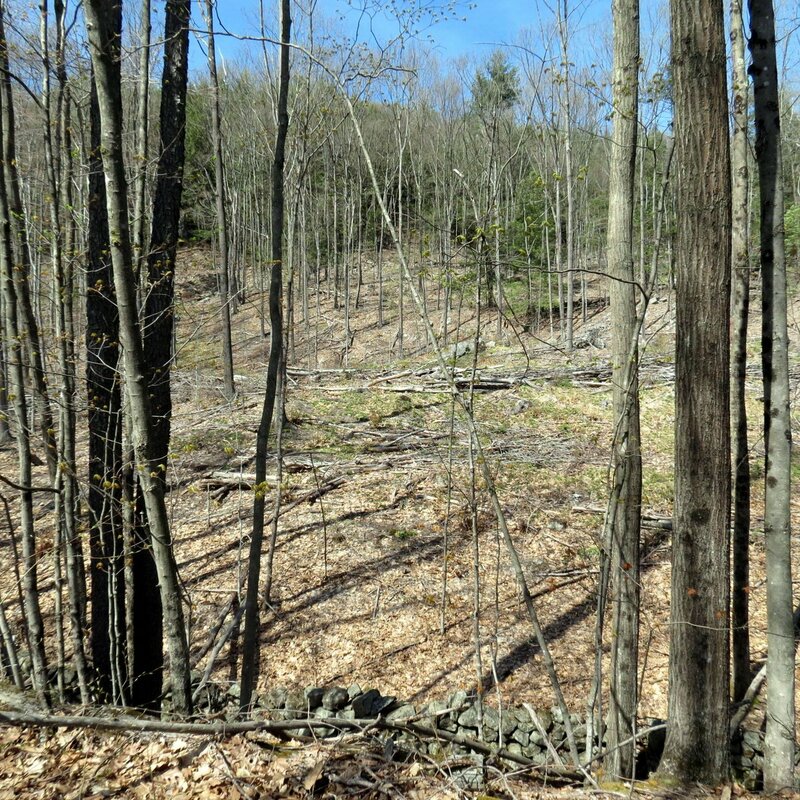 Then just for a few seconds he stepped out into the open to catch a spring peeper and was caught in the above photo. 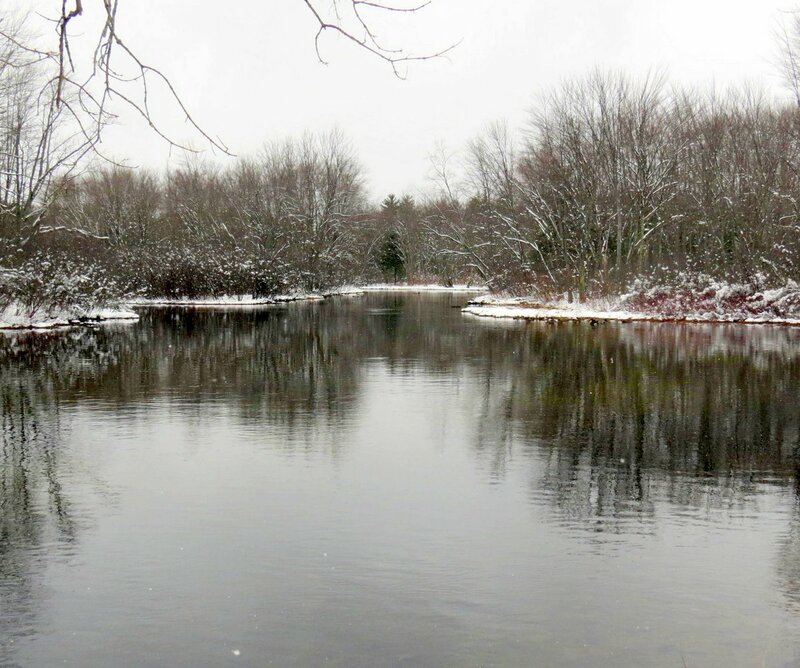 The small pond is full of spring peepers and he was doing his best to clean it up. He caught a few while I watched but I couldn’t catch the action with the camera. 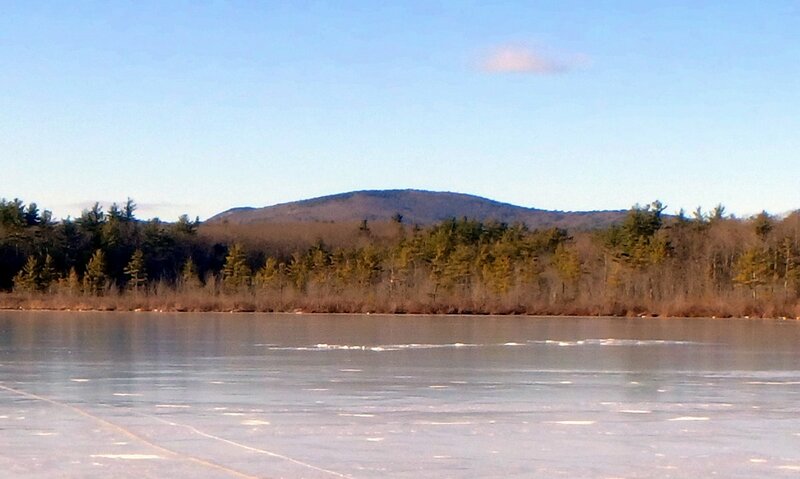 The pond also has some big snapping turtles in it but I don’t know if they’d bother a bird this big. 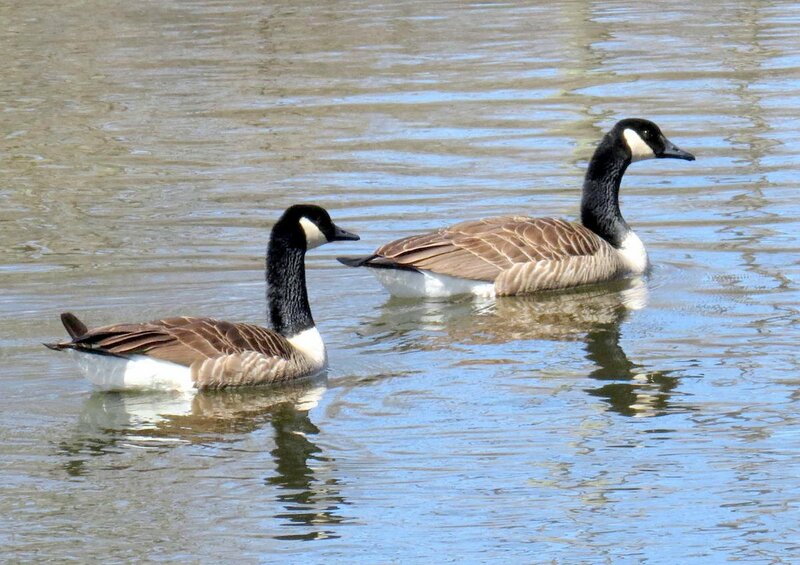 Along the Ashuelot river the Canada geese came as close to shore as I’ve ever seen. 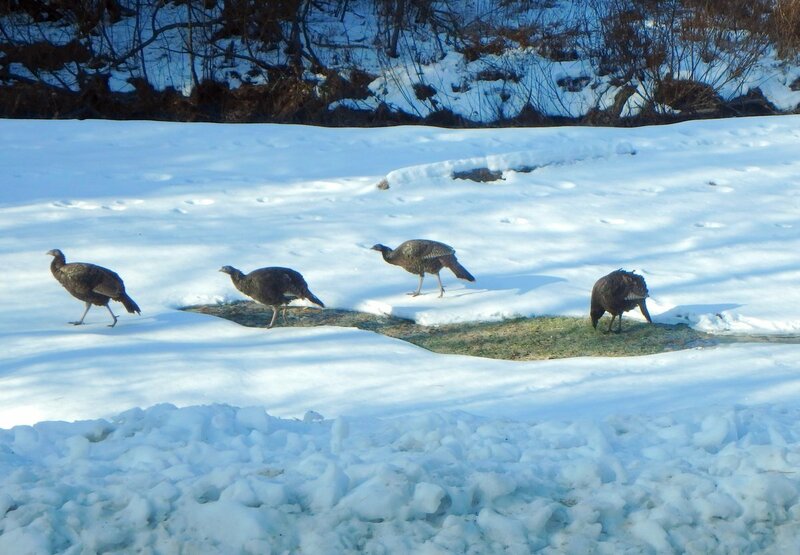 Normally they stay well out in the middle but on this day for some reason they had no fear. 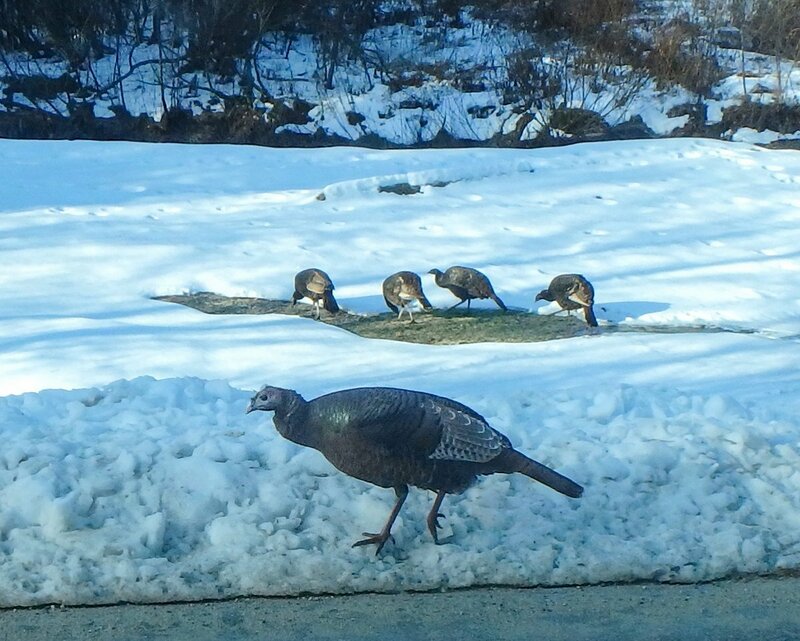 They were also very quiet and didn’t honk once the entire time I was there, which is also unusual. They’re usually quite loud. 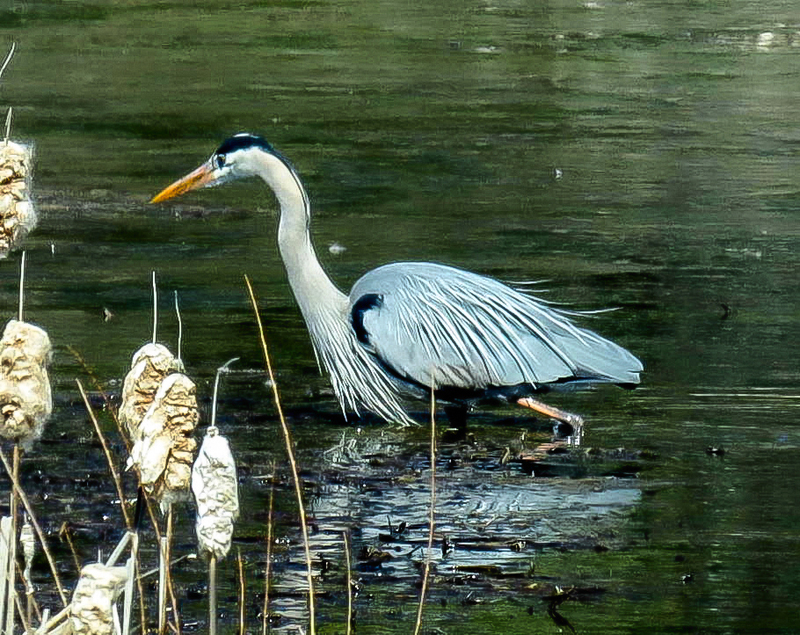 This one kept a wary eye on me as if wondering just what I was up to. Or it could have been that he was hoping for a few crumbs of bread, but I didn’t have any. 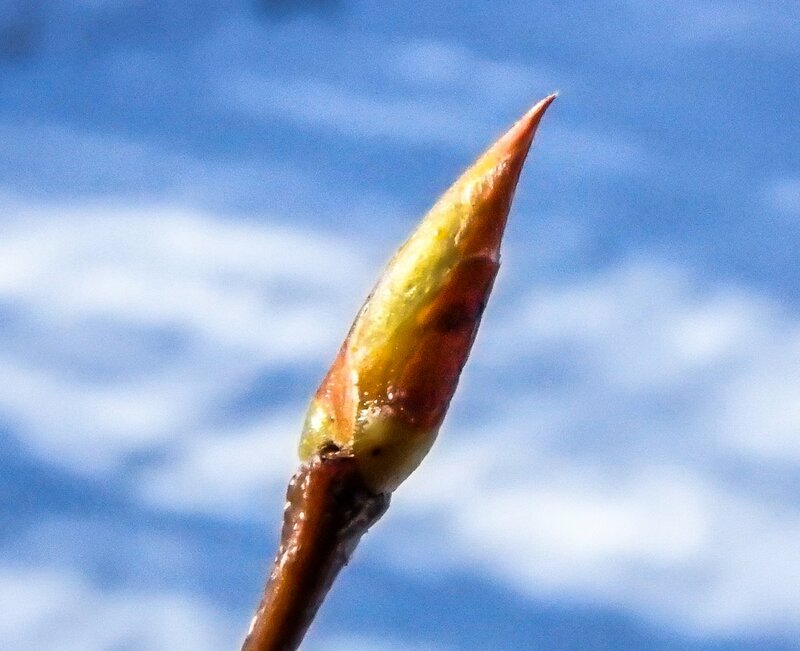 The buds of striped maples (Acer pensylvanicum) have just started to break. These are among the most beautiful buds in the forest, covered in soft down which is sometimes orange and sometimes pink, and often both together. They are worth looking for, and now is the time. 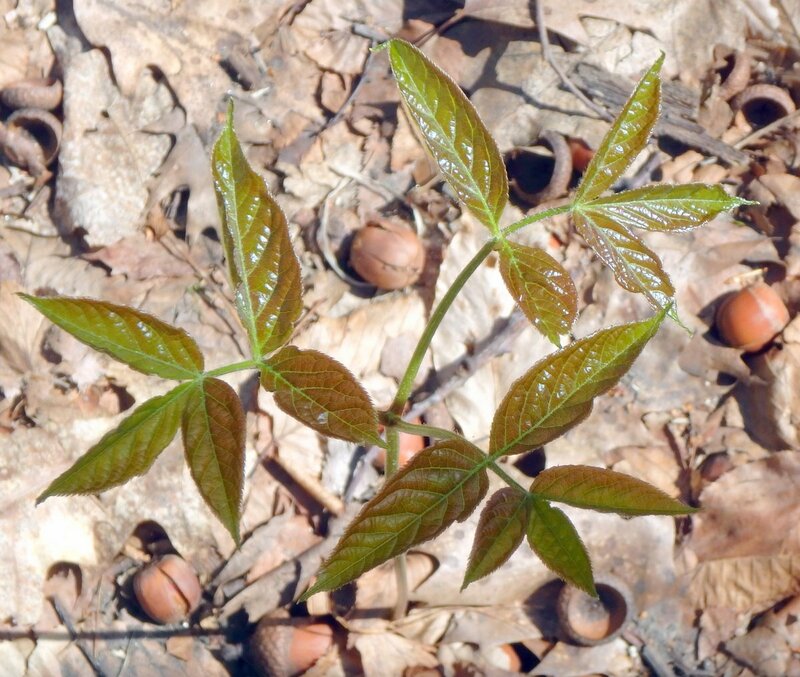 Soon two other beautiful leaf bids will open; beech and shagbark hickory. Those are events I never miss. 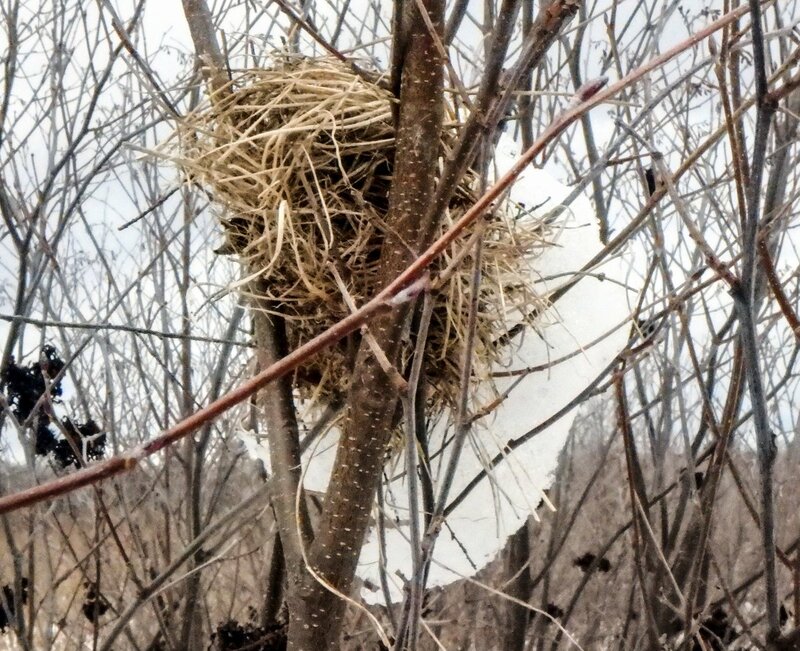 I’m guessing that this tree is a woodpecker’s equivalent to the corner convenience store. 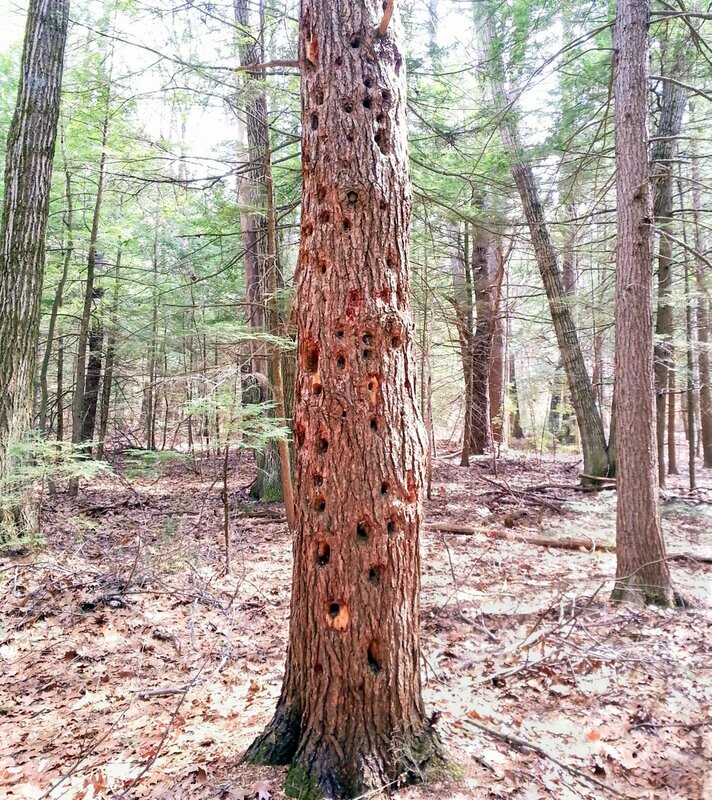 I’ve never seen a tree so full of holes, and they went all the way up the trunk. It must be full of insects. You might think I’m straying far from the forest when you see this coin but since it was found in the forest I’m really not straying far. I show it here for the history buffs out there and because it’s a very important coin; the first official copper one cent piece ever minted in the Colonial United States. It was designed by Benjamin Franklin and is called the Fugio cent because of its image of the sun shining down on a sundial in the center with the word “Fugio” on the left. Fugio is Latin for “I flee / fly,” which when shown with the sundial reminds the bearer that time flies. On the right is the date 1787 and at the bottom are the words “Mind Your Business.” A coworker found it near an old cellar hole in the woods. To hold something over 200 years old that Benjamin Franklin had a hand in was a rare treat. 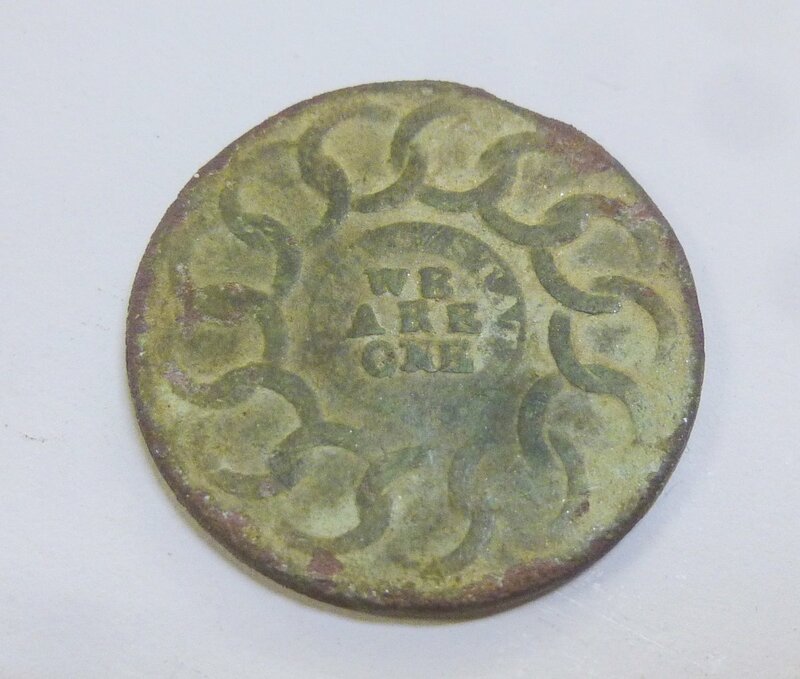 The reverse side of the coin has the words “We Are One” in the center, surrounded by the words “United States.” A chain with 13 links symbolizes the 13 original states. 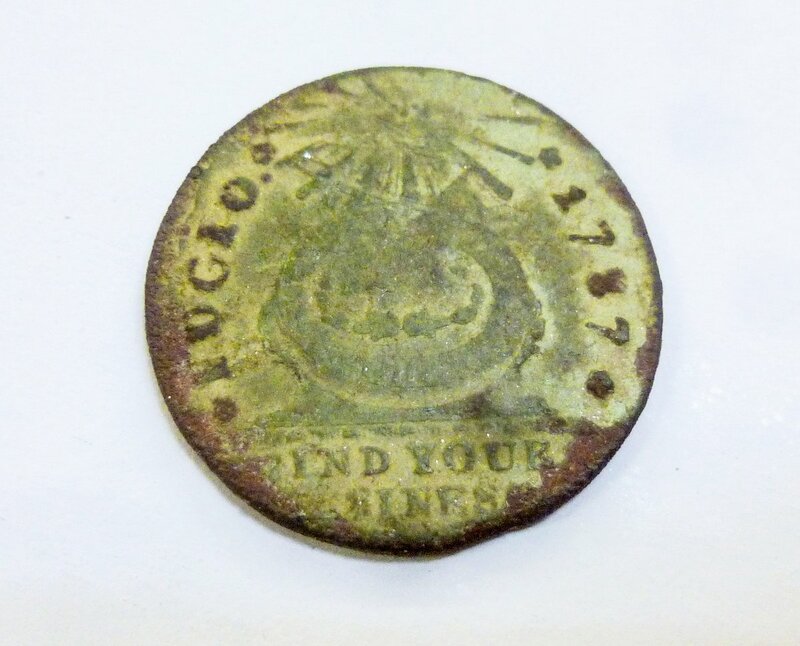 I wonder how much it must have hurt to lose this coin in 1787. At about the diameter of a Kennedy half dollar (1.2 inches) it is large for a cent. 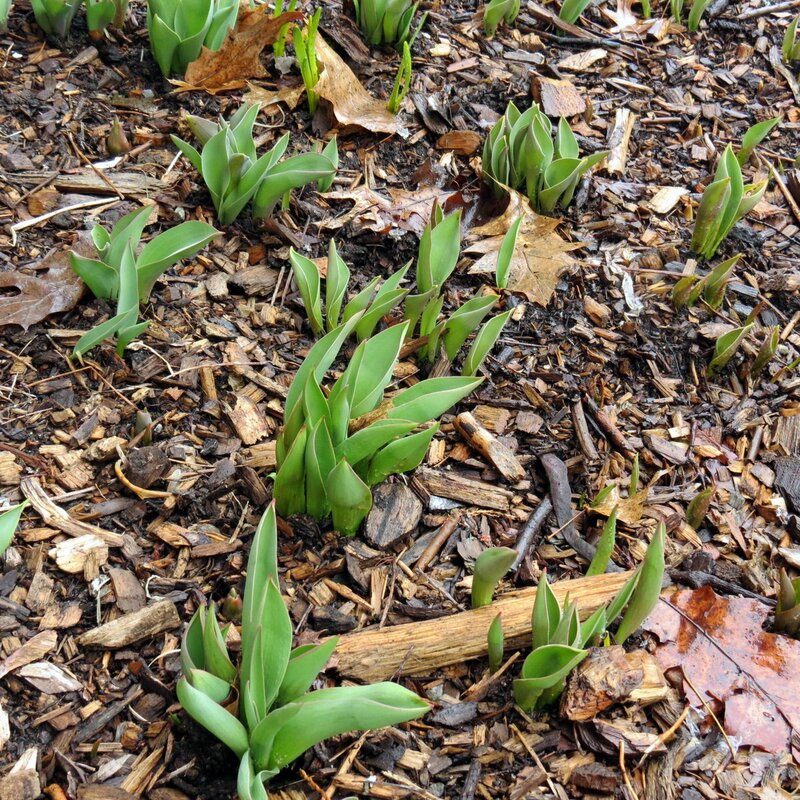 Ramps (Allium tricoccum) are up and growing fast. 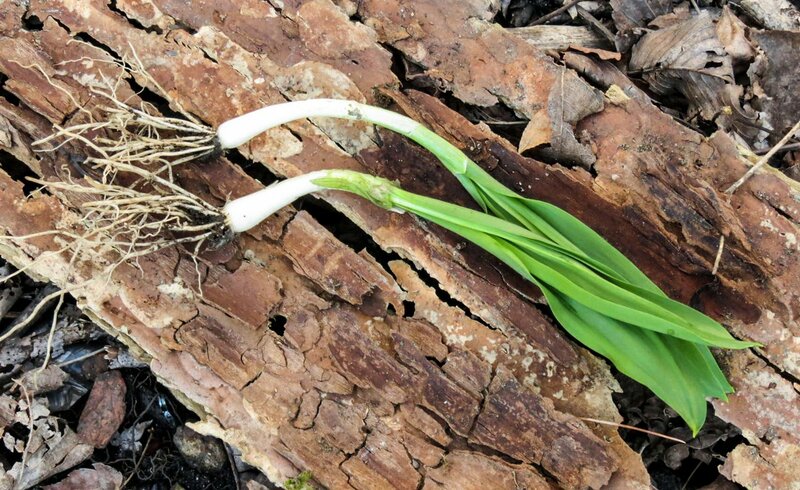 These wild leeks look like scallions and taste somewhere between an onion and garlic. They are a favorite spring vegetable from Quebec to Tennessee, and ramp festivals are held in almost all states on the U.S. east coast and many other countries in the world. Unfortunately they are slow growers and a ten percent harvest of a colony can take ten years to grow back. They take up to 18 months to germinate from seed, and five to seven years to mature enough to harvest. 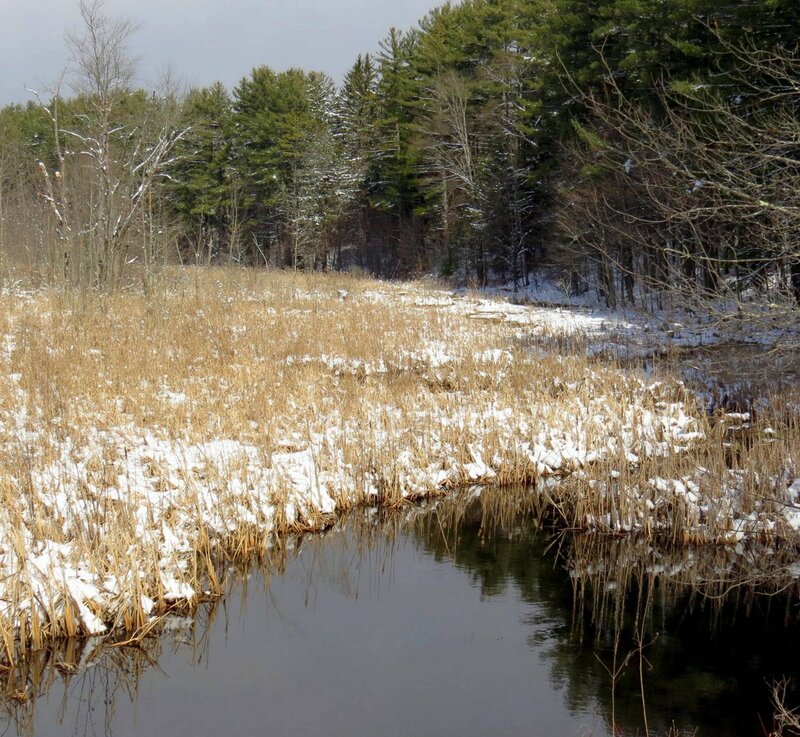 That’s why ramp harvesting has been banned in many national and state parks and in pats of Canada, and why Ramp farming is now being promoted by the United States Department of Agriculture. This is what the complete ramp looks like. I foolishly pulled these two plants three years ago before I knew they were being threatened. 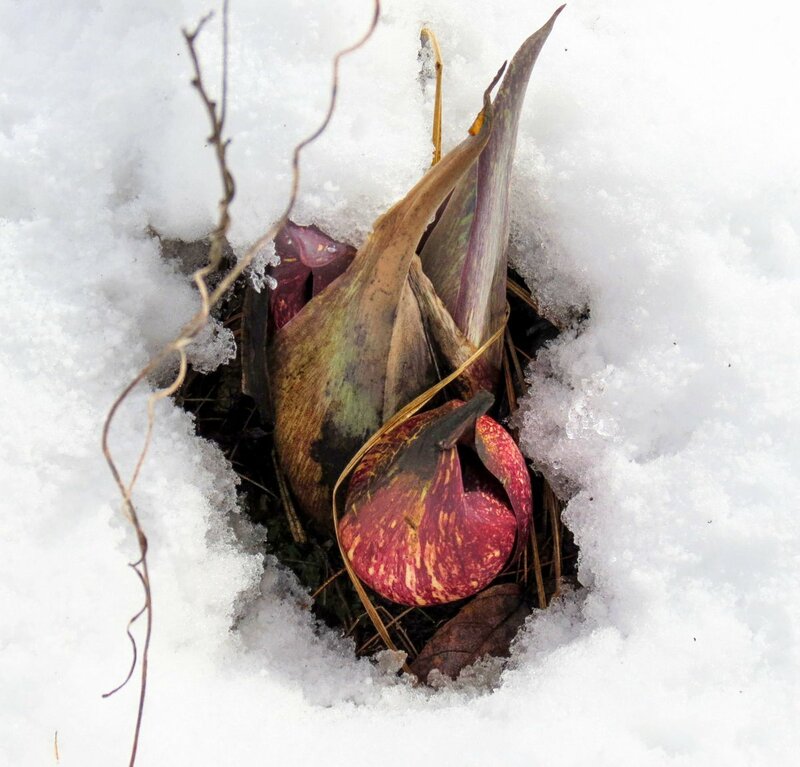 The bulbs and leaves are said to be very strongly flavored with a pungent odor. 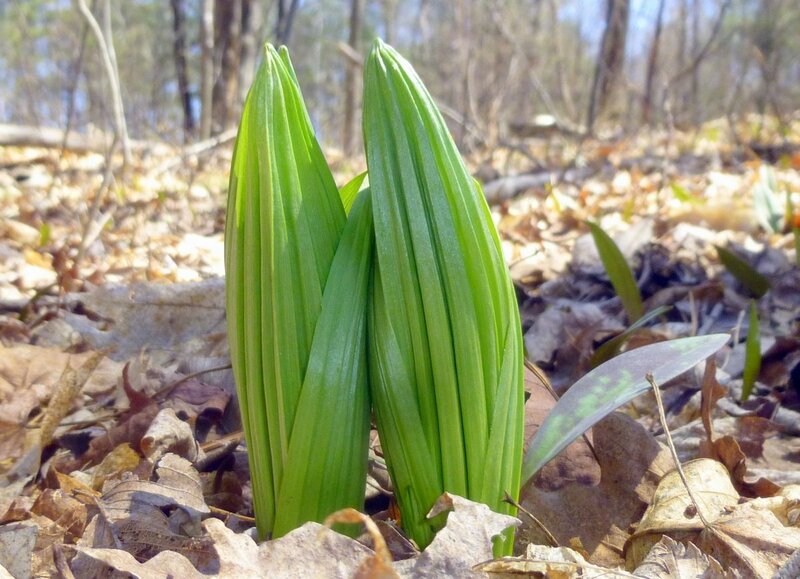 In some places they are called “The king of stink.” The name ramps comes from the English word ramson, which is a common name of the European bear leek (Allium ursinum), which is a cousin of the North American wild leek. Their usage has been recorded throughout history starting with the ancient Egyptians. They were an important food for Native Americans and later for white settlers as well. False hellebores (Veratrum viride) grow close to the ramps and woe be to the forager who confuses them. 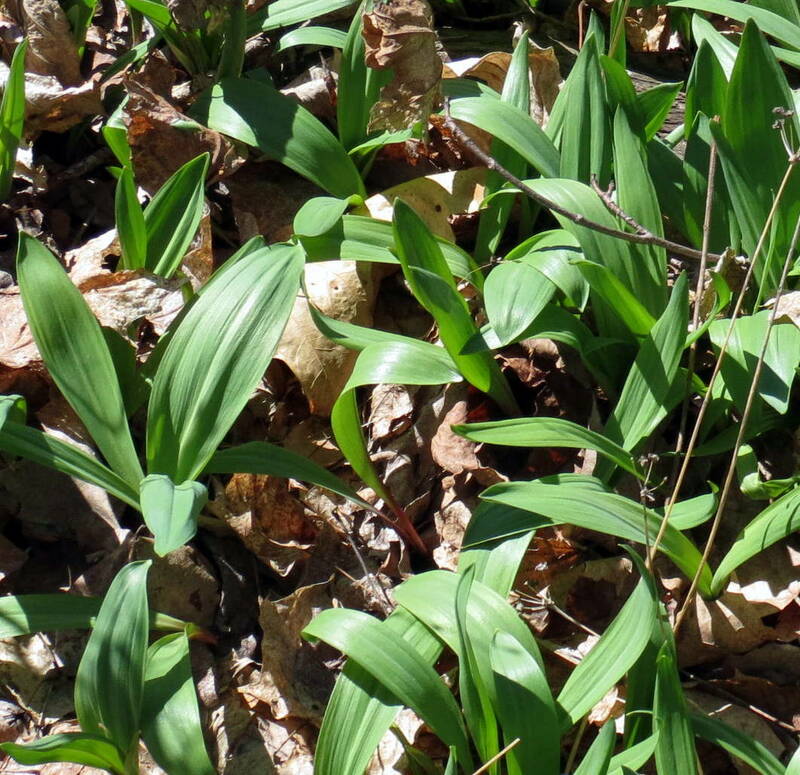 Though all parts of ramps are edible false hellebore is one of the most toxic plants in the New England forest, so it would be wise to know both well before foraging for ramps. 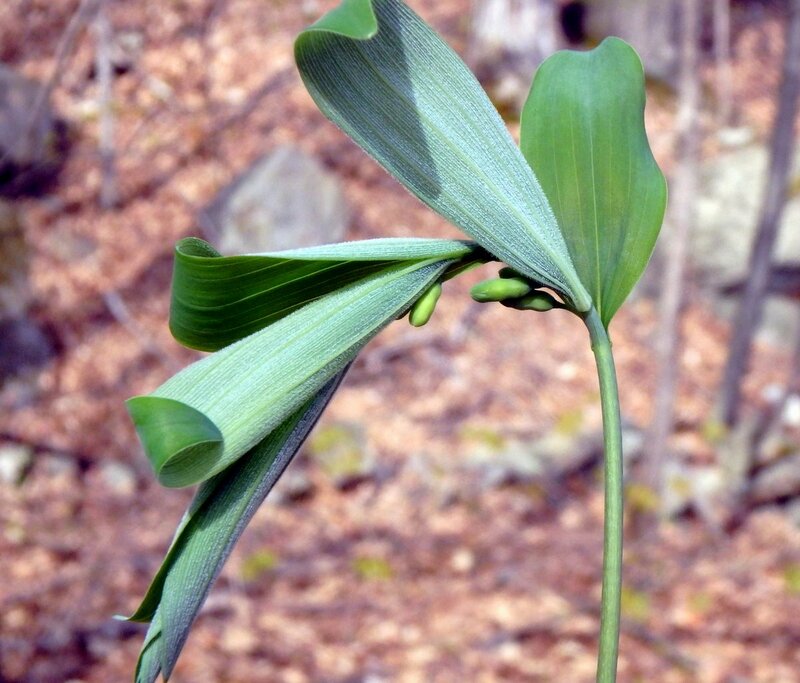 One clue would be the deeply pleated leaves of the false hellebore, which look nothing like ramp leaves. Second would be the color; ramps are a much deeper green. 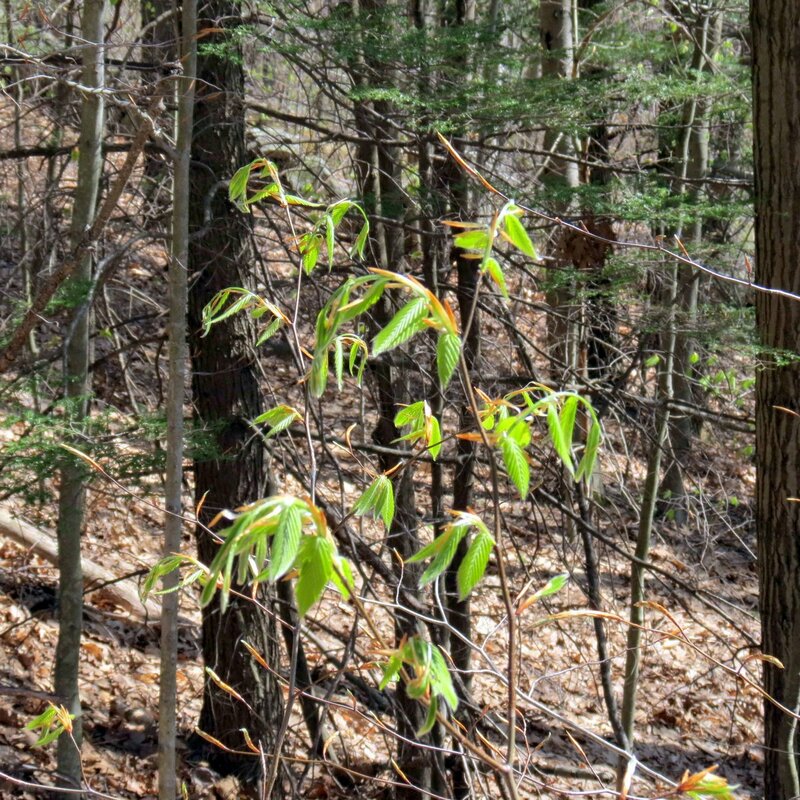 Third would be size; everything about false hellebore is bigger, including leaf size. The final clue would be the roots. 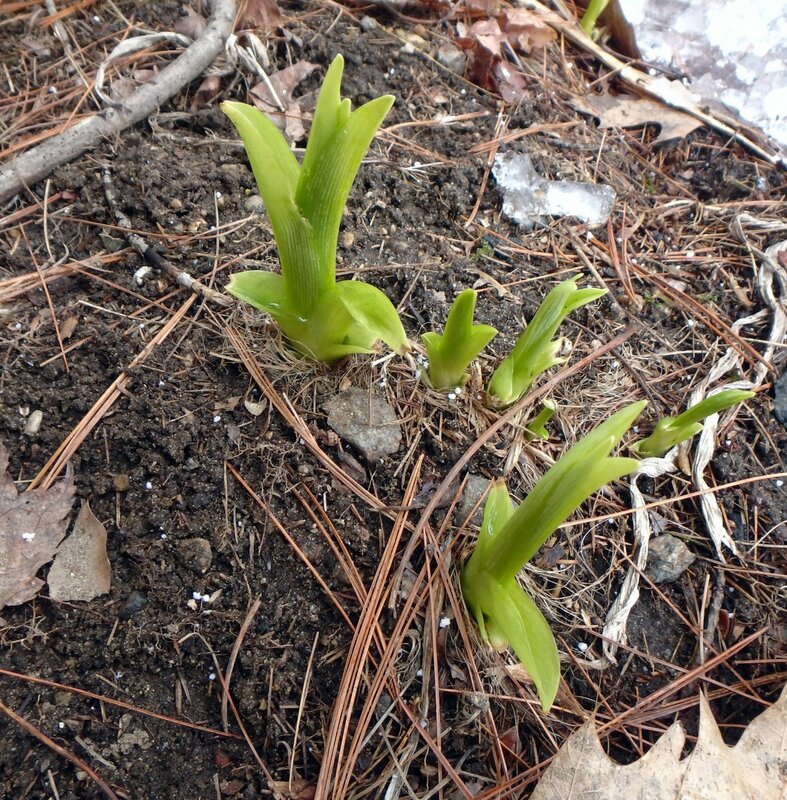 False hellebore roots are tough and fibrous and don’t look at all like the bulbous, scallion like root of ramps. I’m really surprised that anyone could confuse the two, but apparently it does happen. 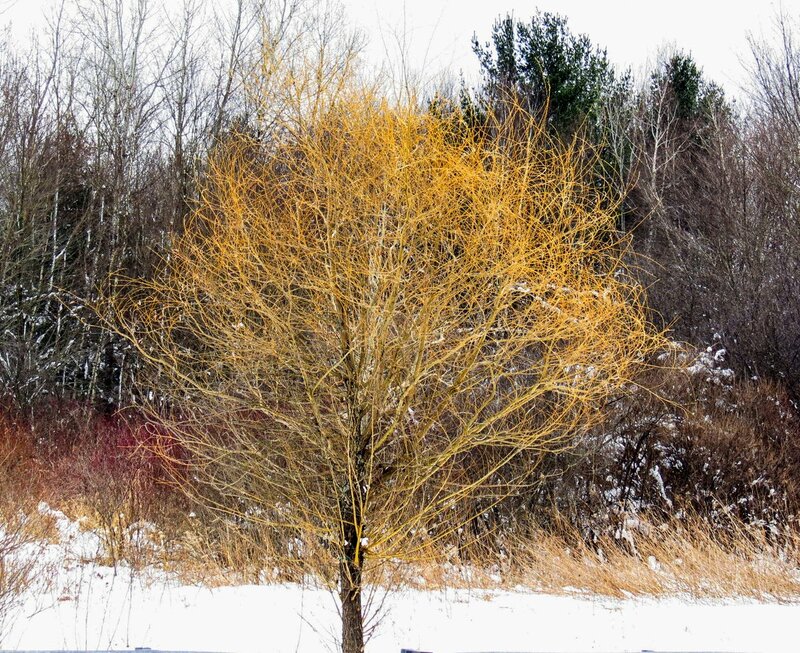 I don’t know if I’ve ever seen a willow more colorful than this one was. 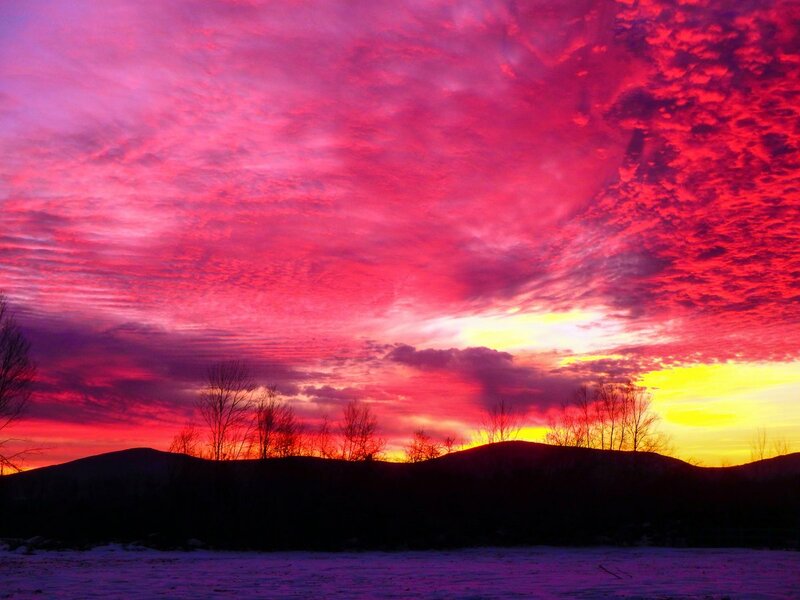 A kind of orange red, I think. 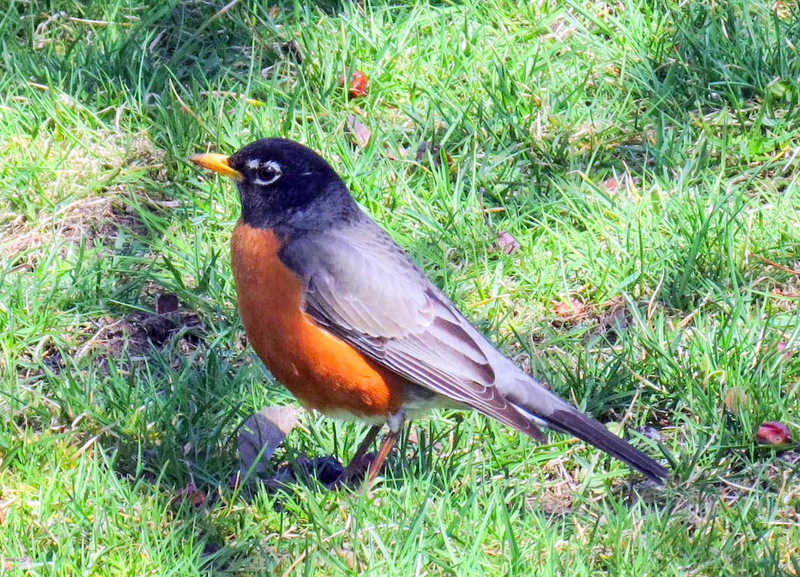 This robin watched me watch him. 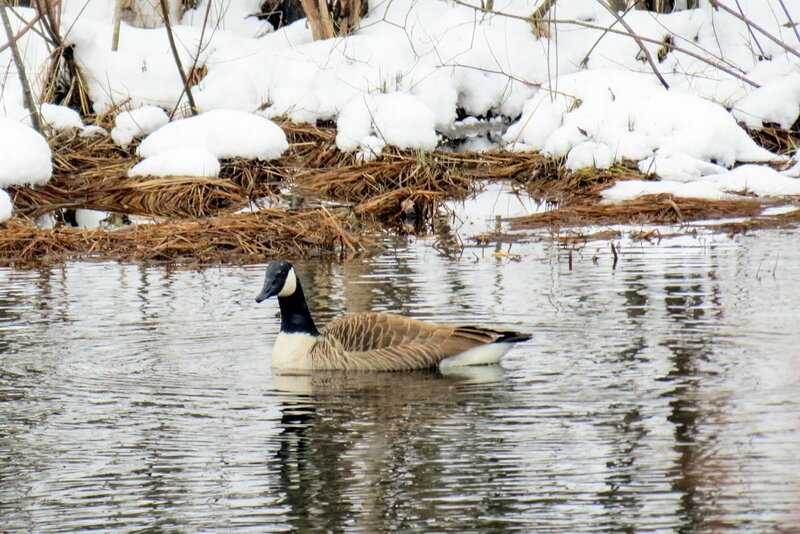 He was only about two feet away and just sat quietly while I took his photo. I said thank you and told him that his photo would be seen all around the world. He didn’t seem at all impressed and went back to seeing what he could find to eat.